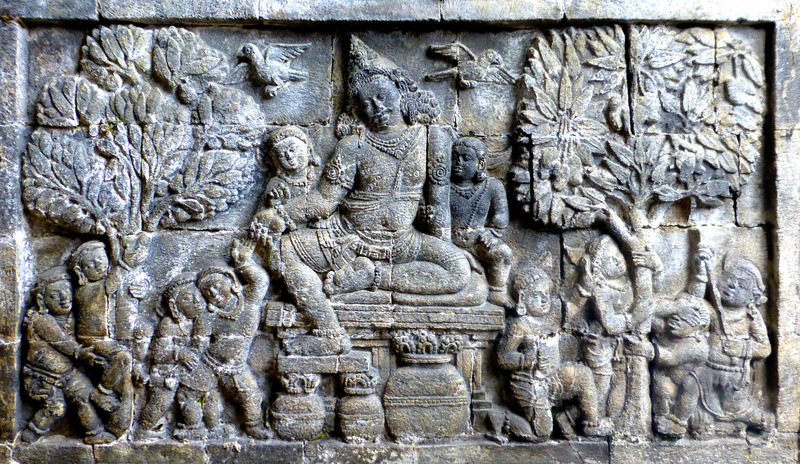 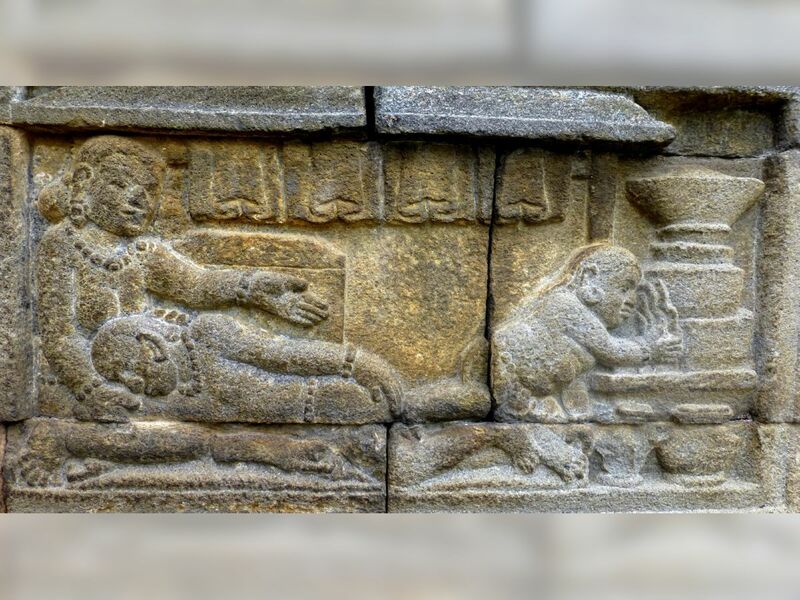 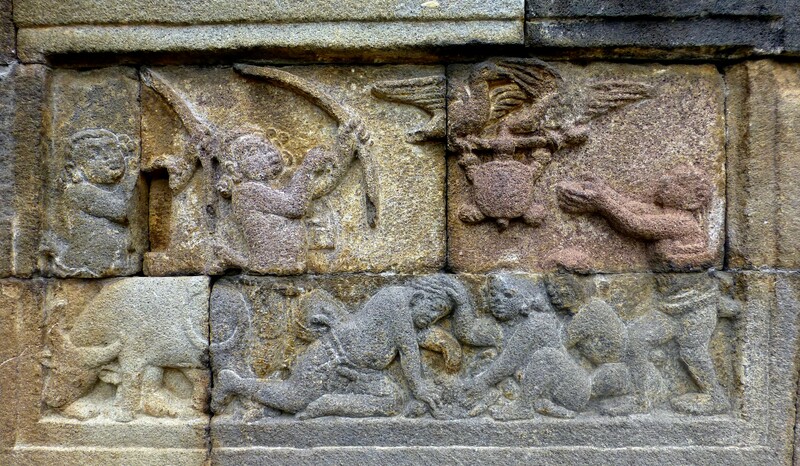 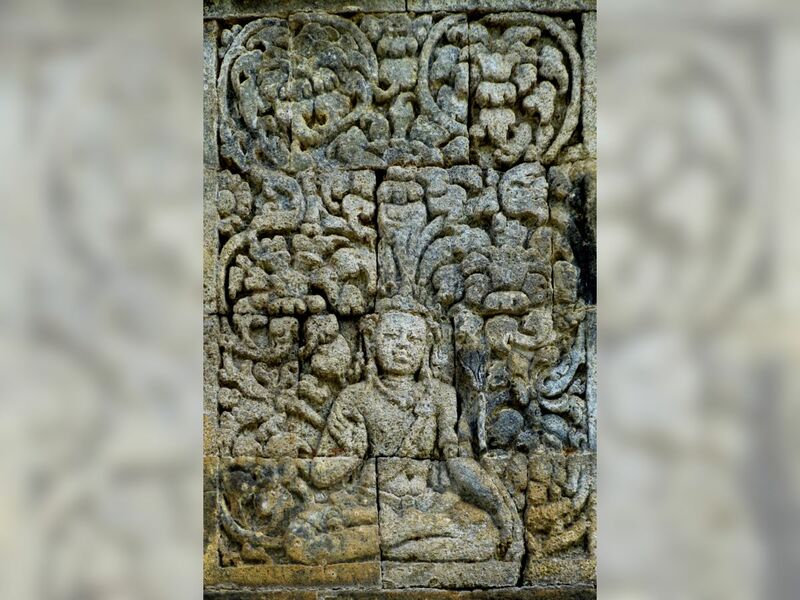 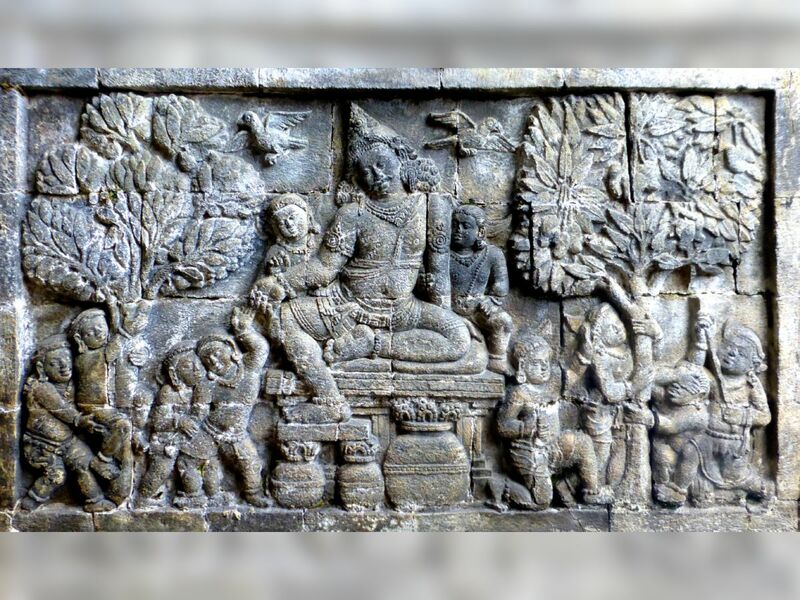 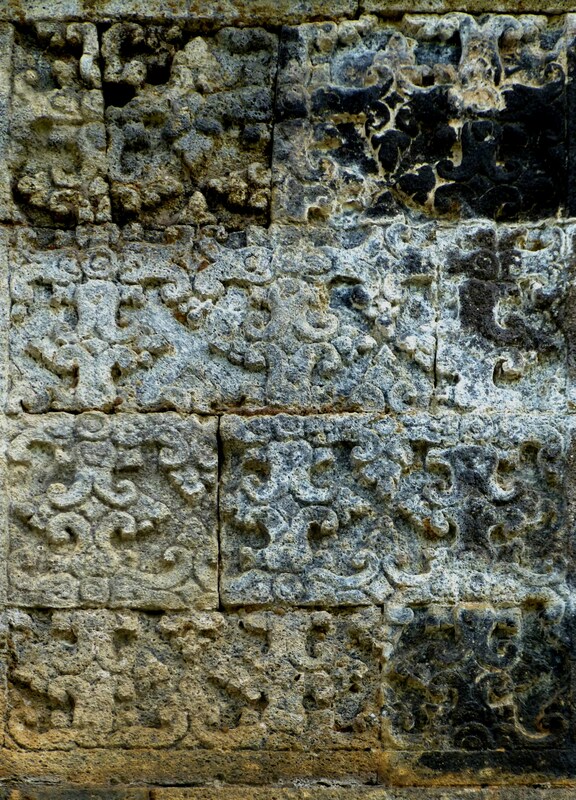 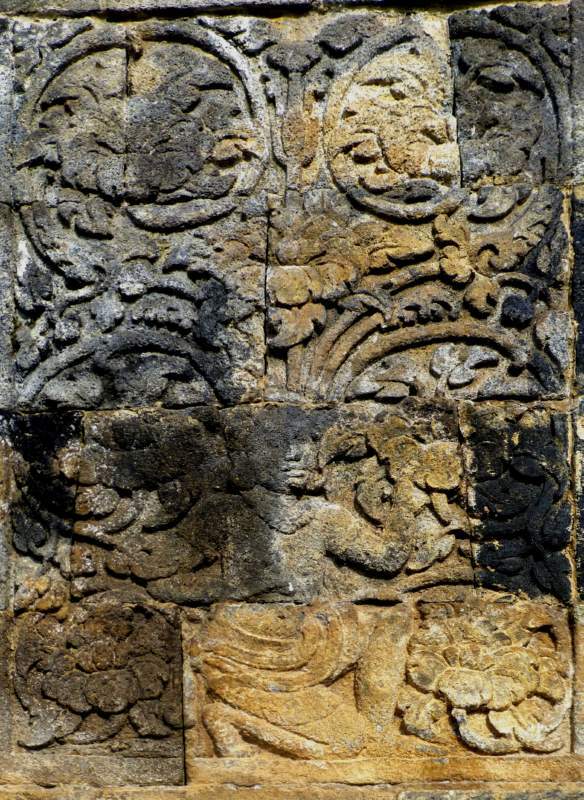 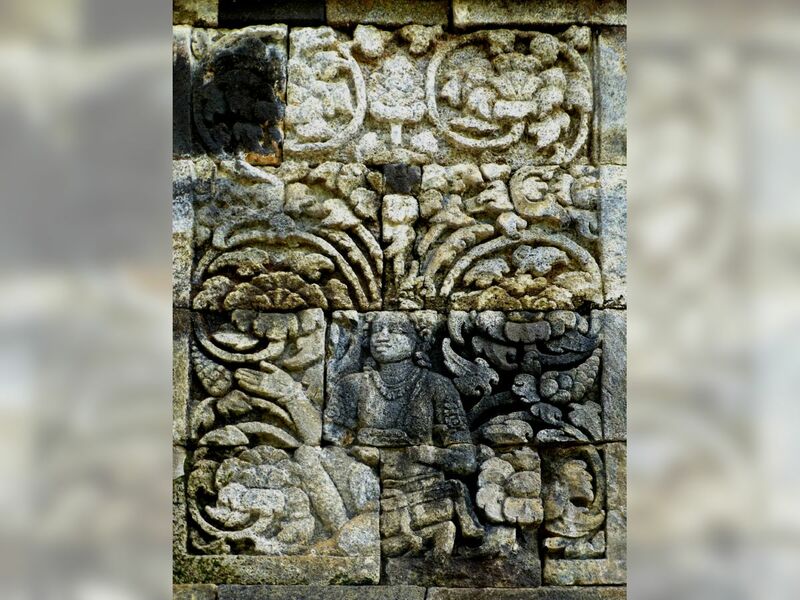 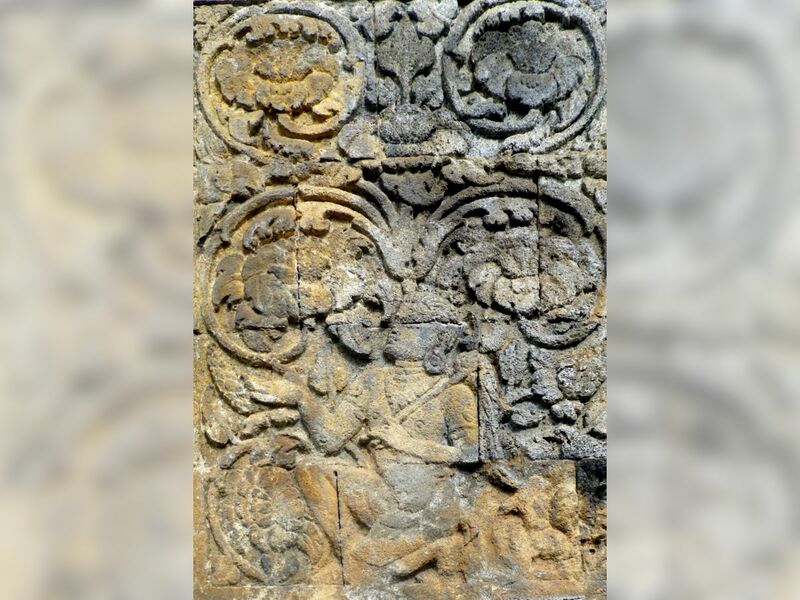 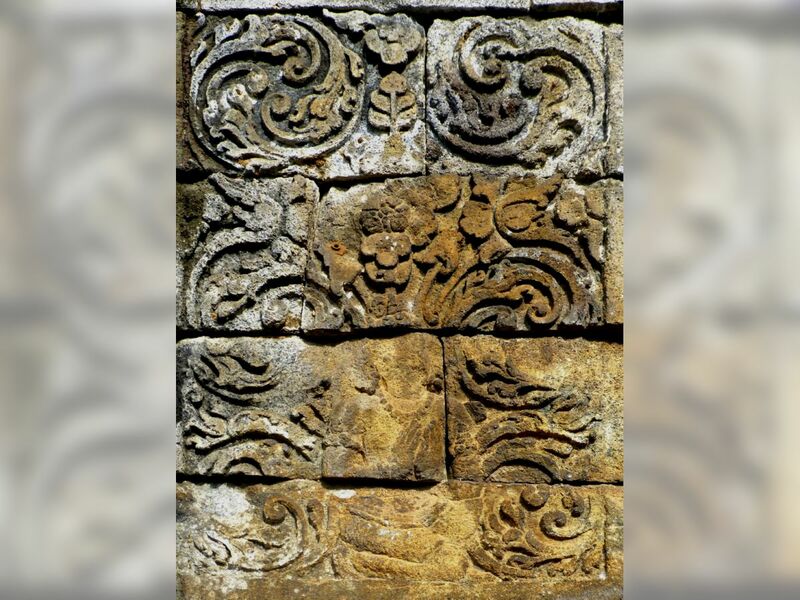 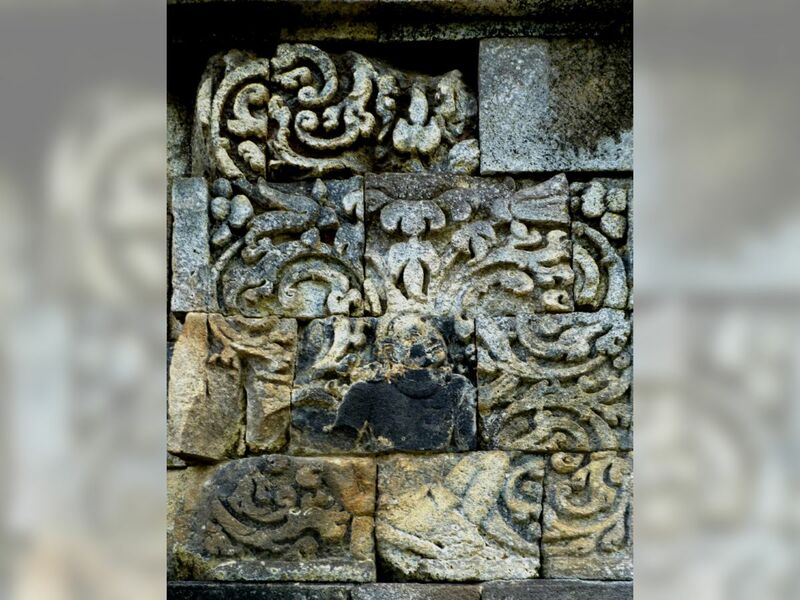 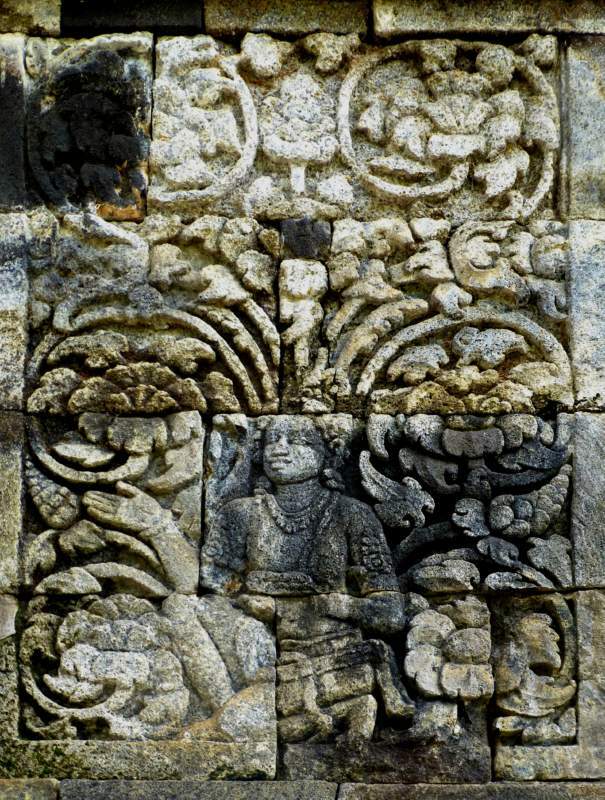 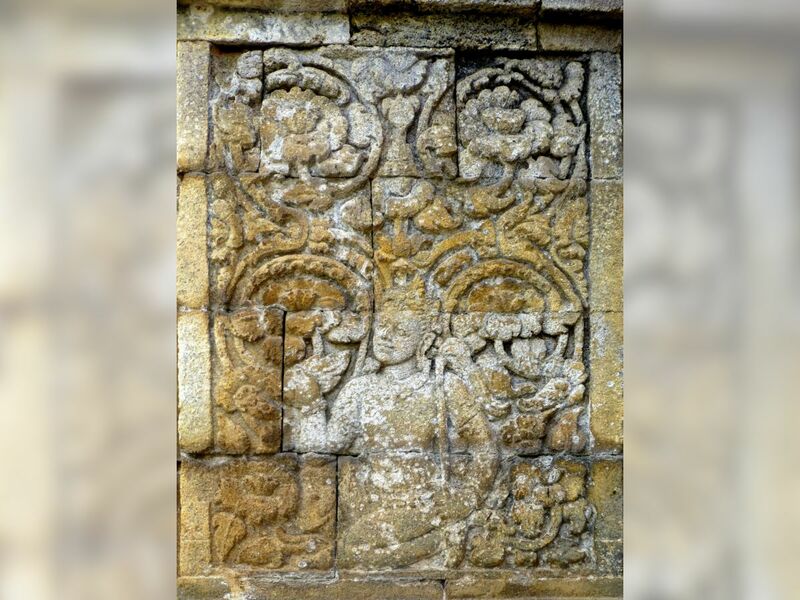 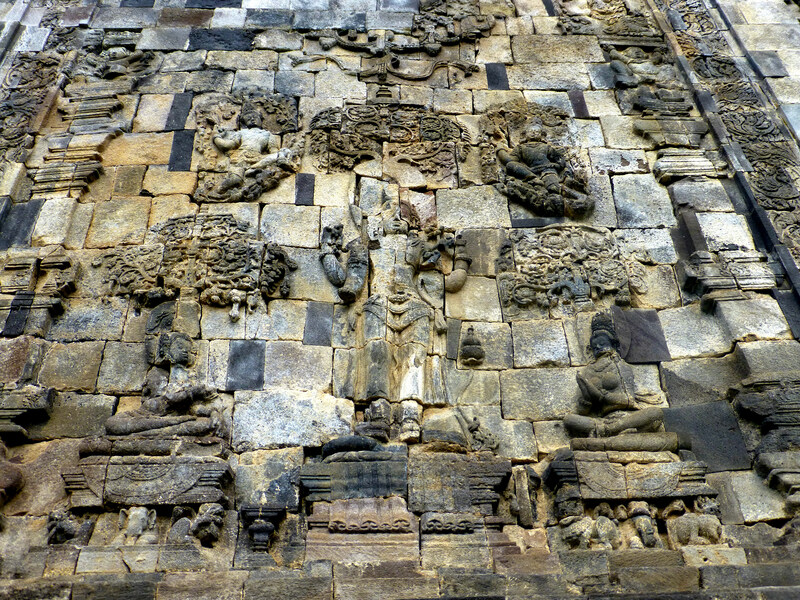 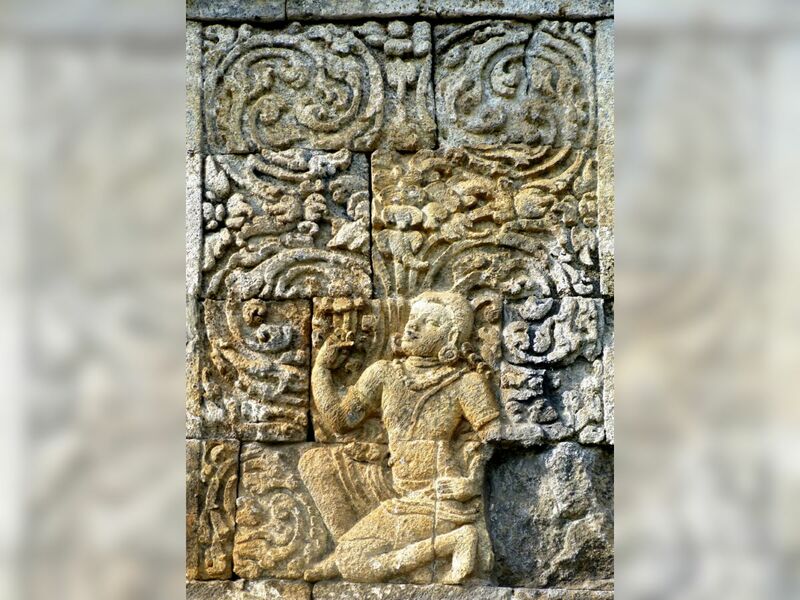 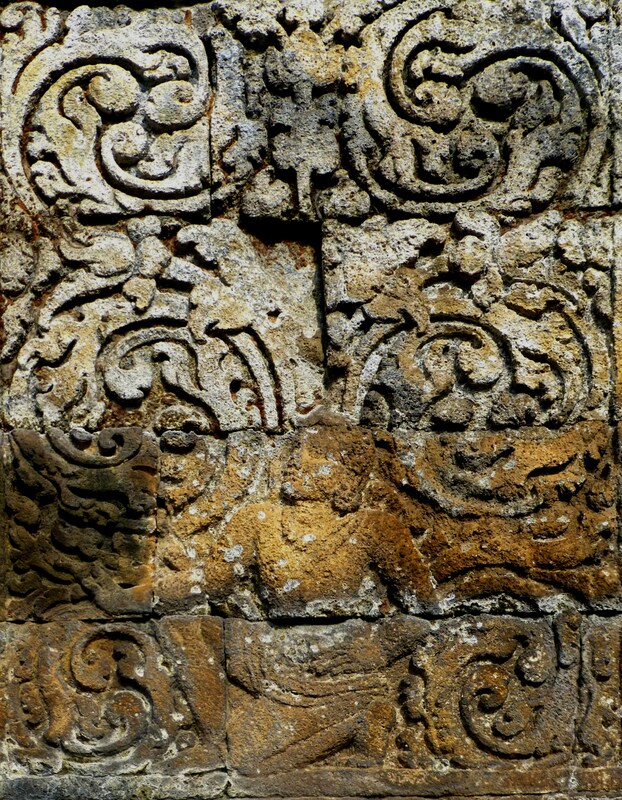 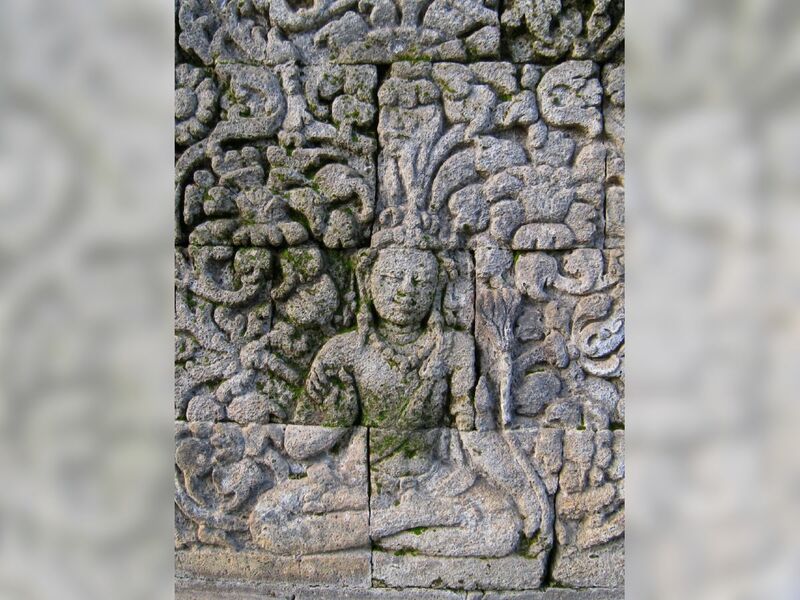 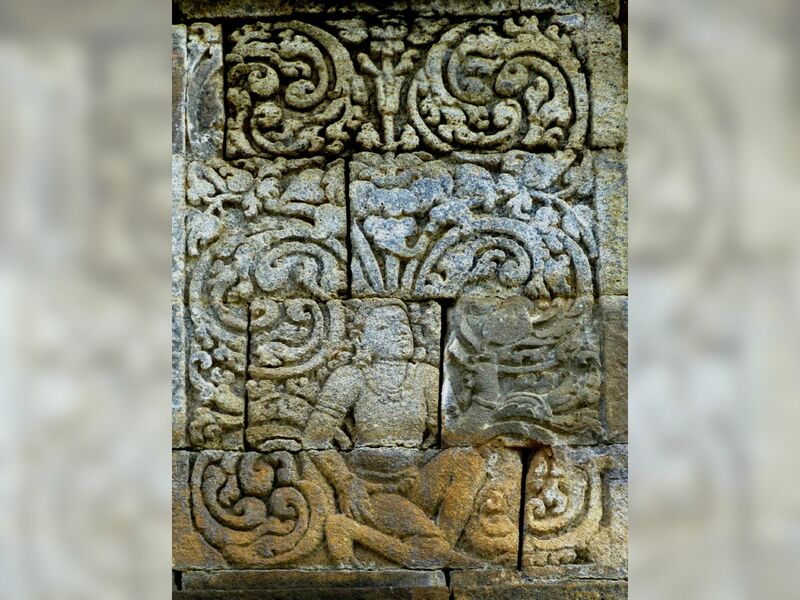 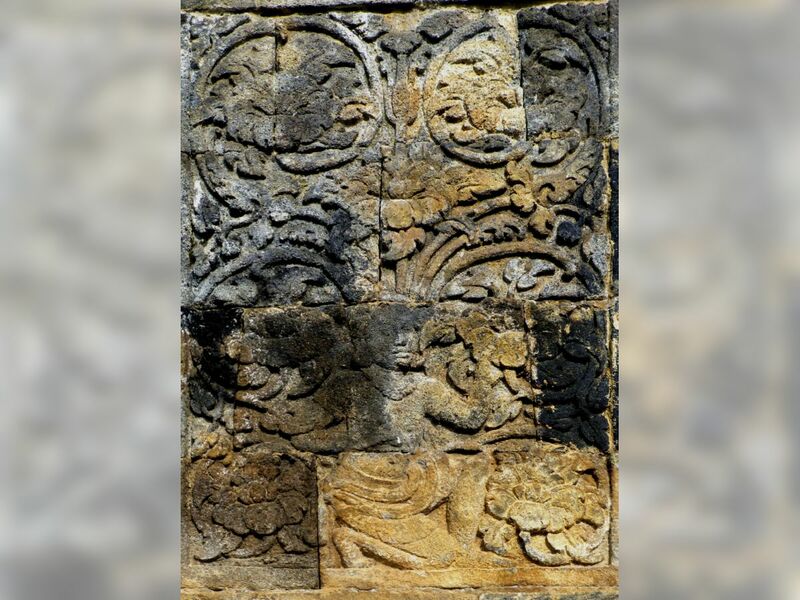 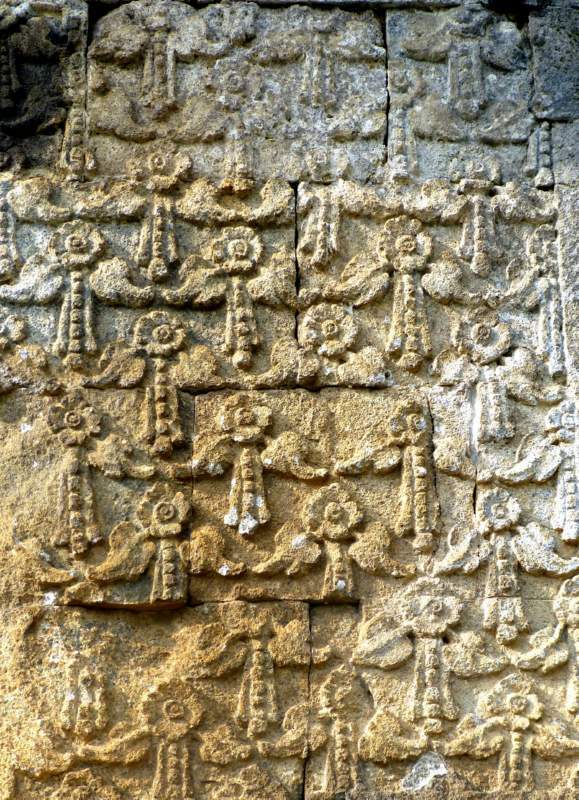 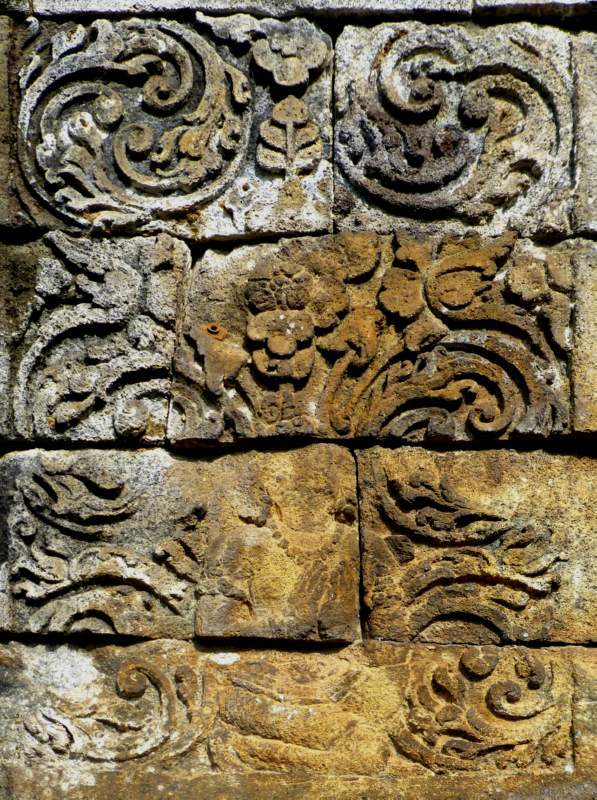 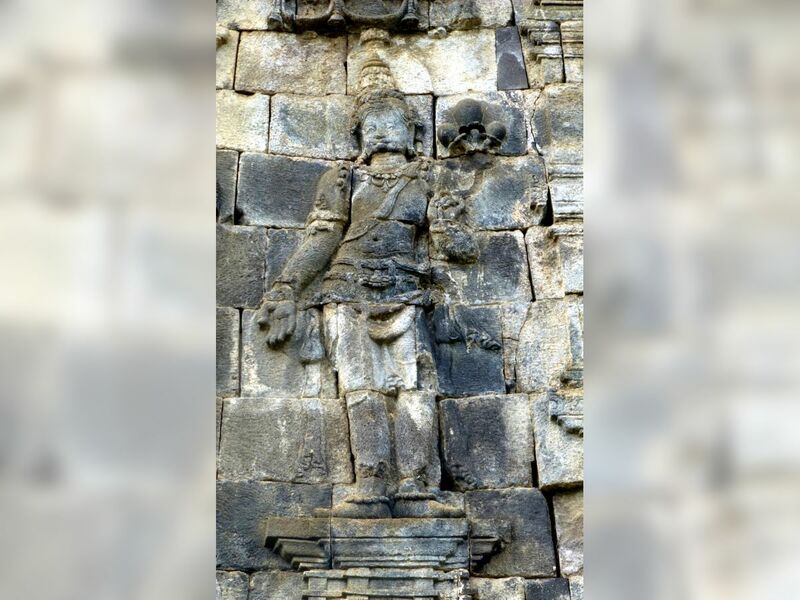 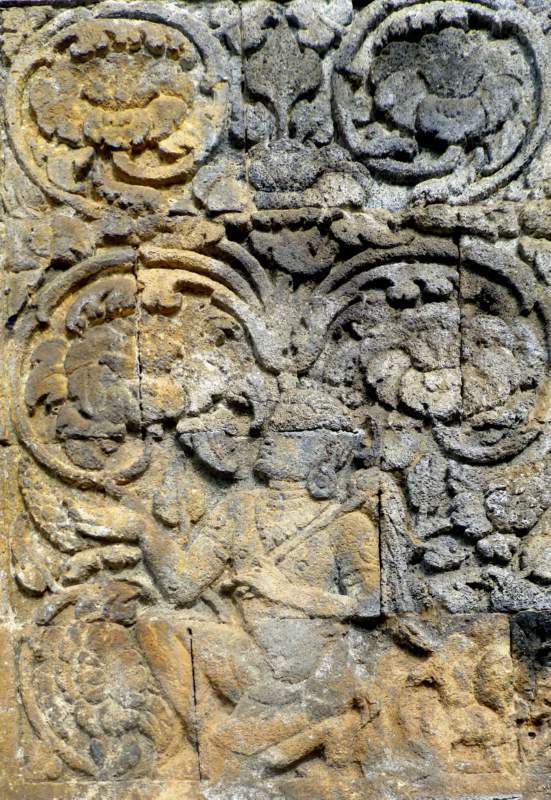 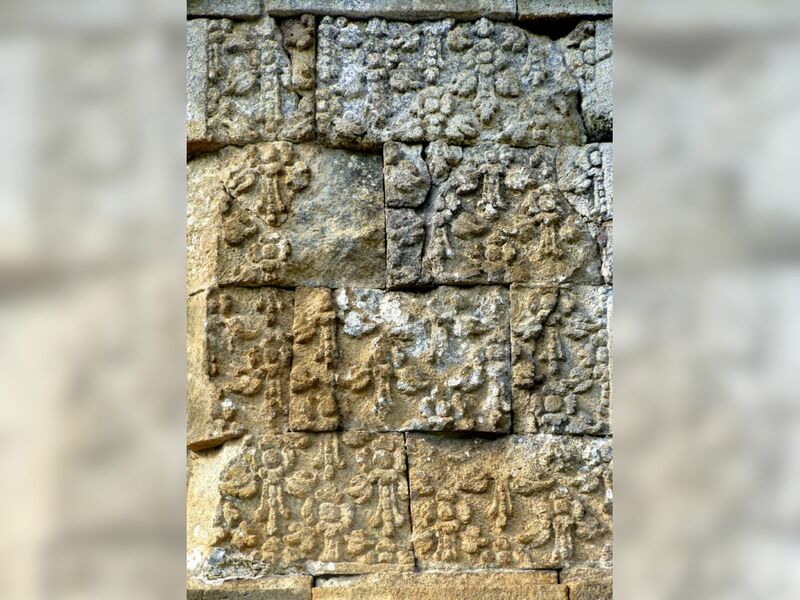 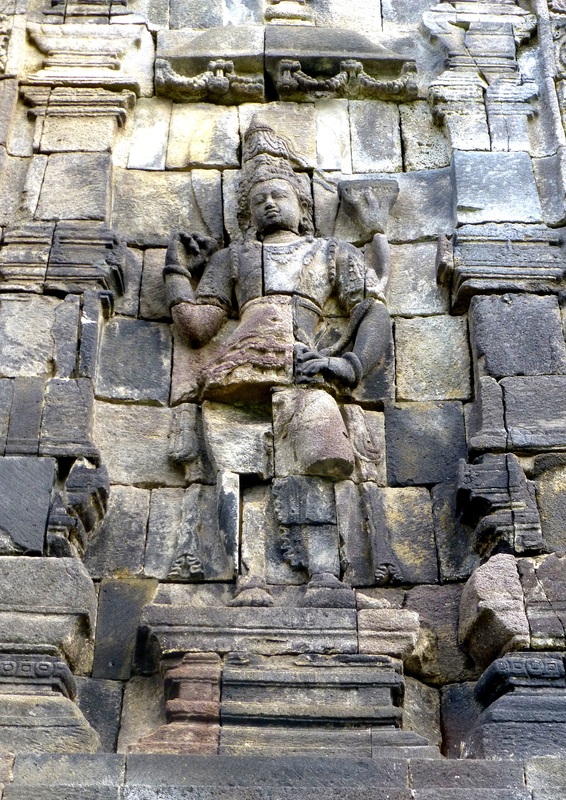 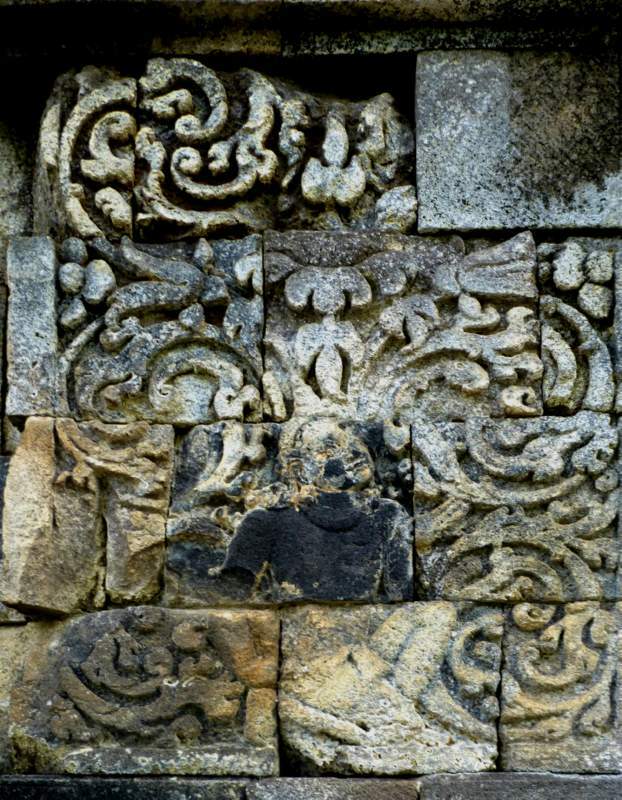 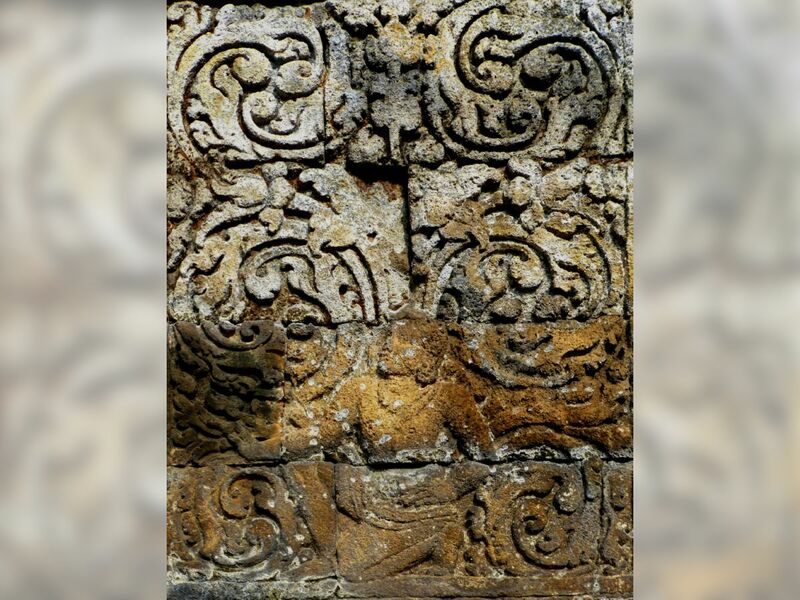 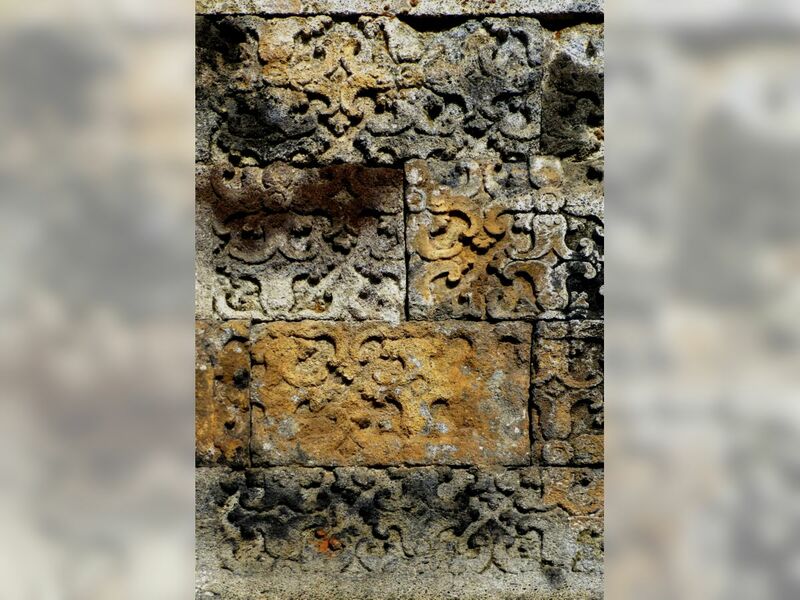 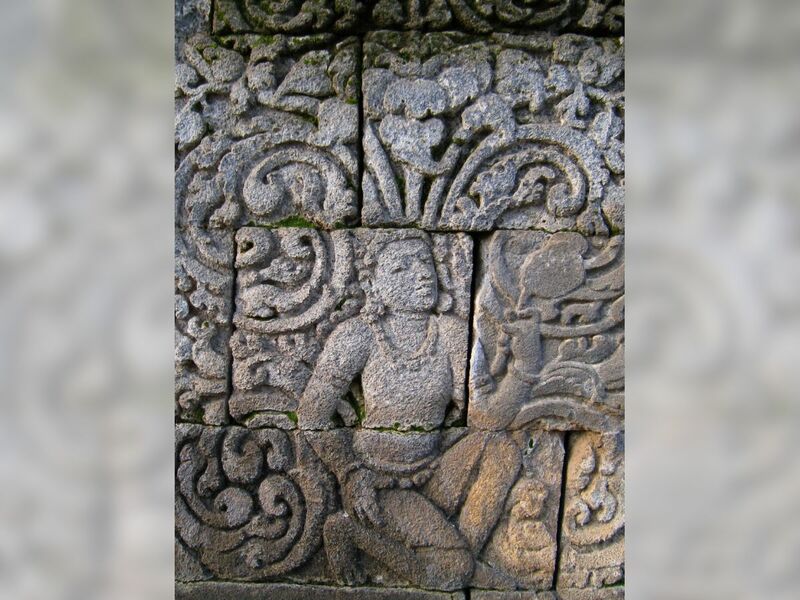 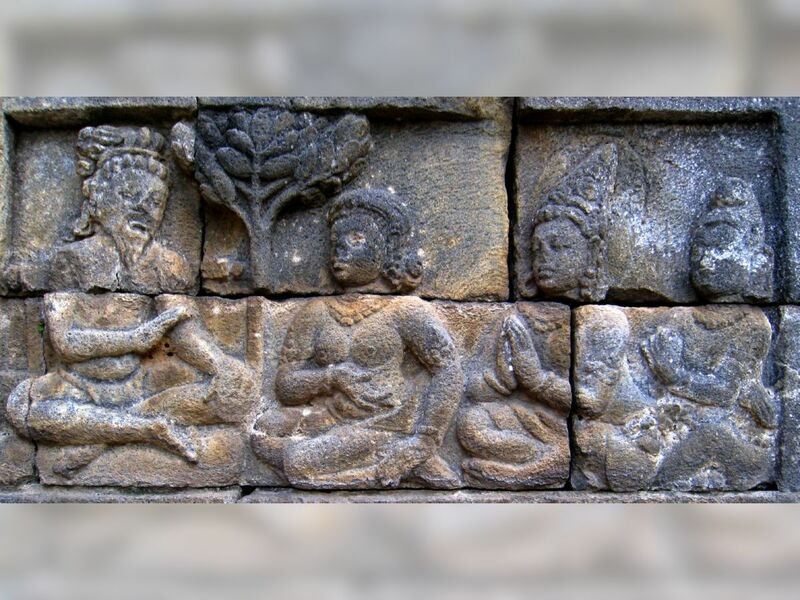 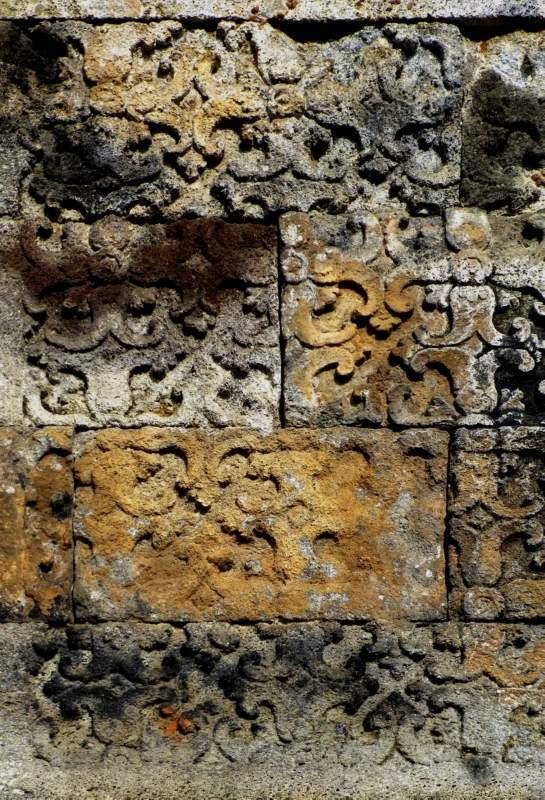 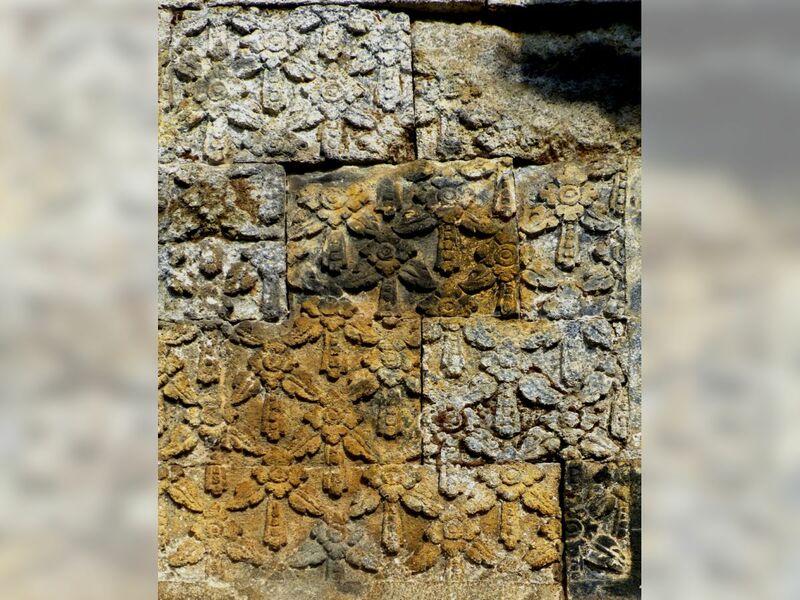 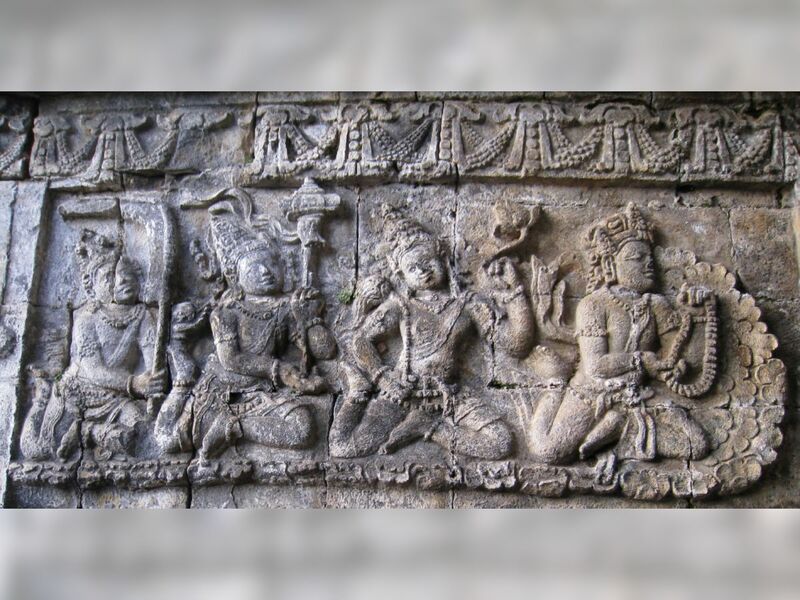 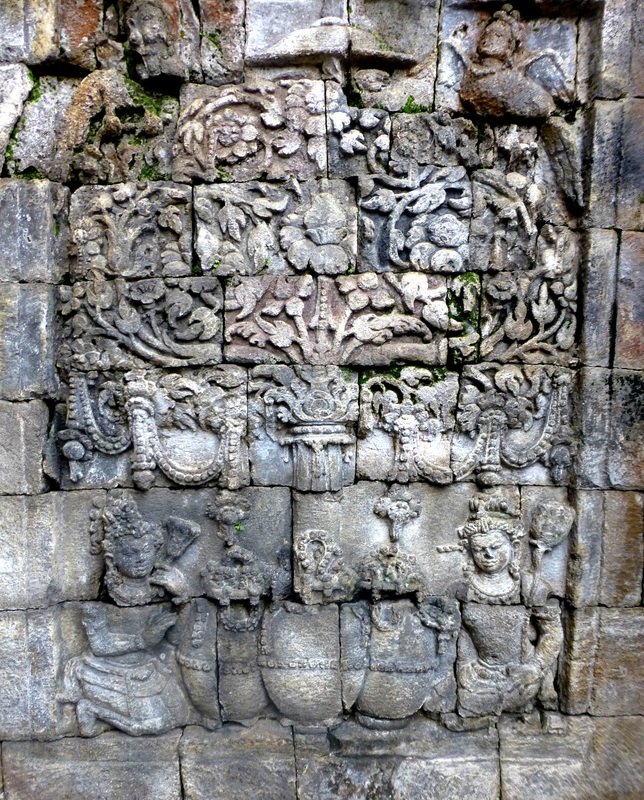 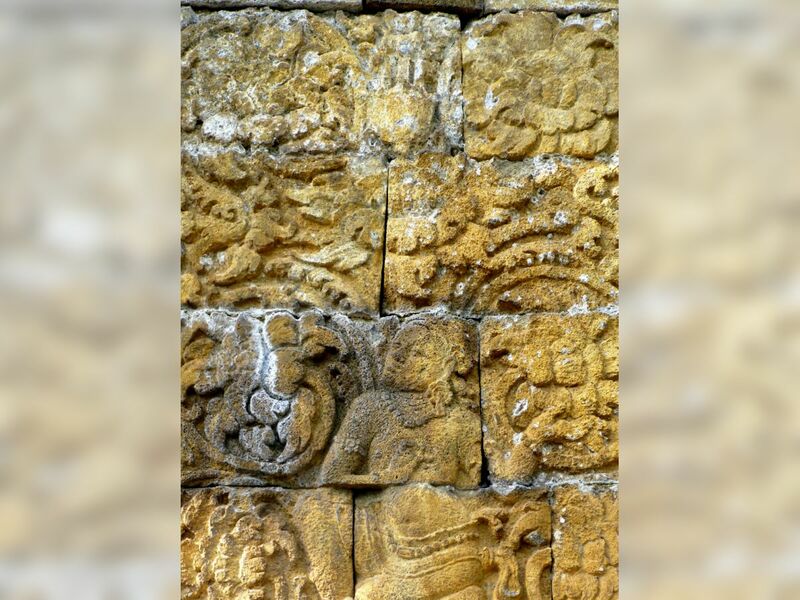 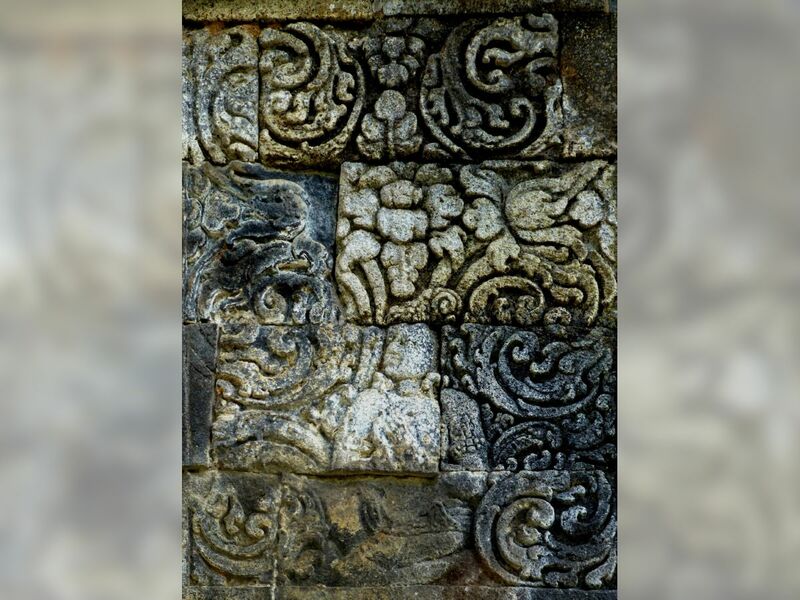 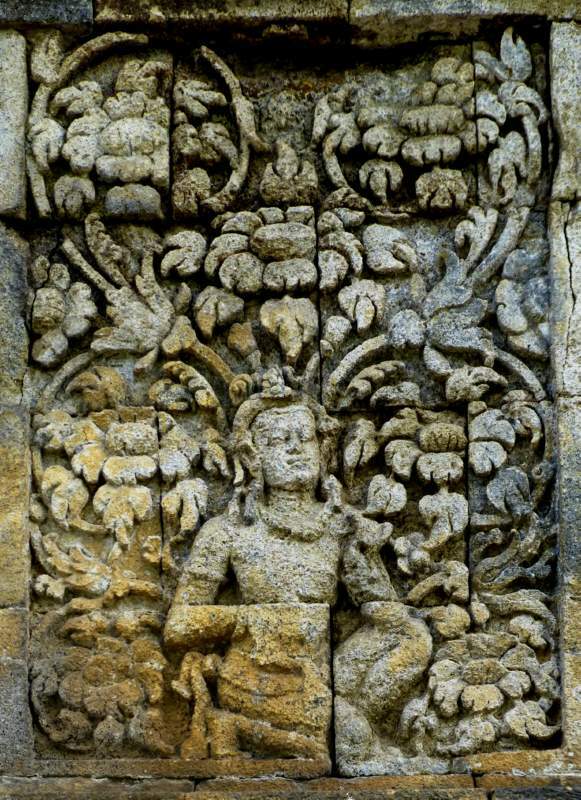 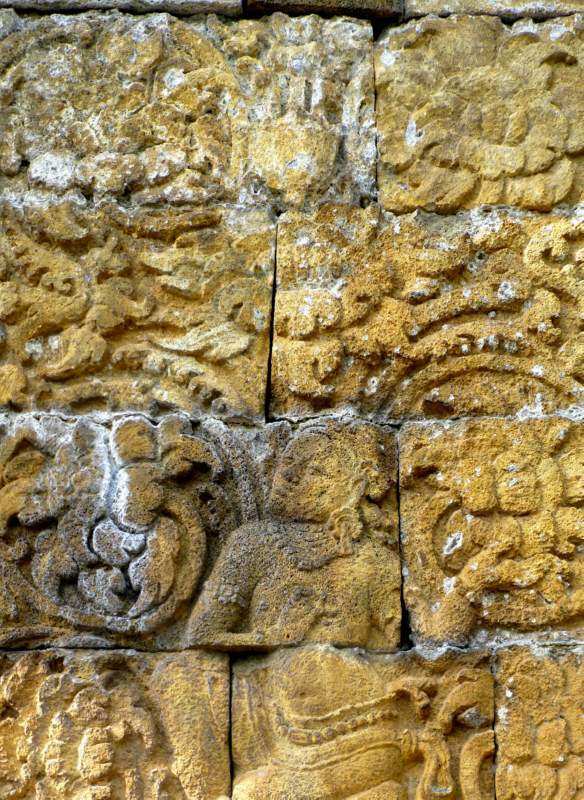 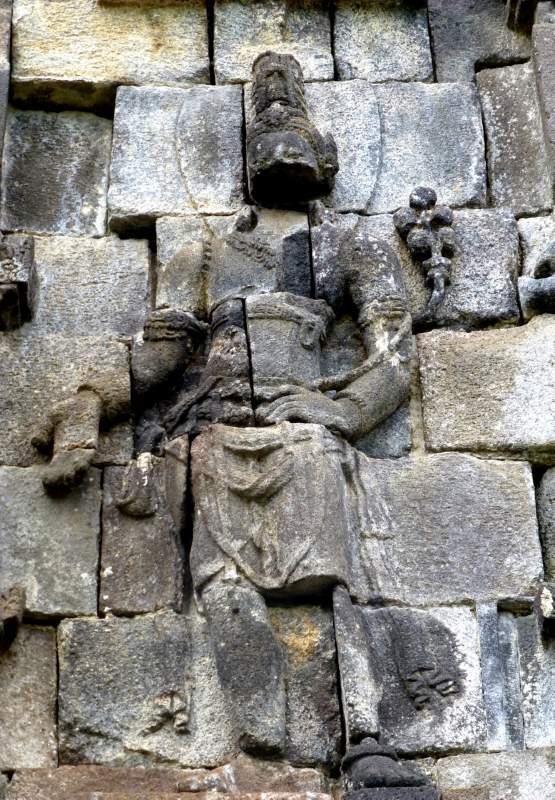 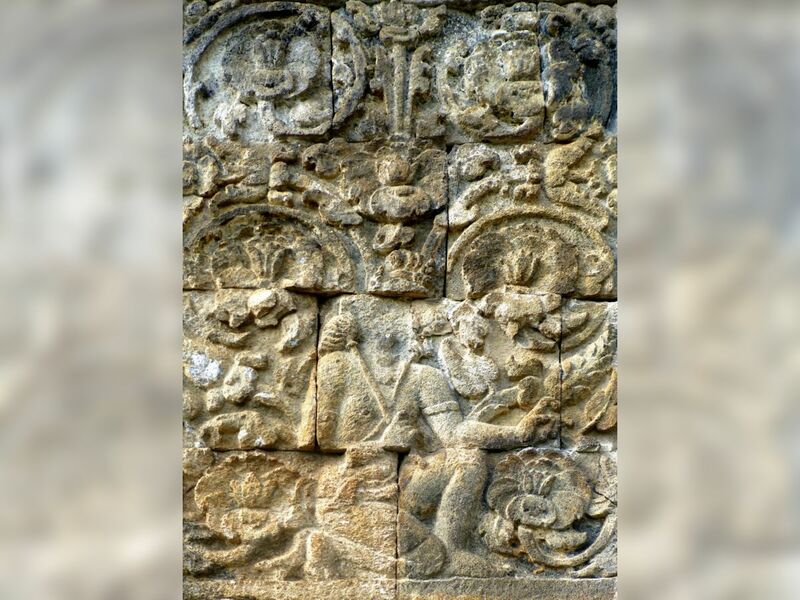 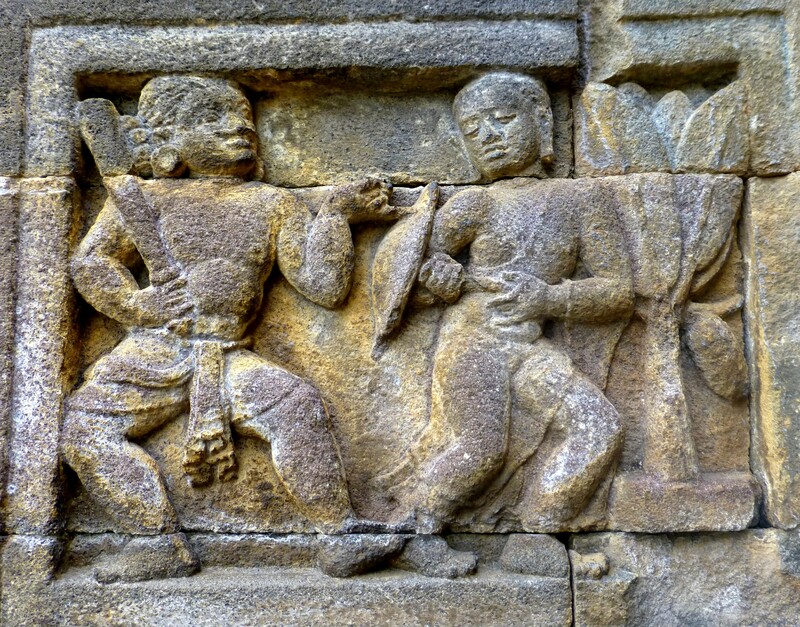 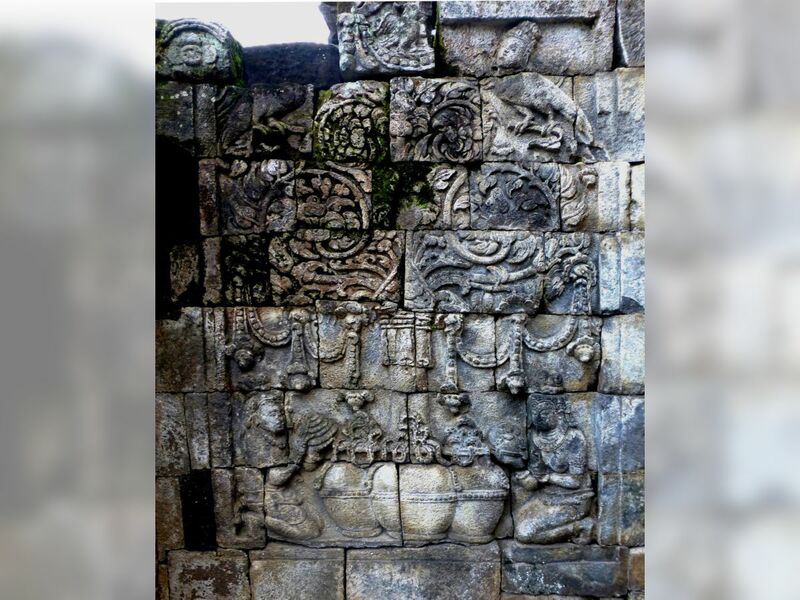 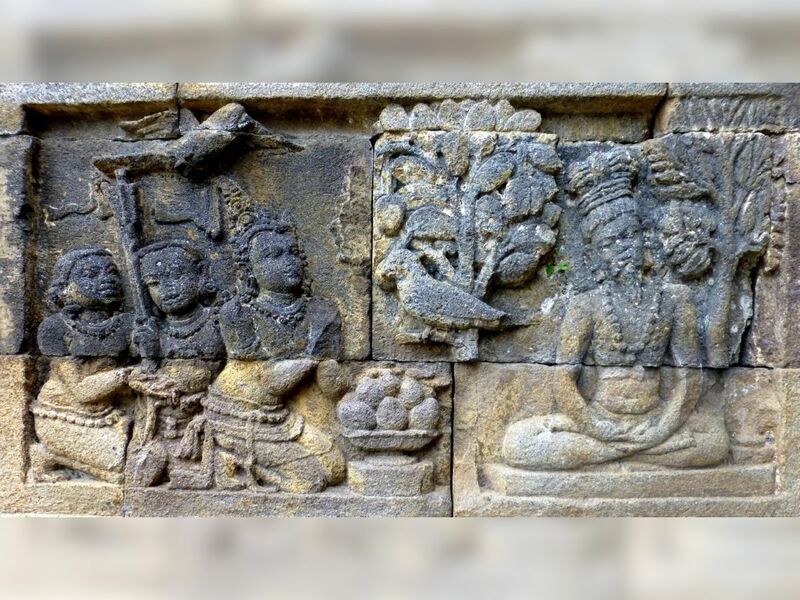 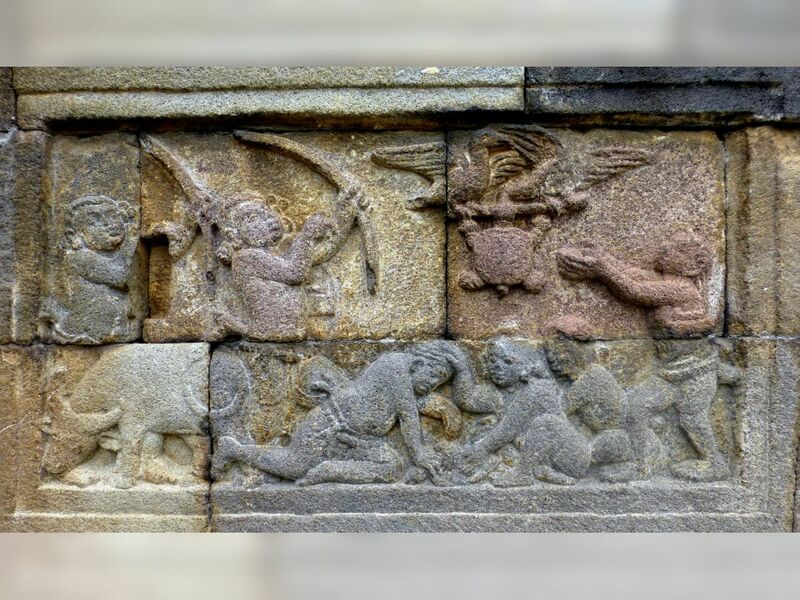 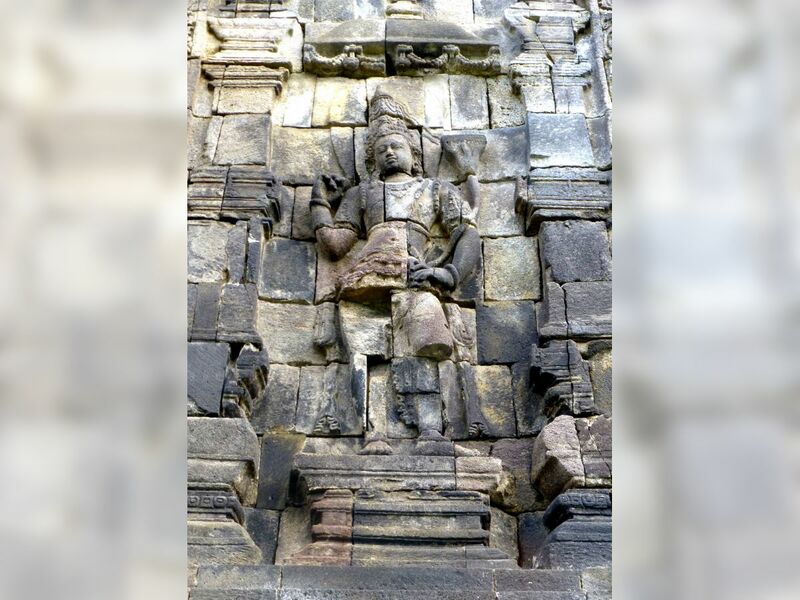 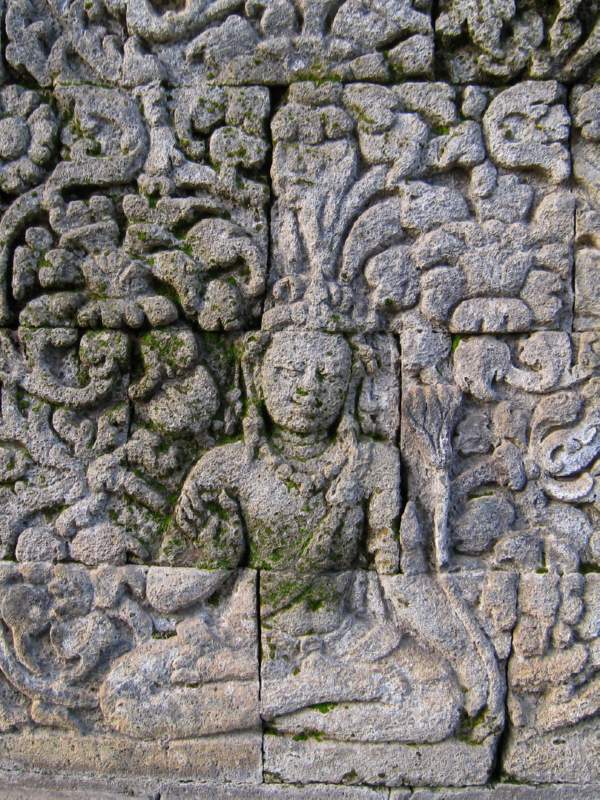 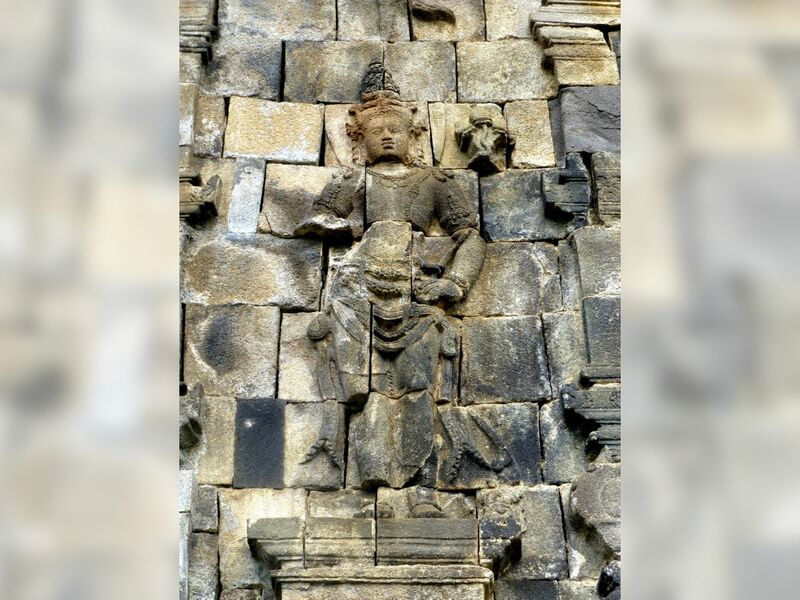 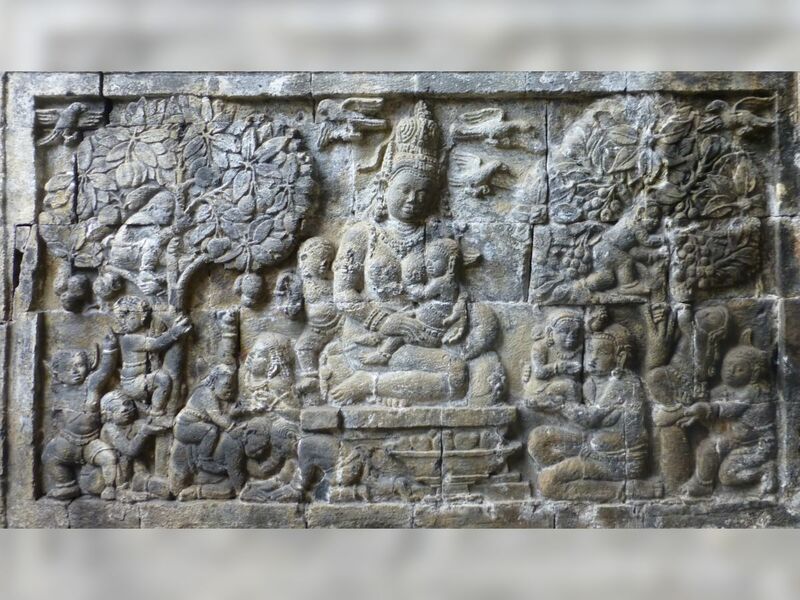 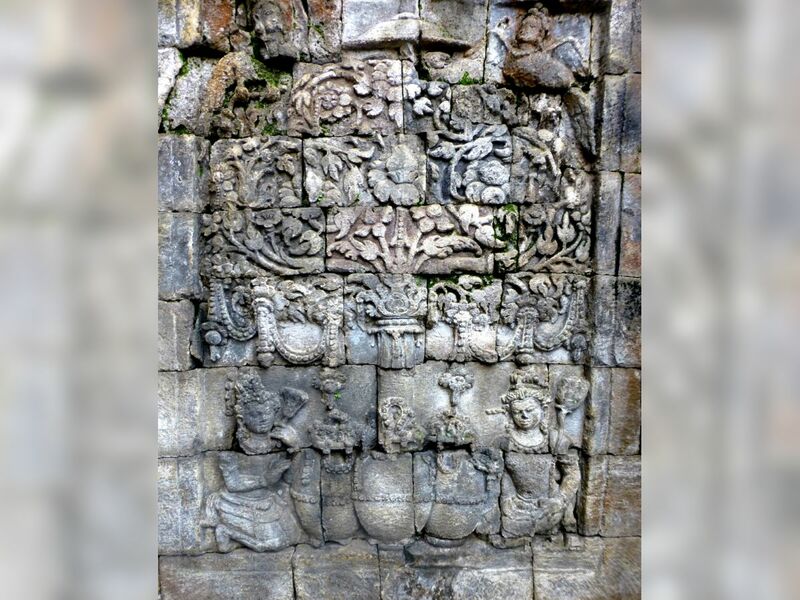 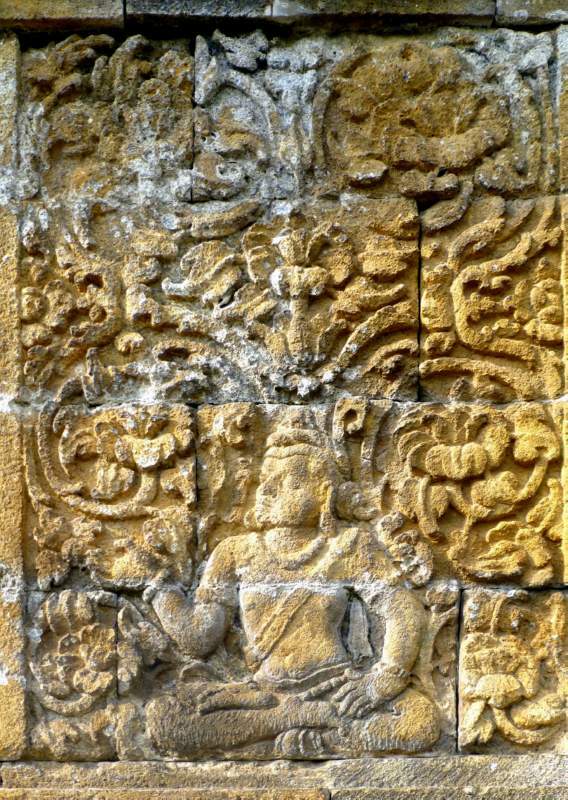 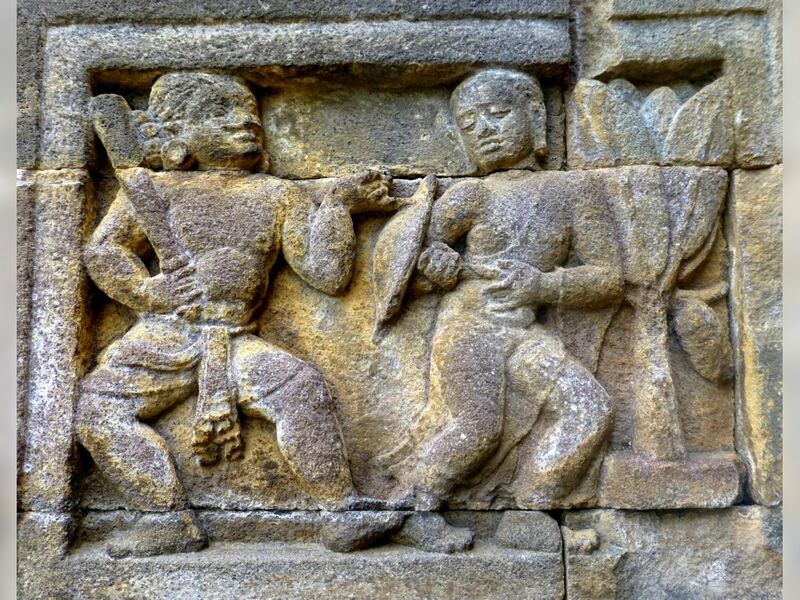 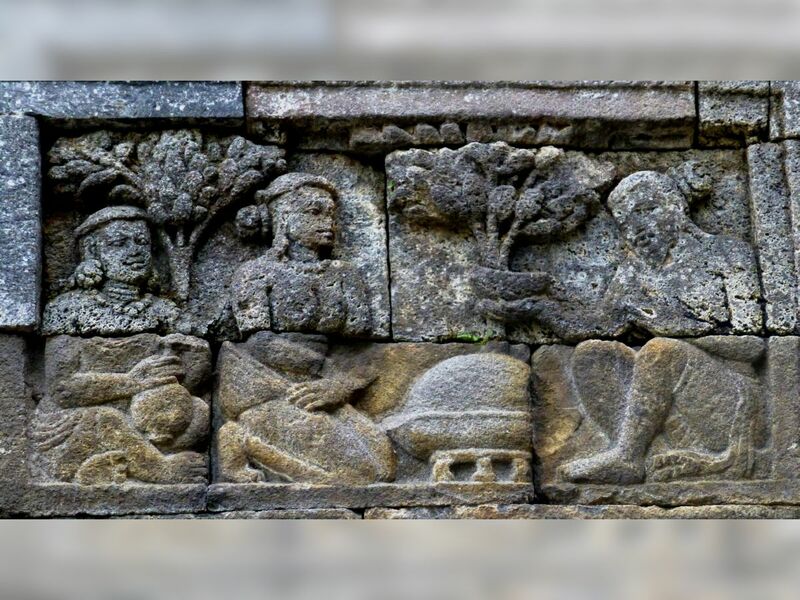 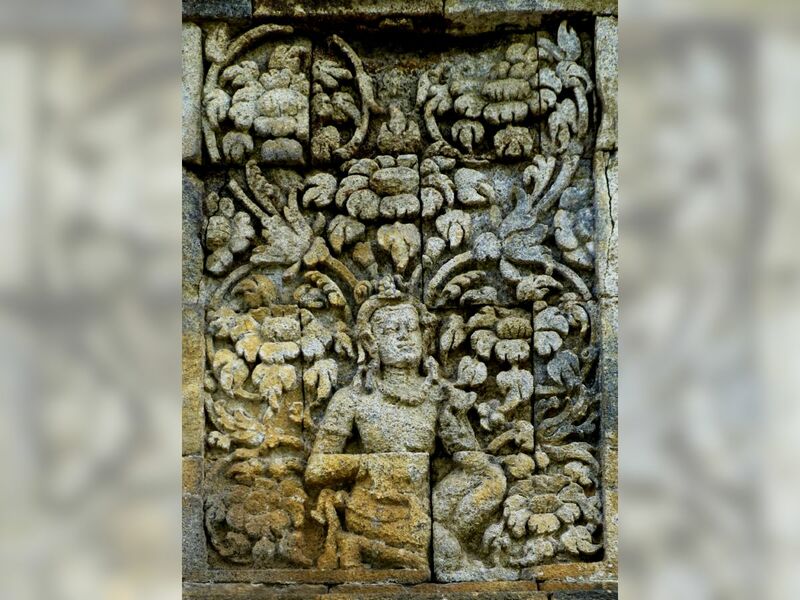 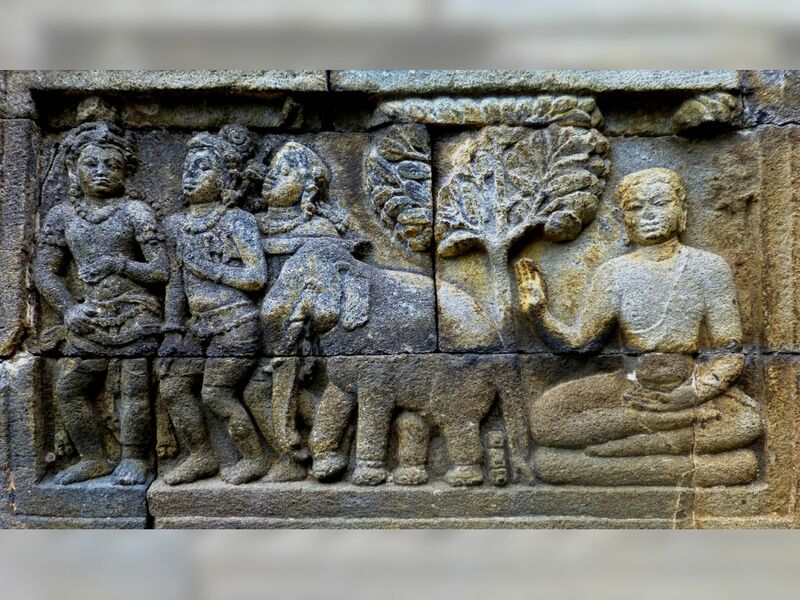 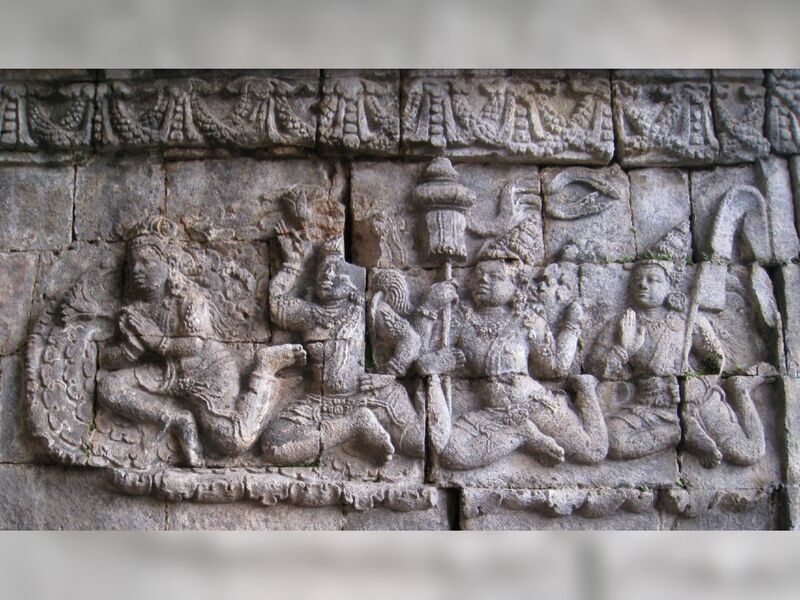 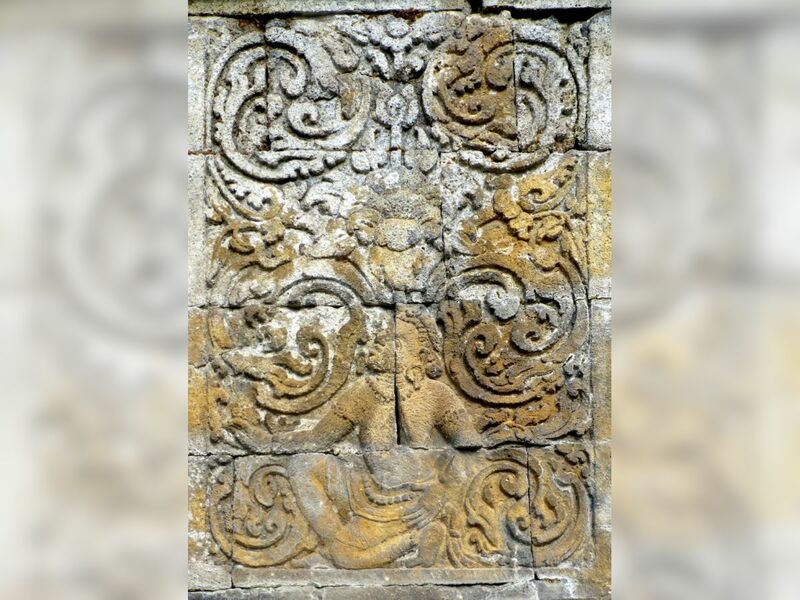 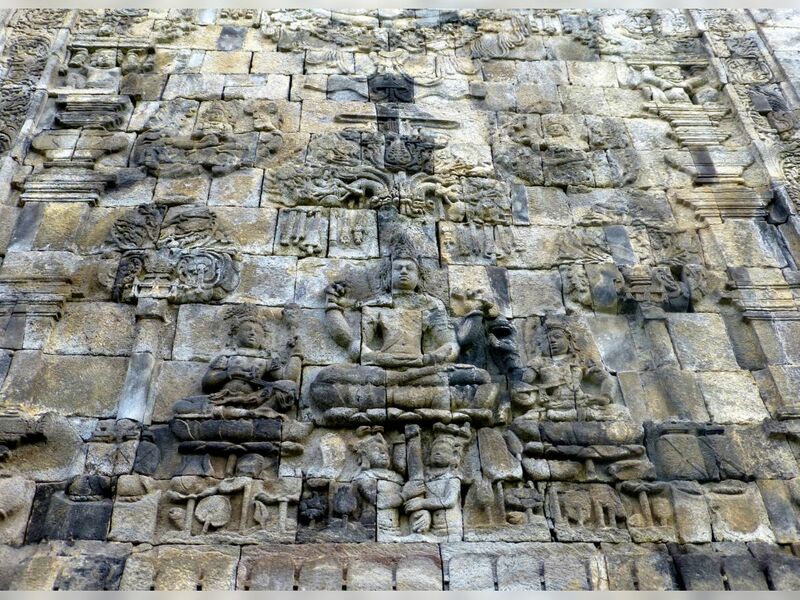 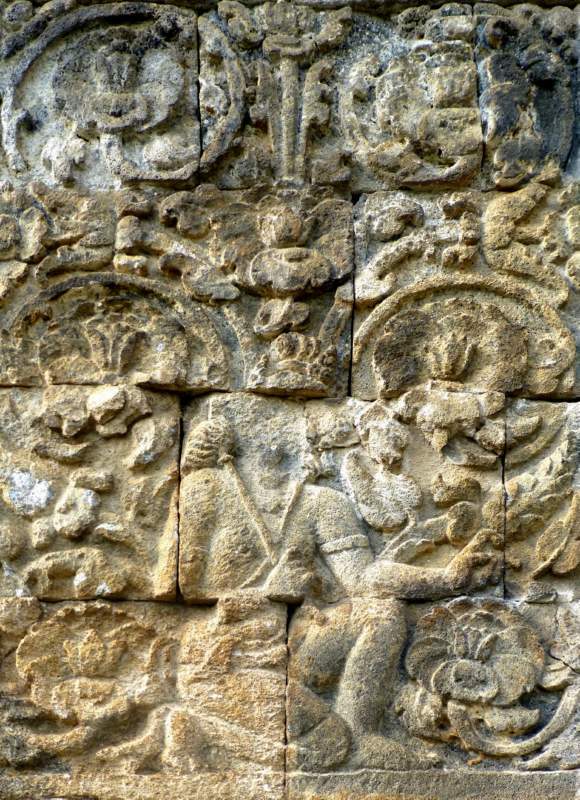 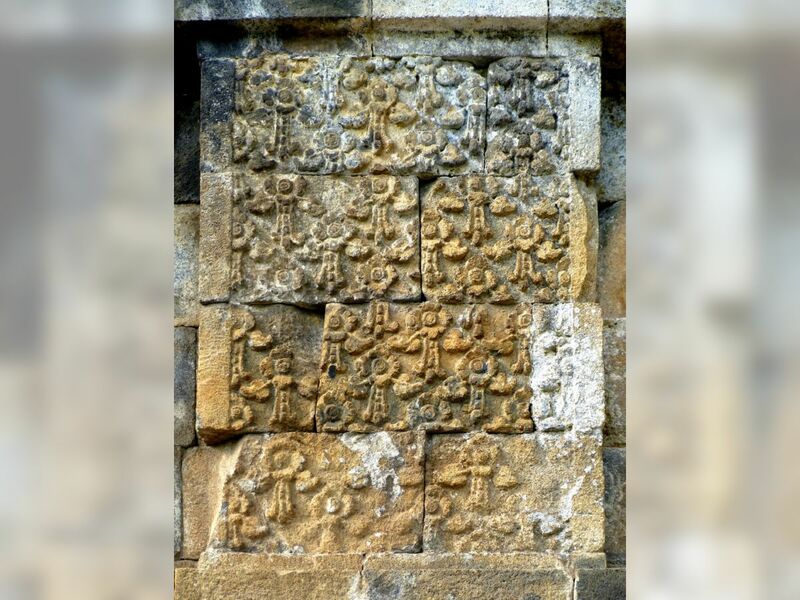 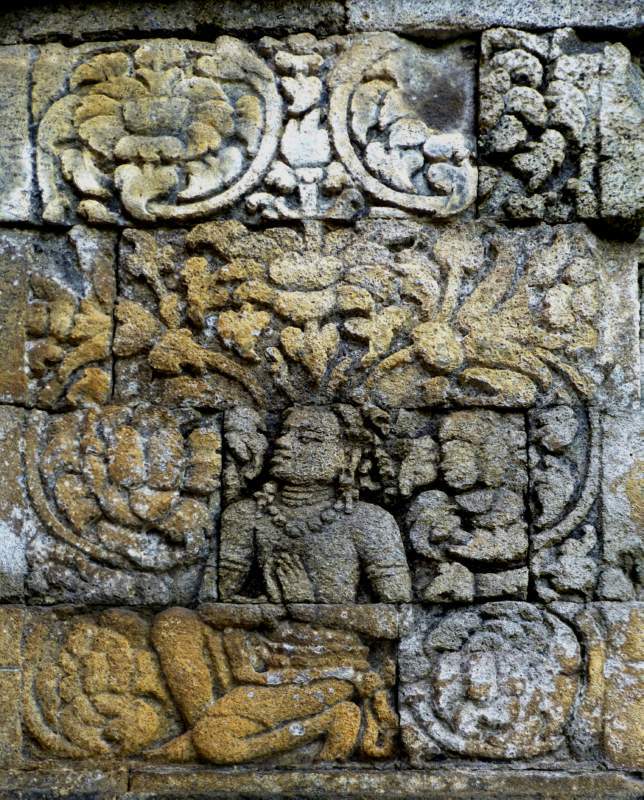 high-definition creative commons photographs from the Ancient Mendut Vihara, near Borobudur, Java, showing the architecture and the reliefs, together with an essay on Candi Mendut by A. Foucher. [We shall] identify, by way of a specimen, the images which decorate the Candi Mendut. 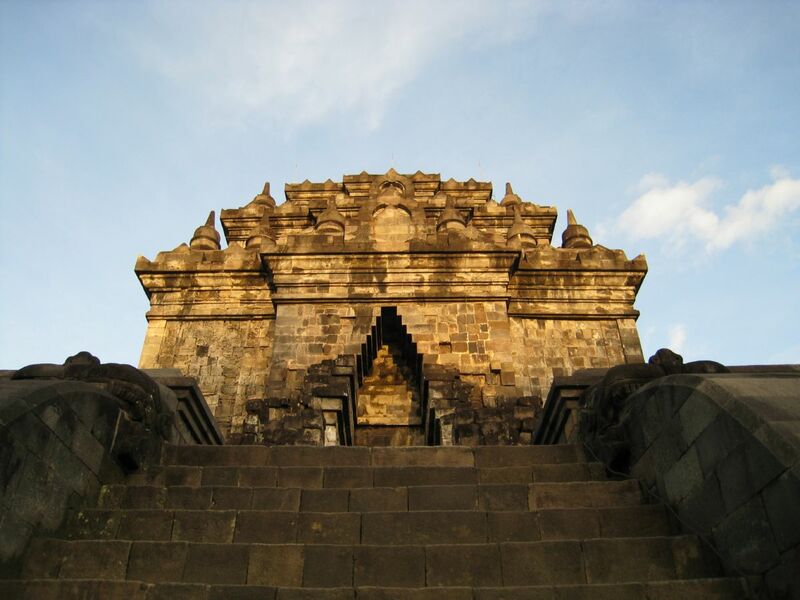 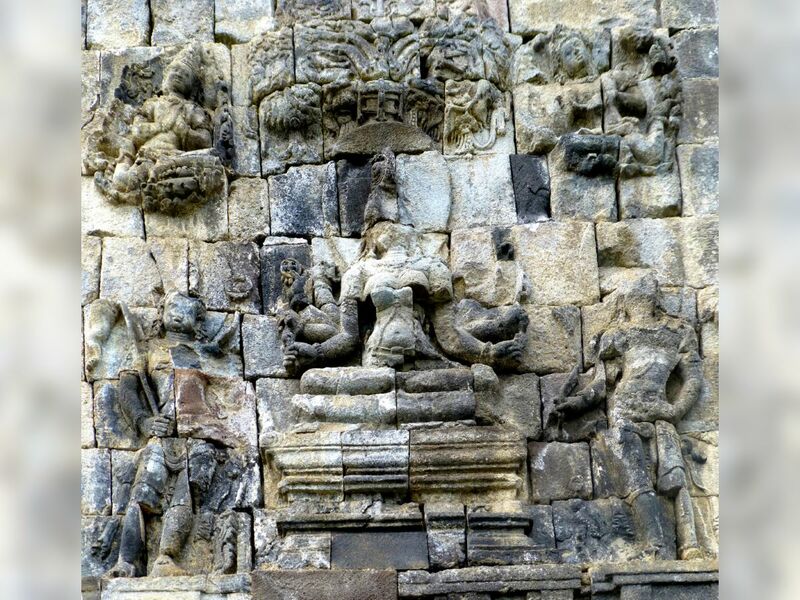 This edifice, placed in the axis of the oriental gate of, and at three kilometres from, Borobudur, consists, in fact, of a cella only, with a vestibule in front. 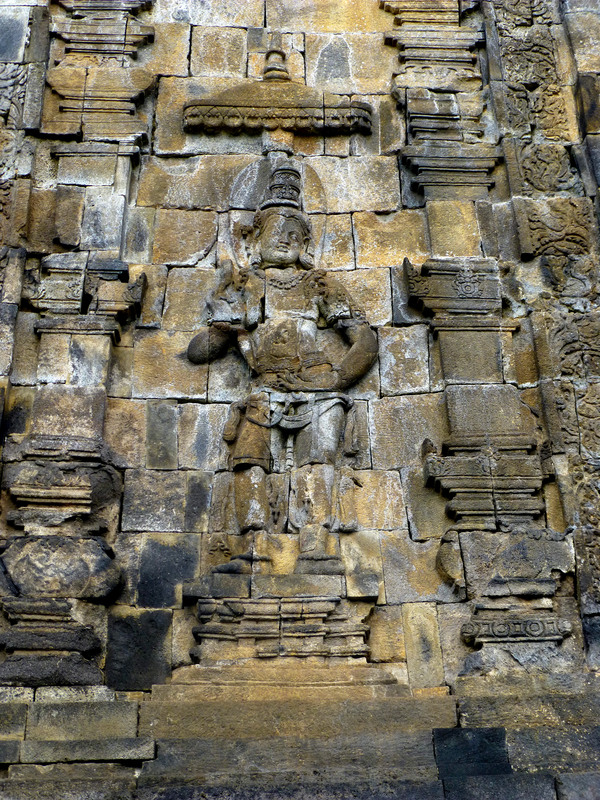 The whole is, according to the Javanese custom, perched on a terrace in the same manner as are the Brahmanic temples of Prambanam. 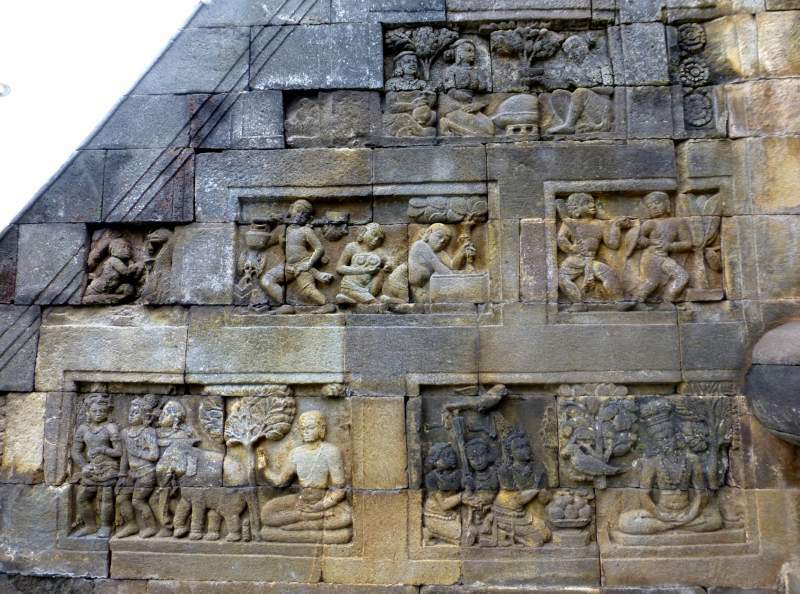 In Buddhist terminology it is what is properly called a vihara. 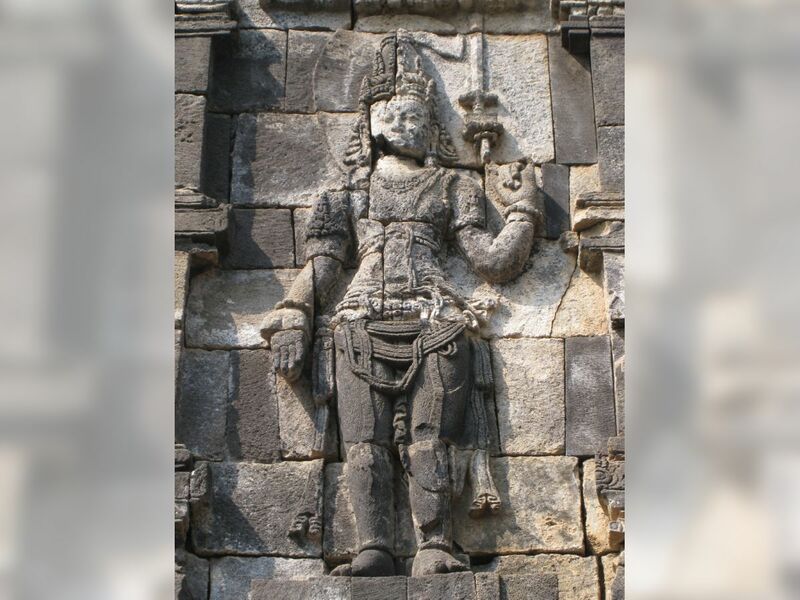 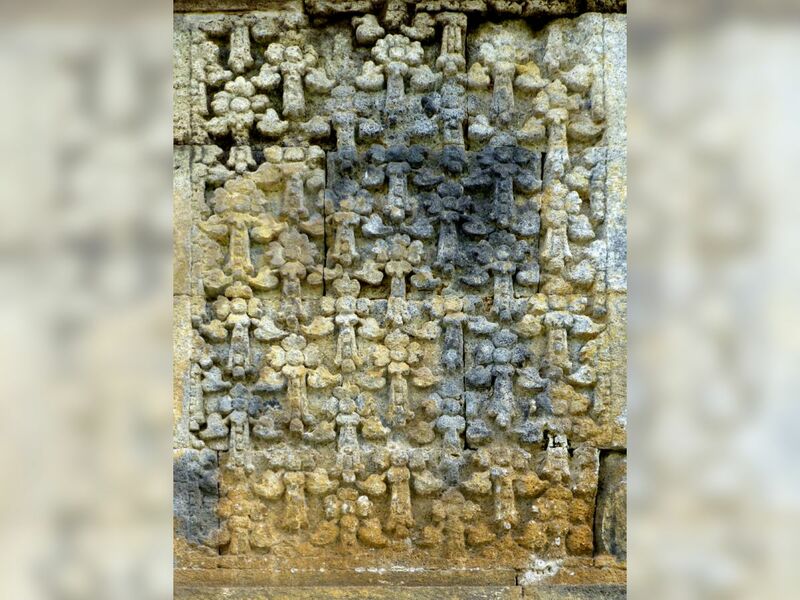 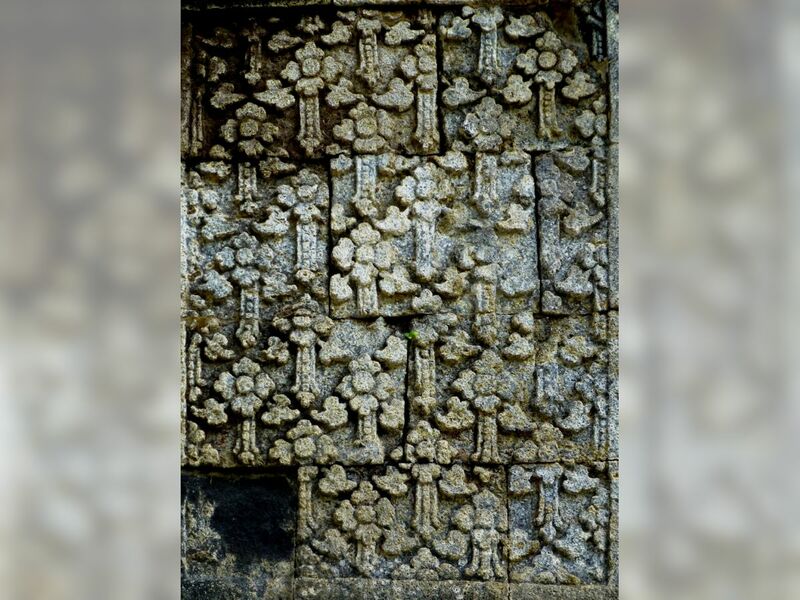 Naturally it shelters statues, and the walls of its entrance vestibule, like the exterior faces of the building, are decorated with figures whose purely Buddhist character may be recognized at once by anyone who is a little familiar with the Indian iconography of this religion. 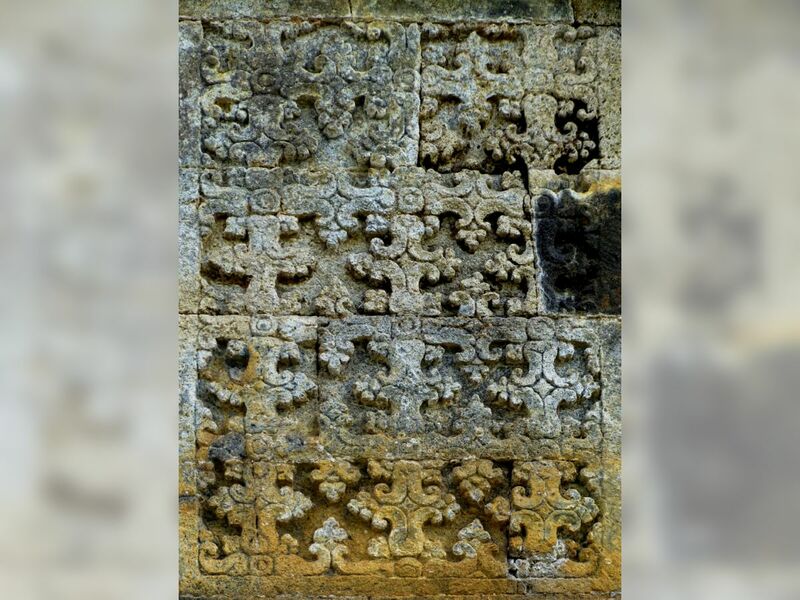 The building, fairly well preserved, except in the upper parts, has been the object of a restoration the architectural  details of which we shall not undertake to discuss. 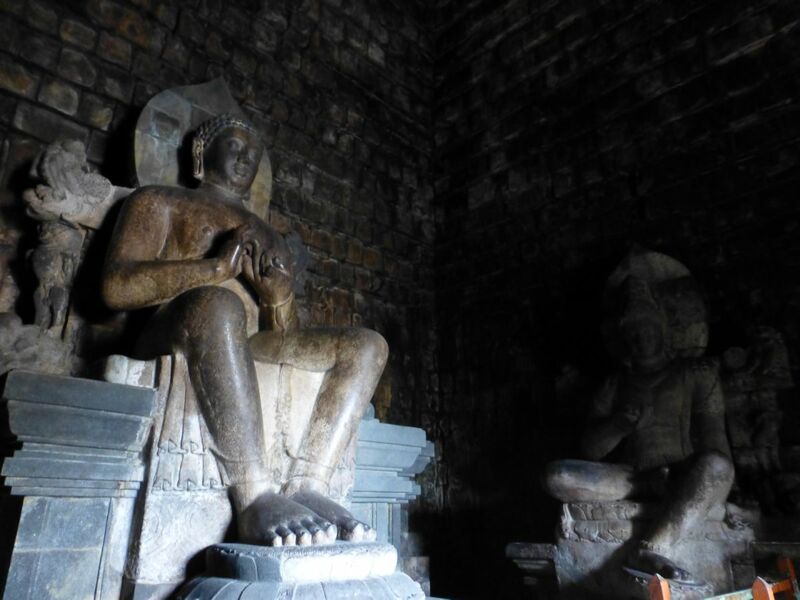 The three enormous statues of the cella have been replaced on their pedestals. They are characterized by a curious detail. 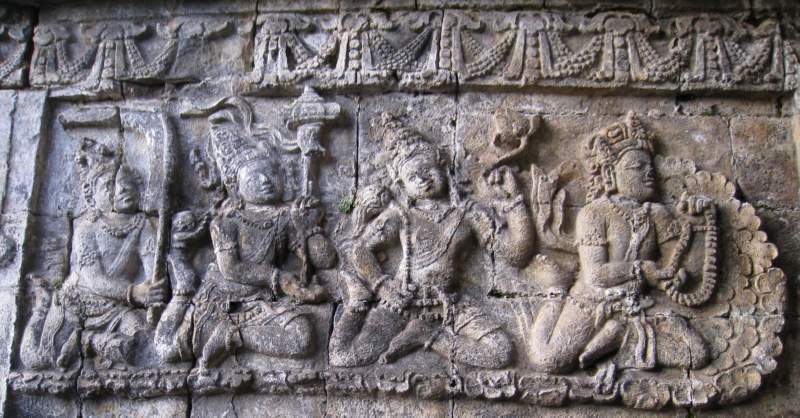 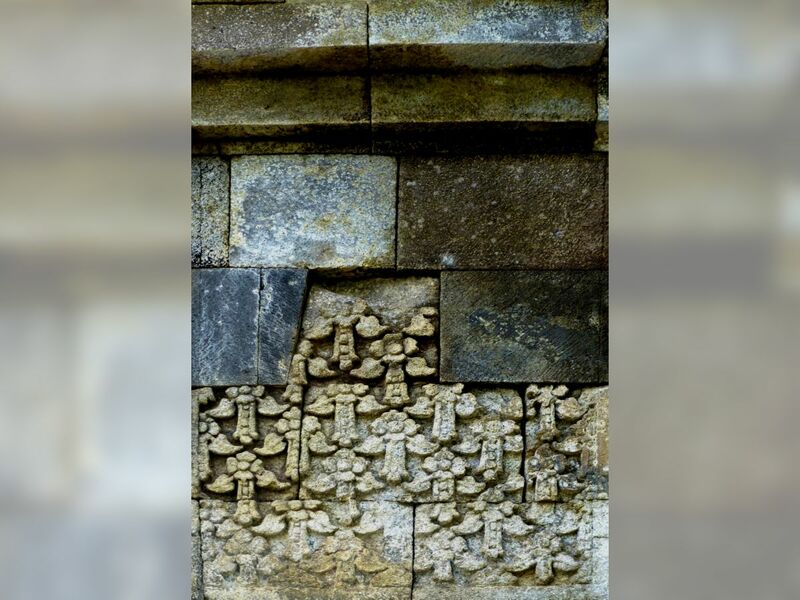 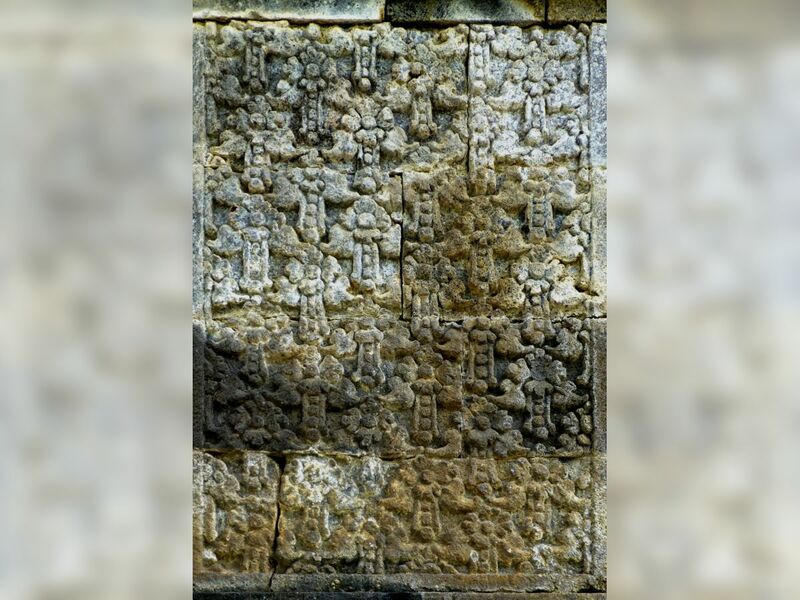 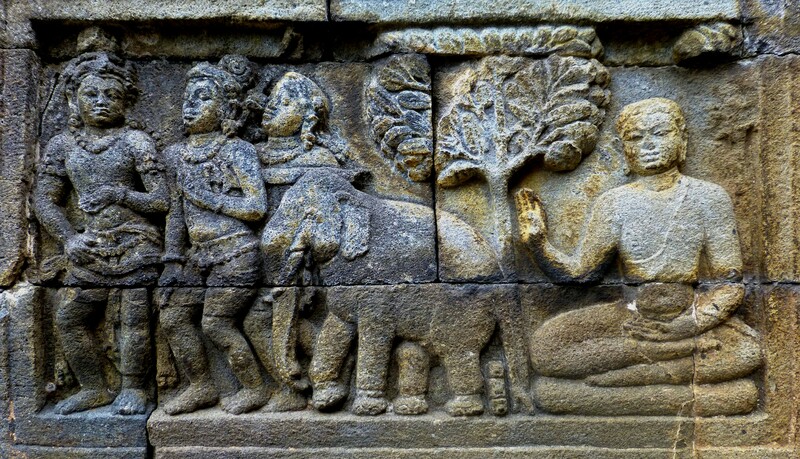 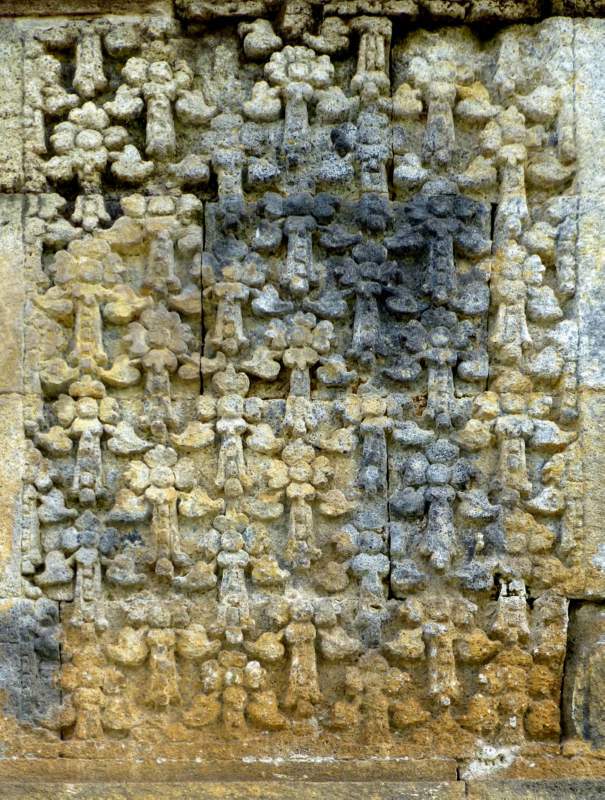 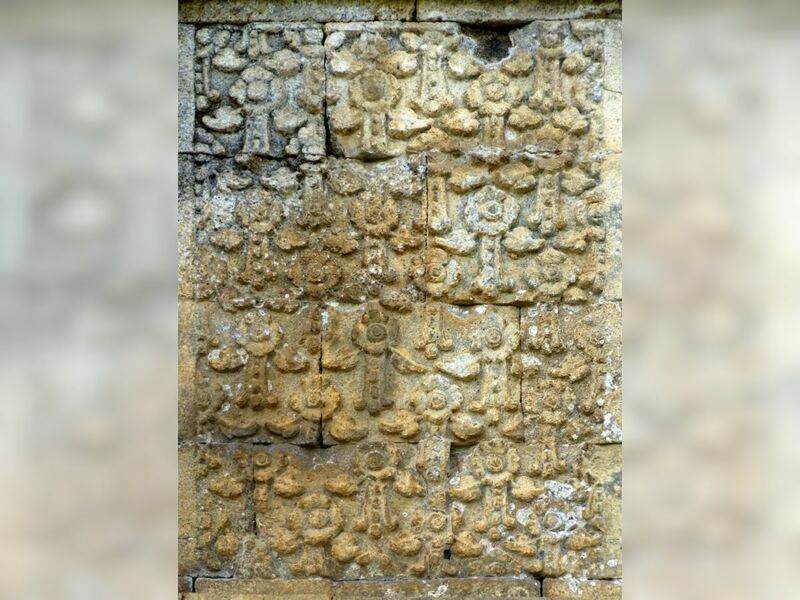 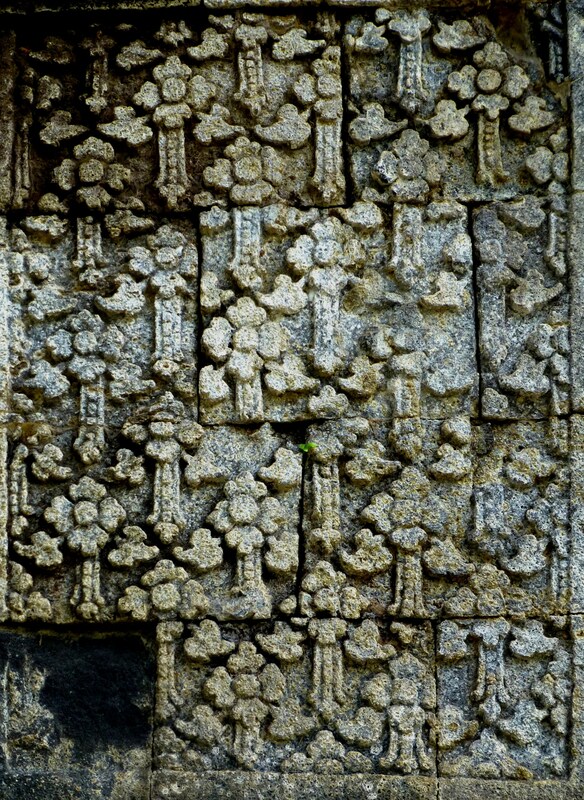 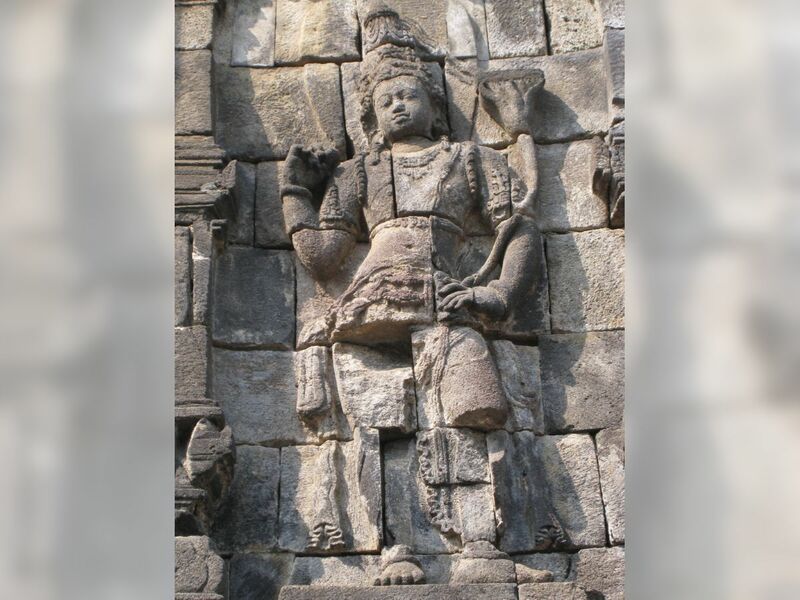 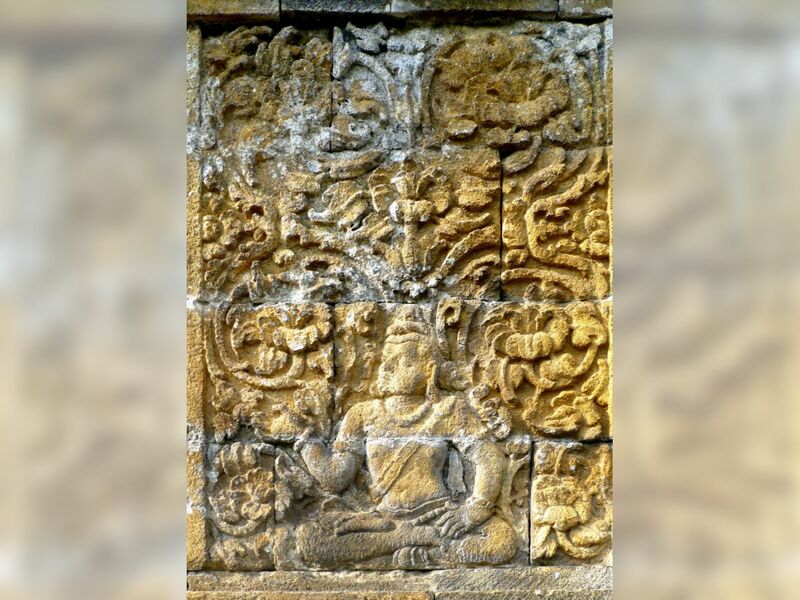 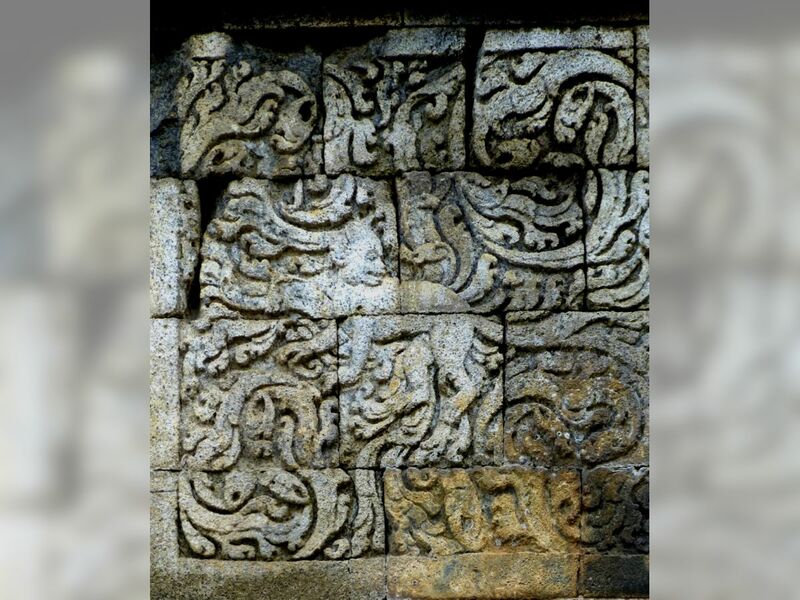 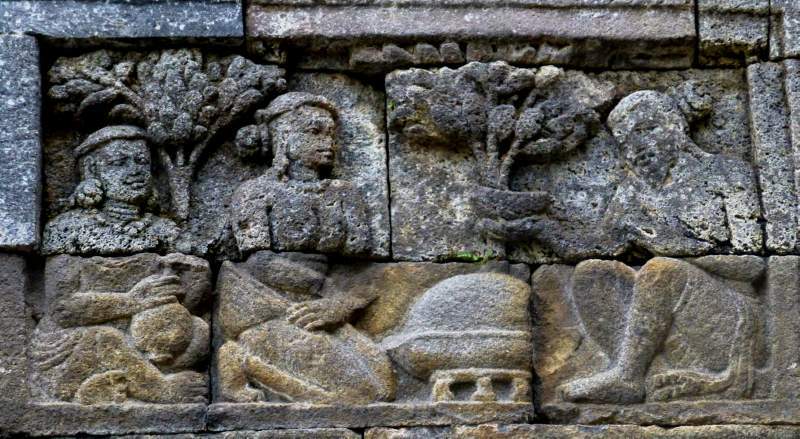 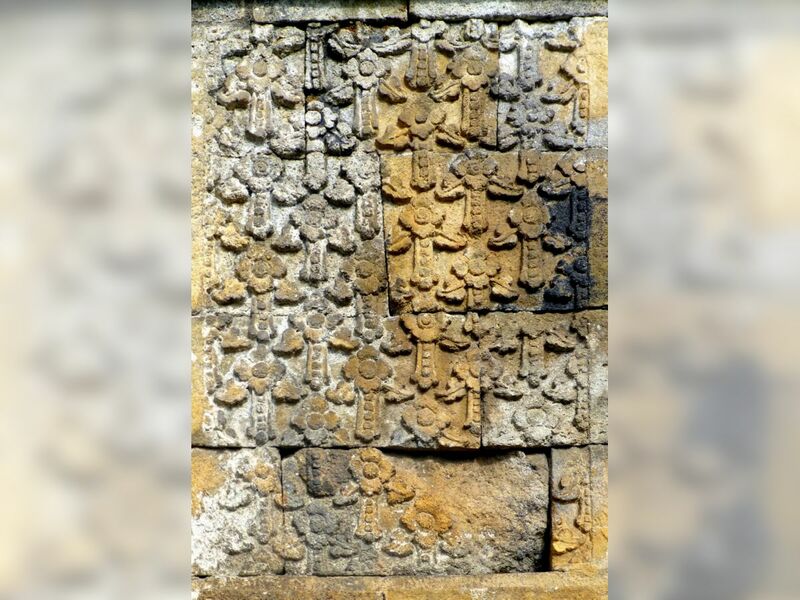 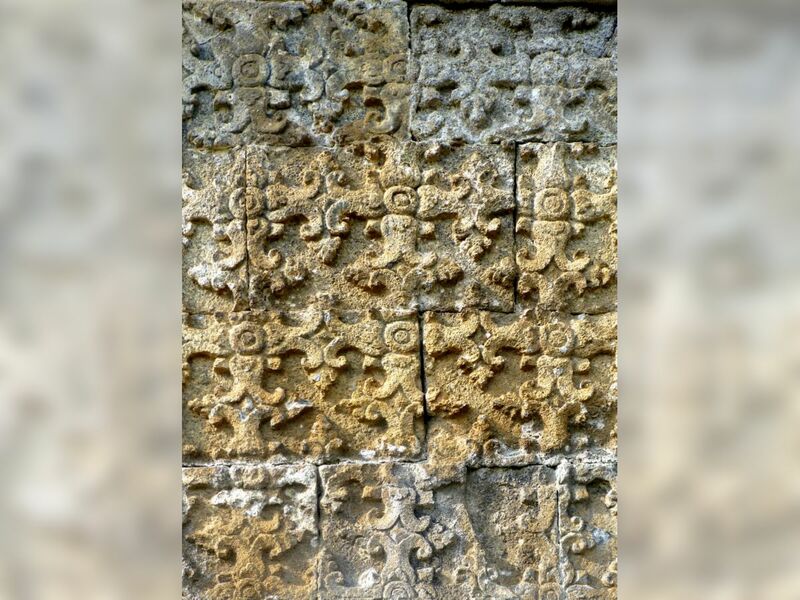 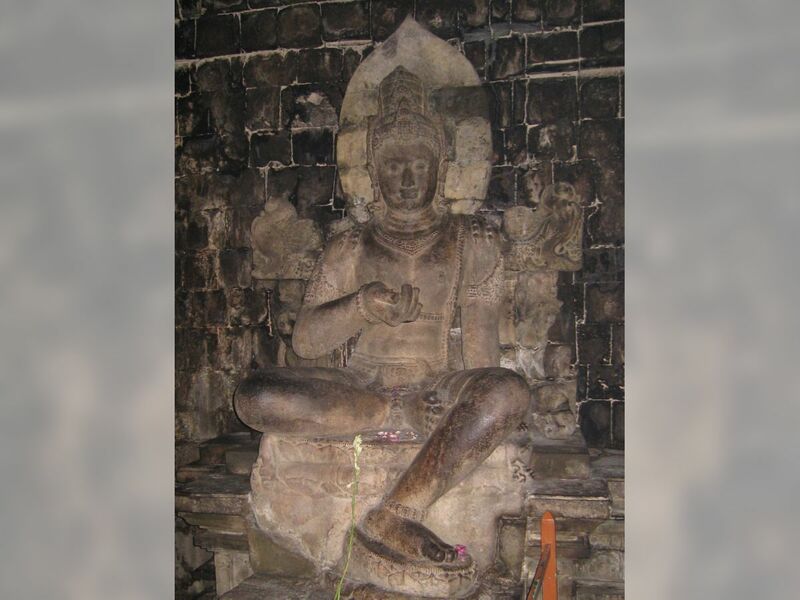 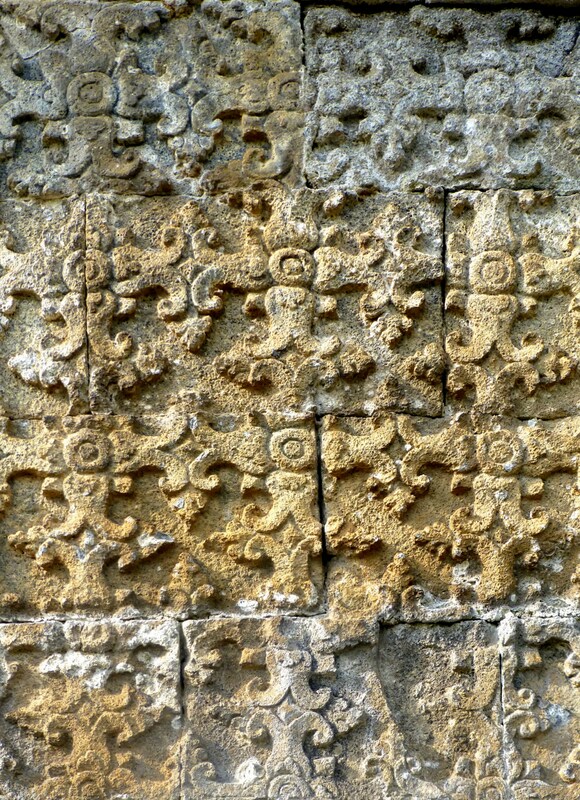 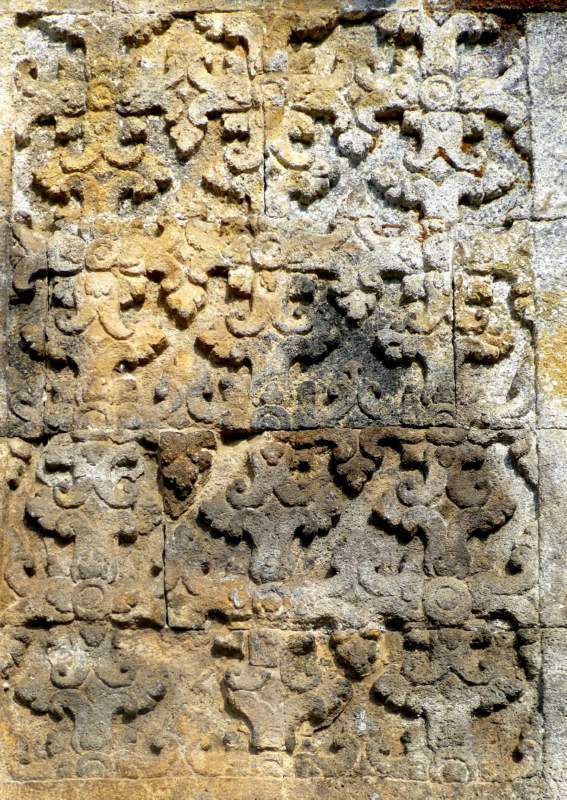 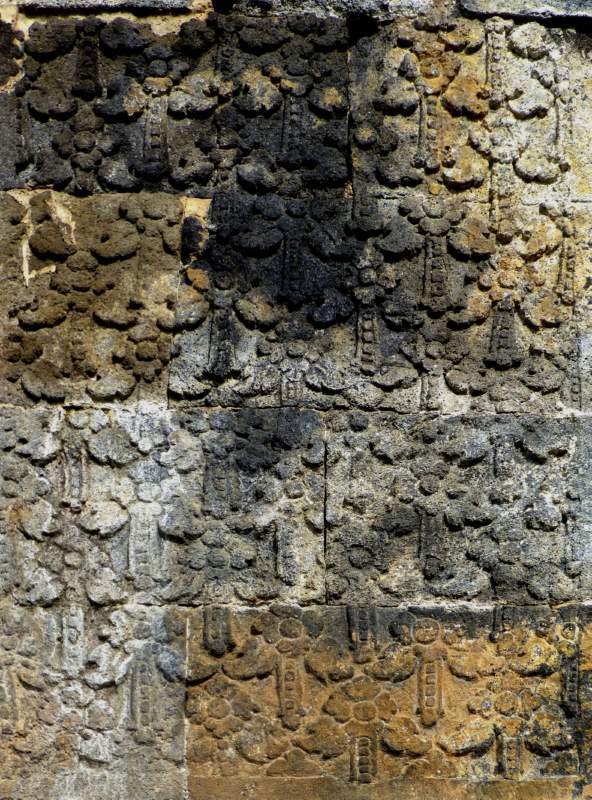 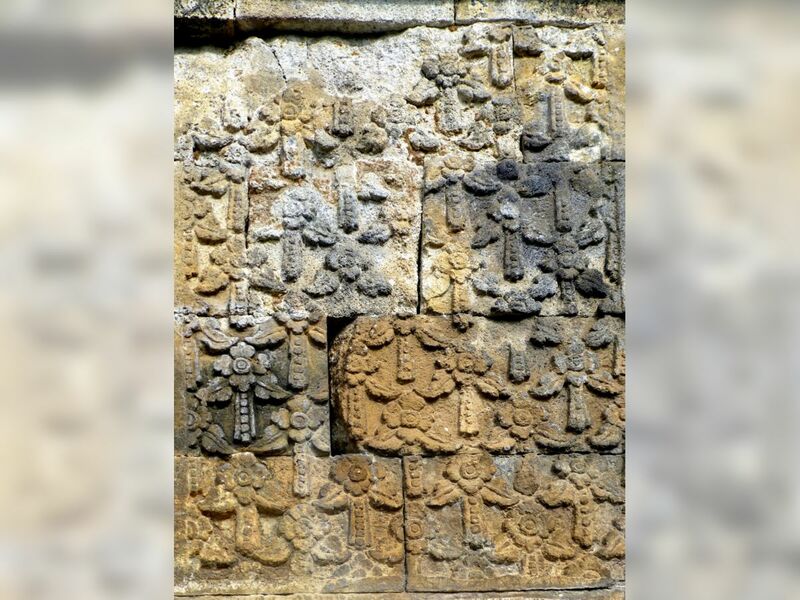 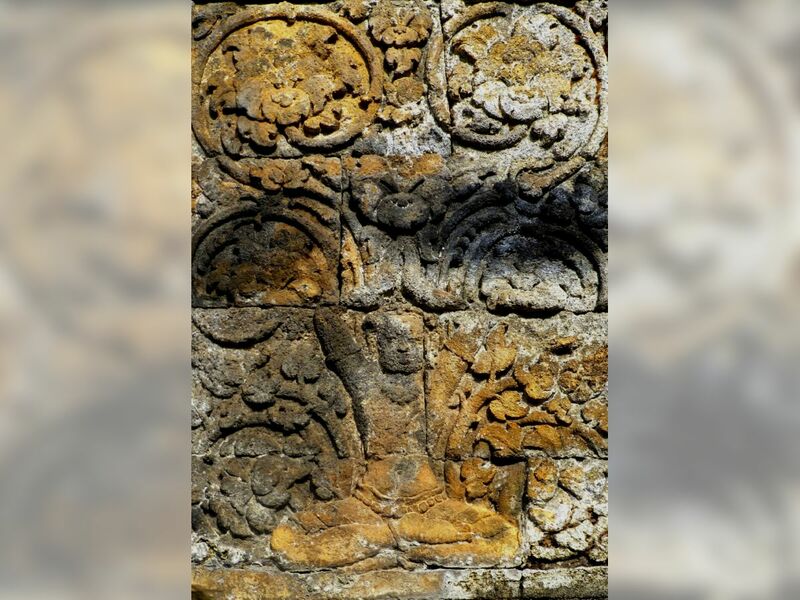 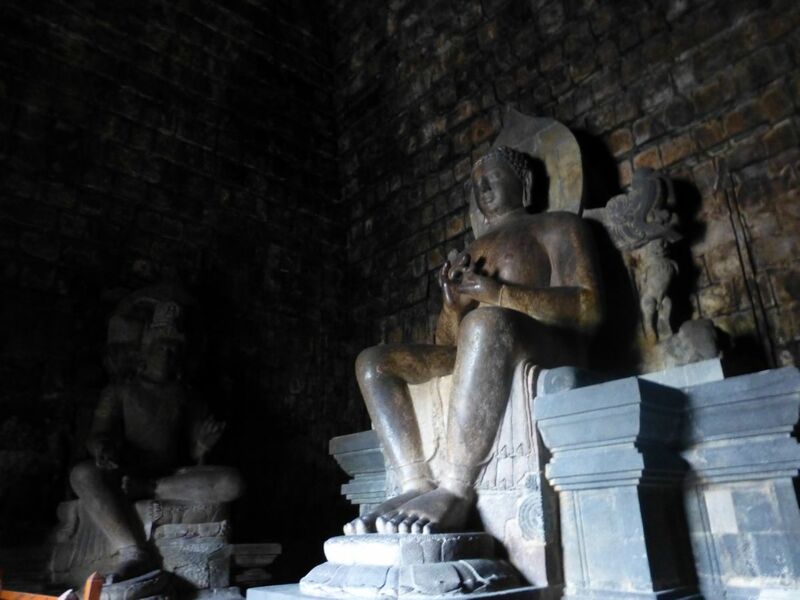 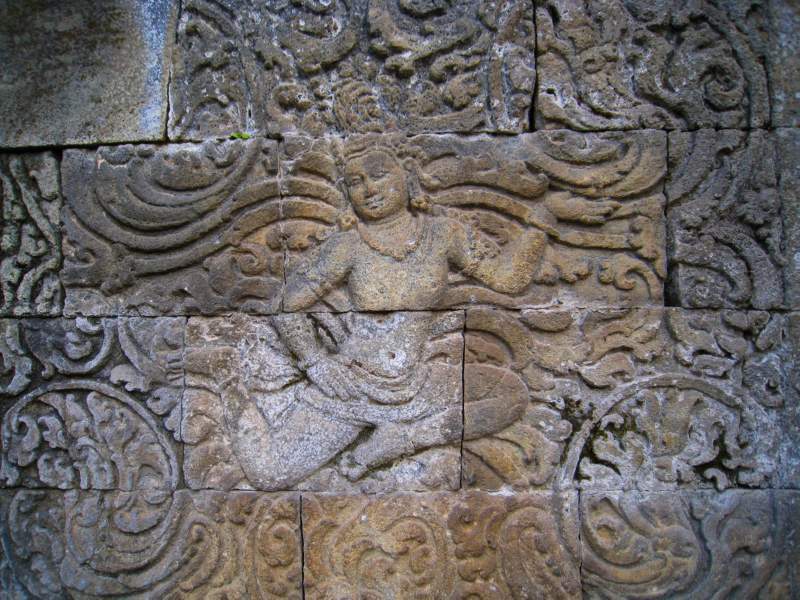 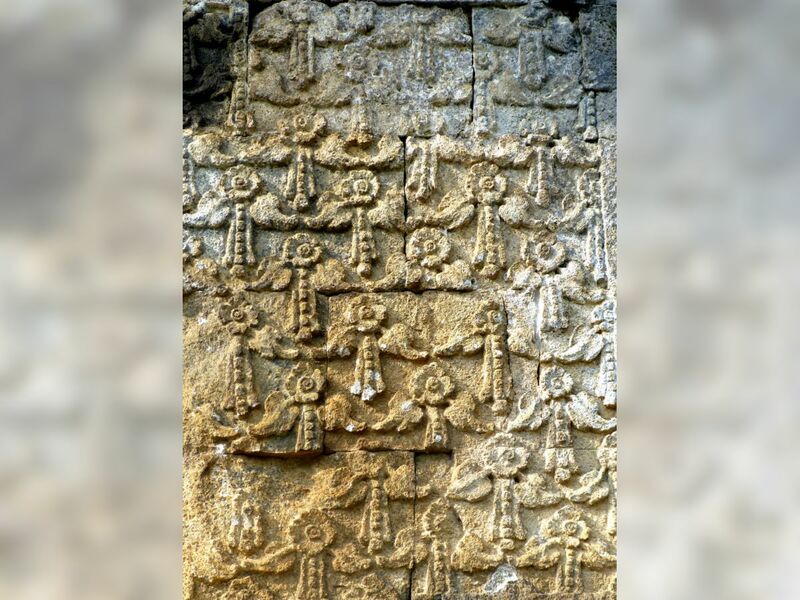 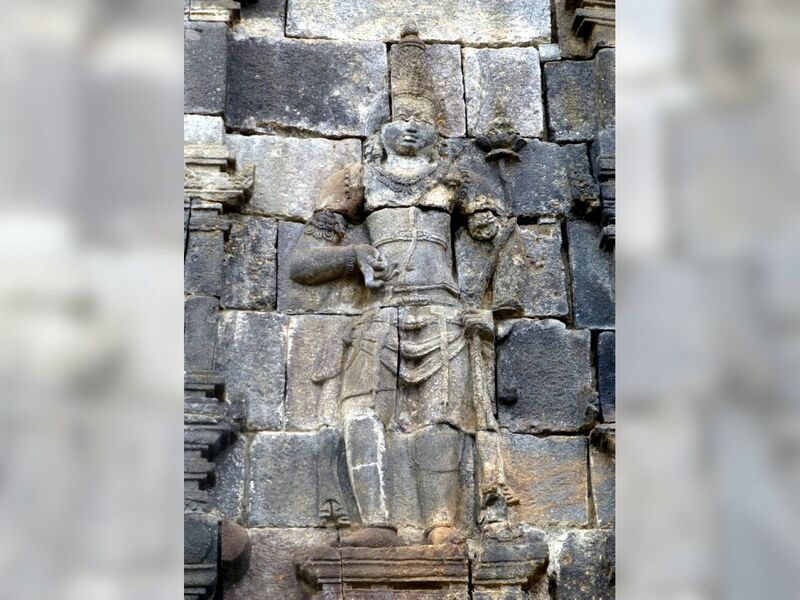 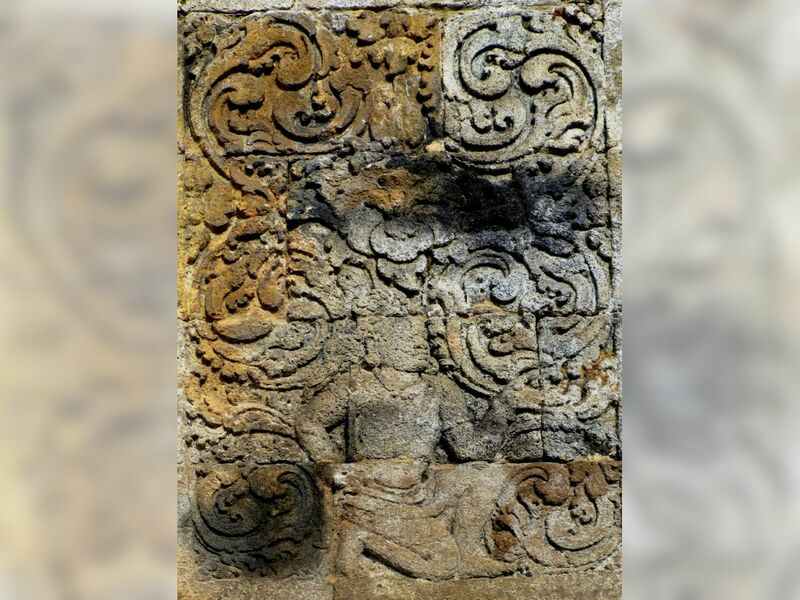 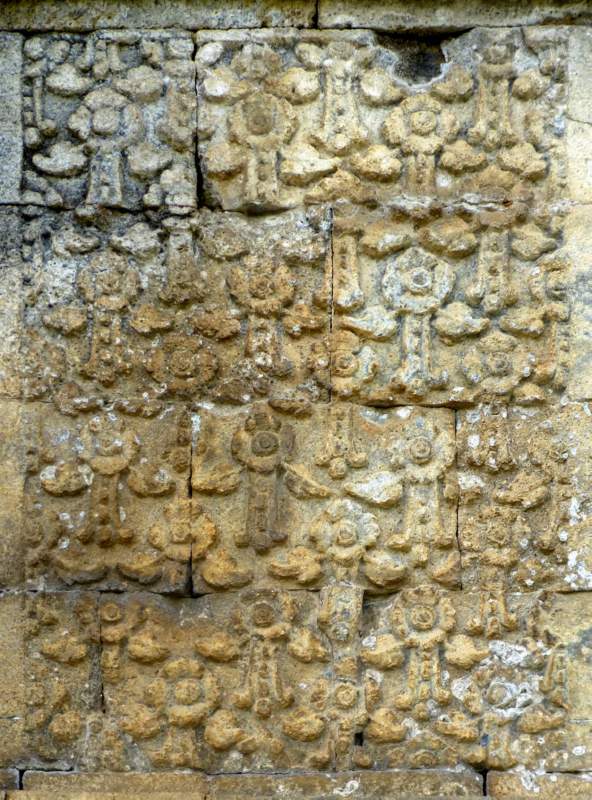 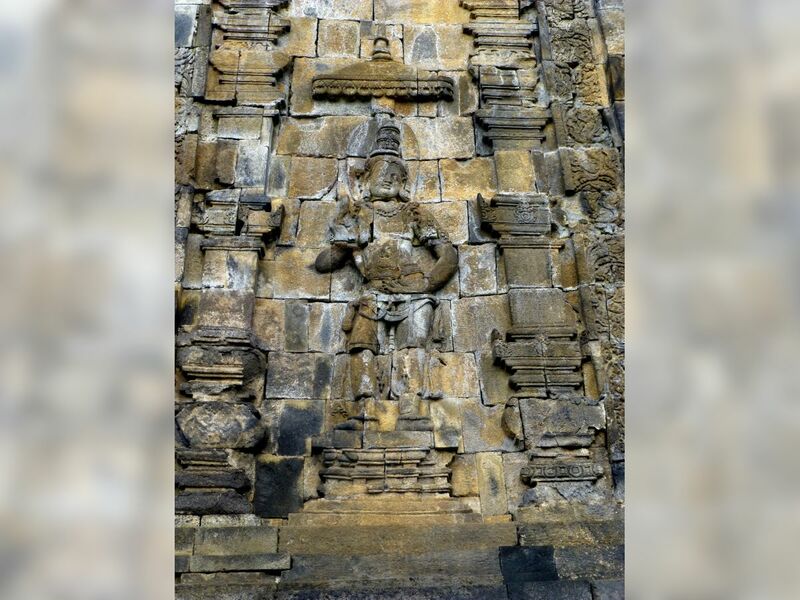 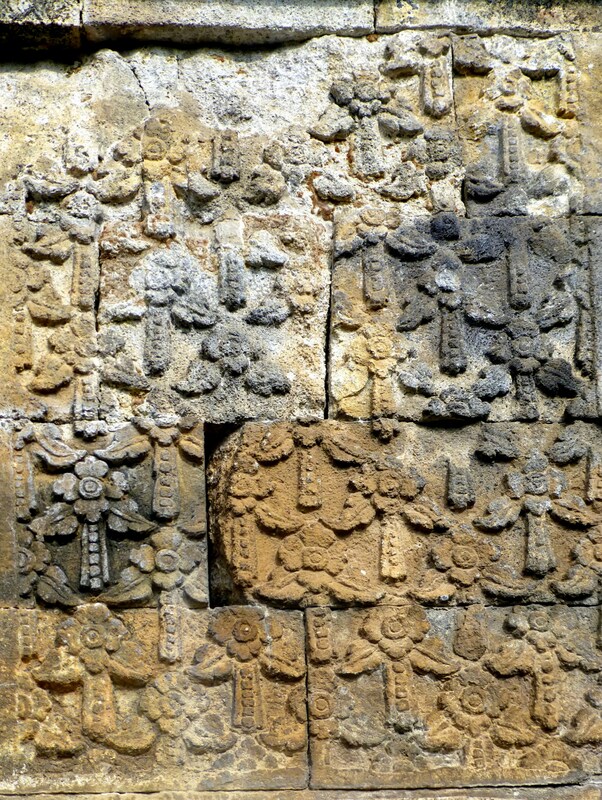 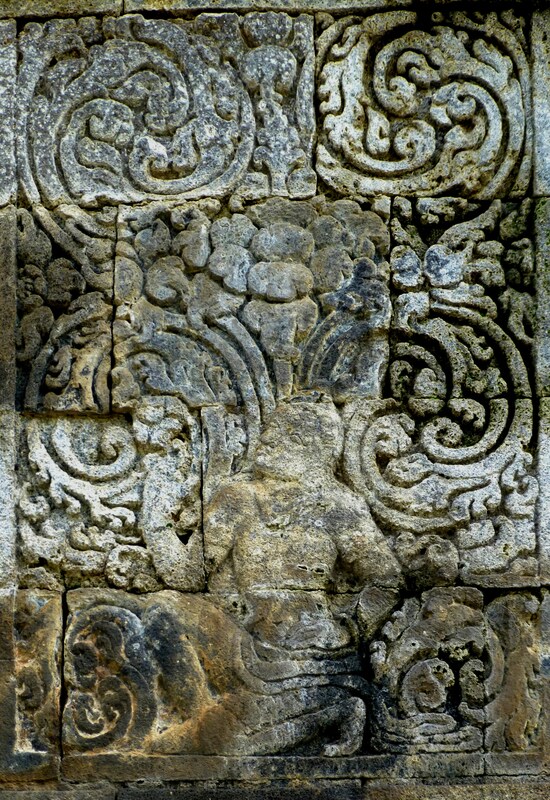 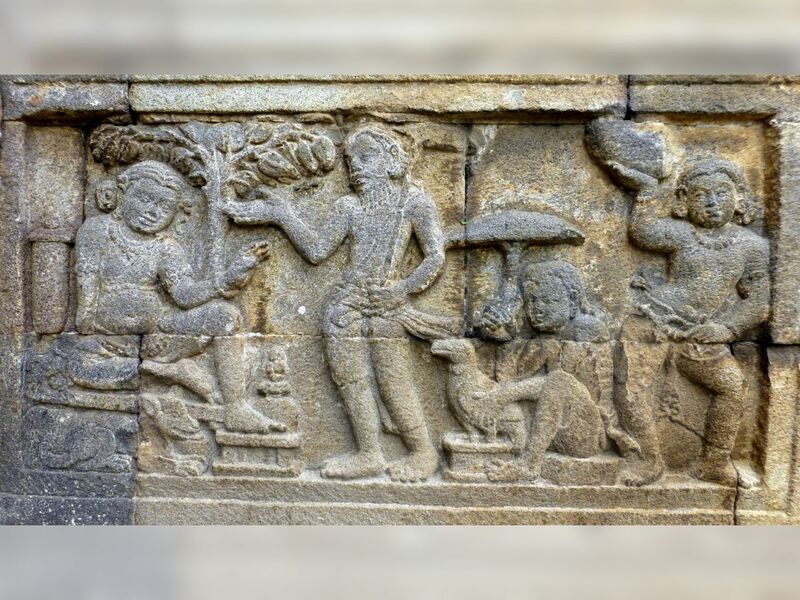 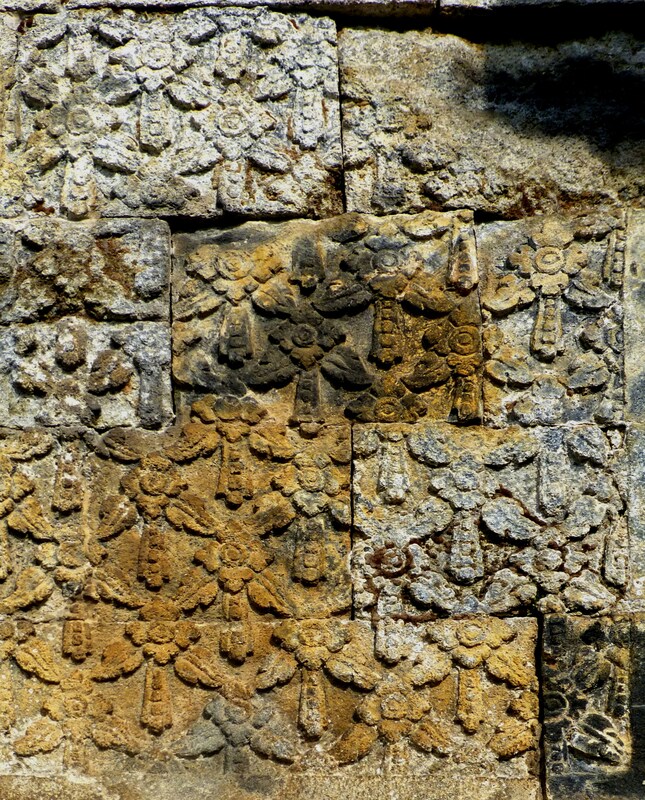 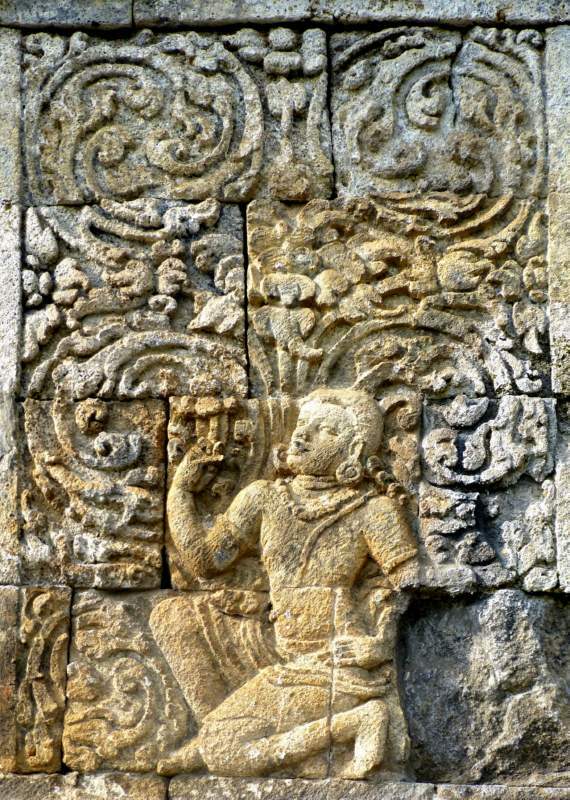 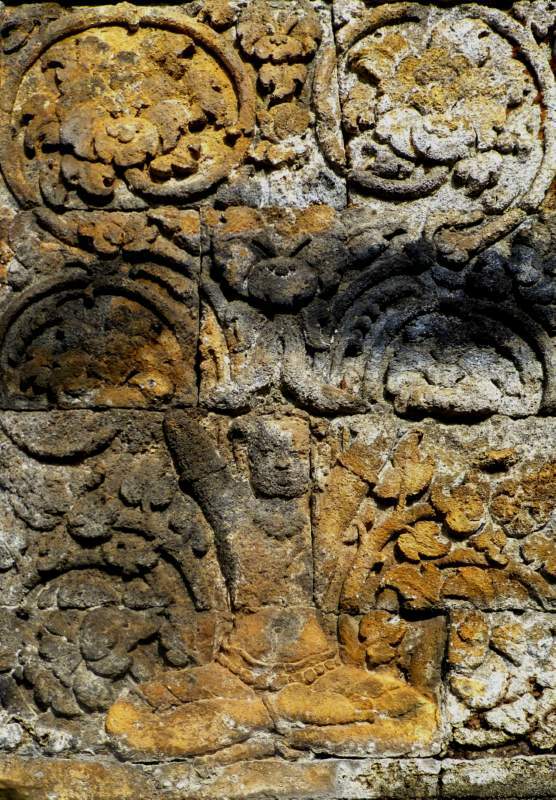 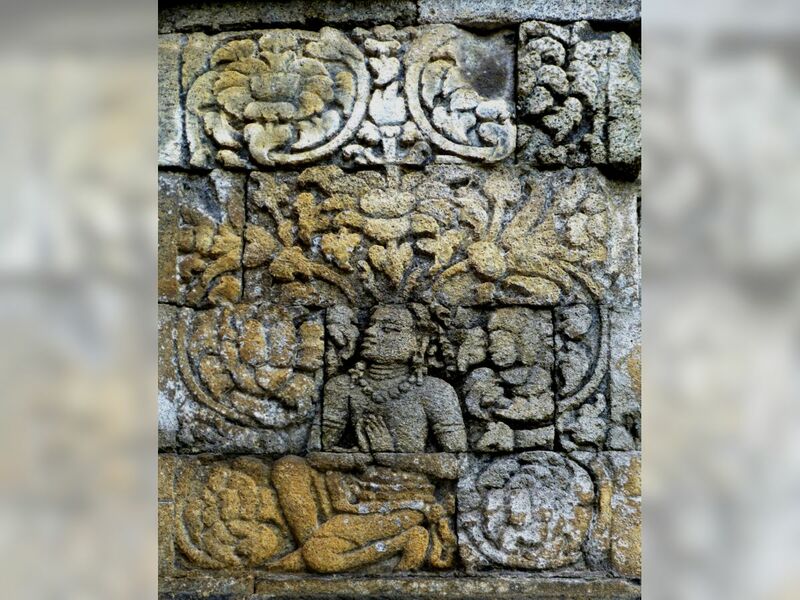 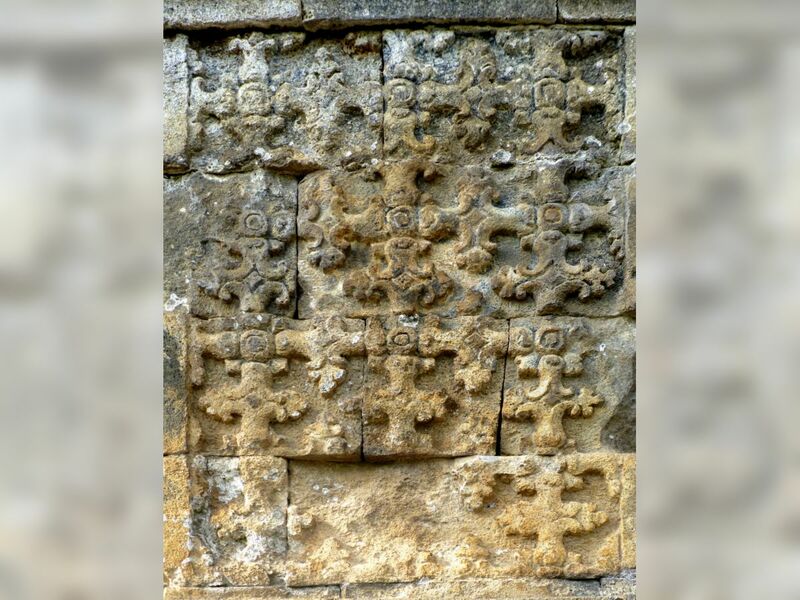 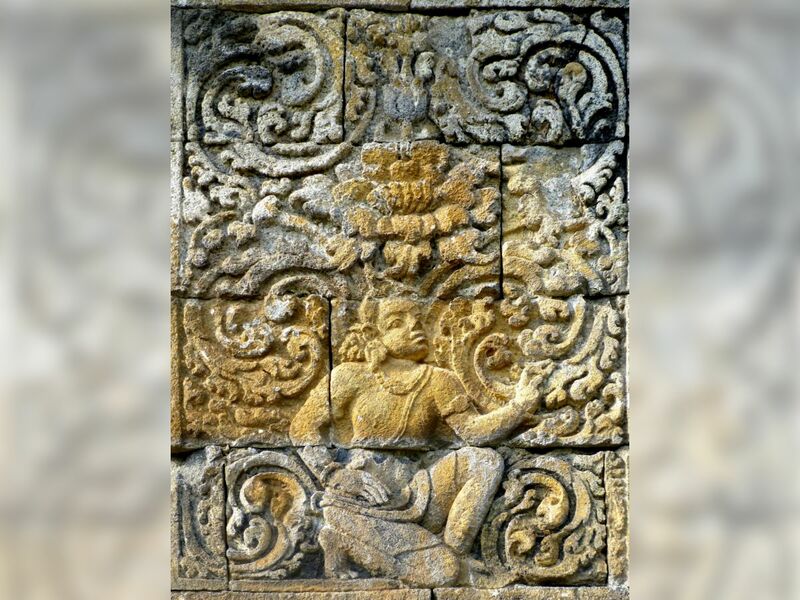 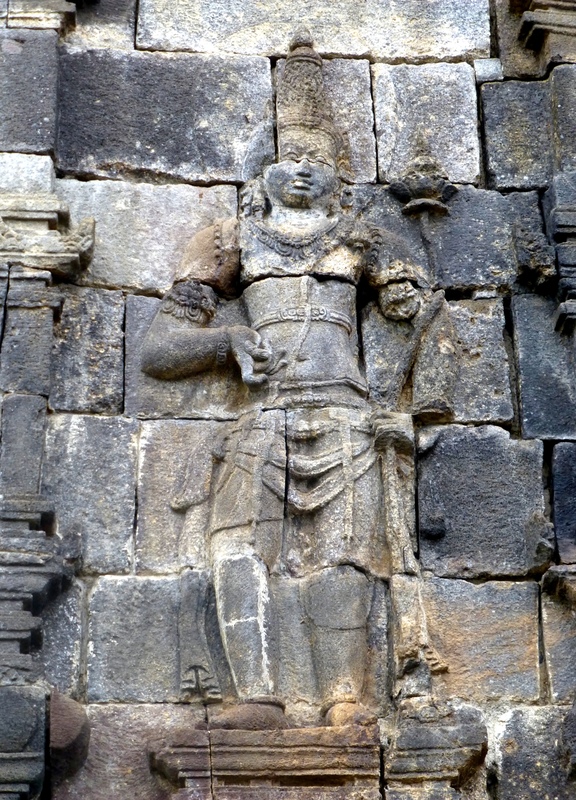 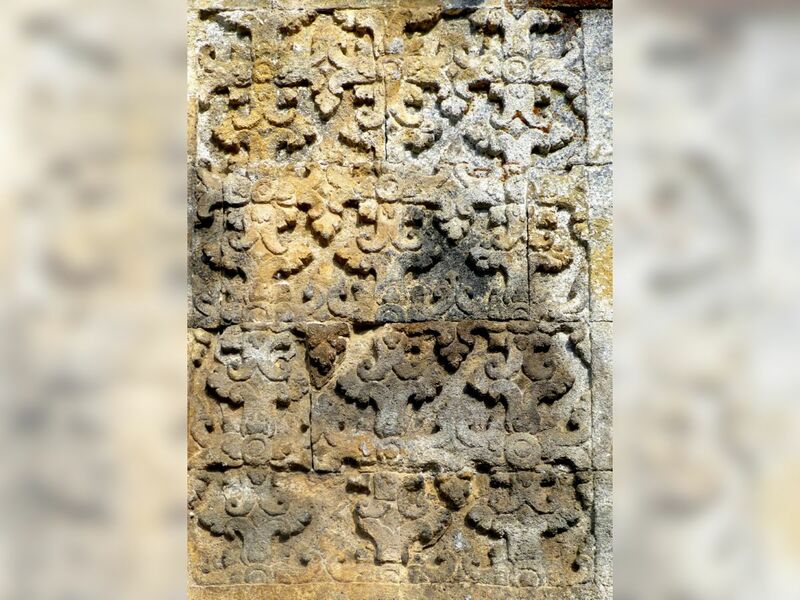 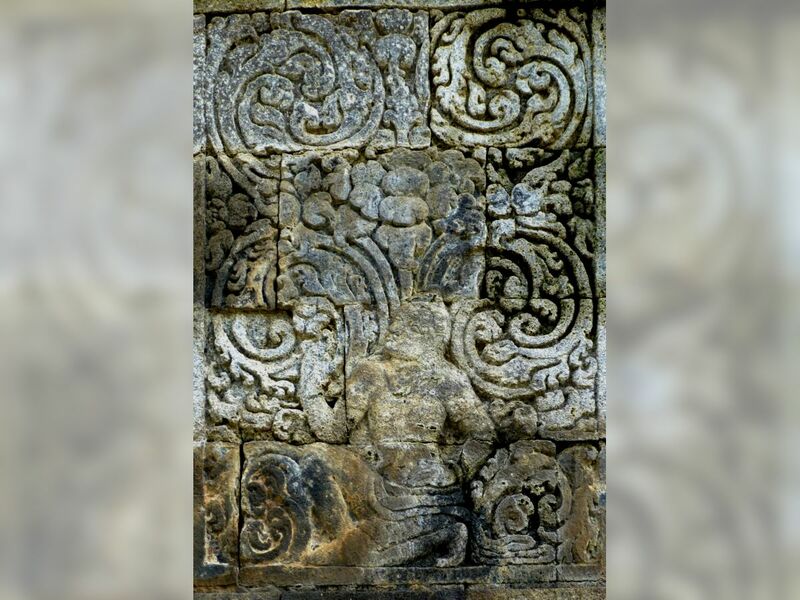 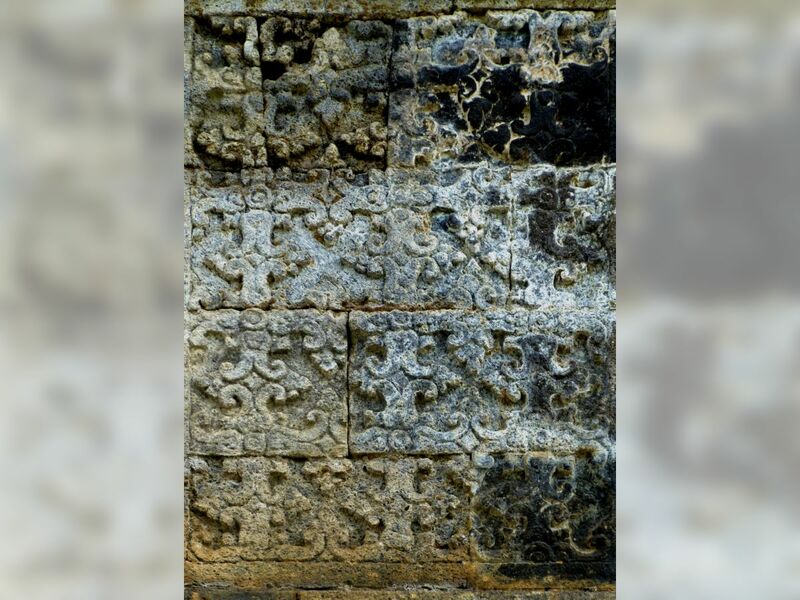 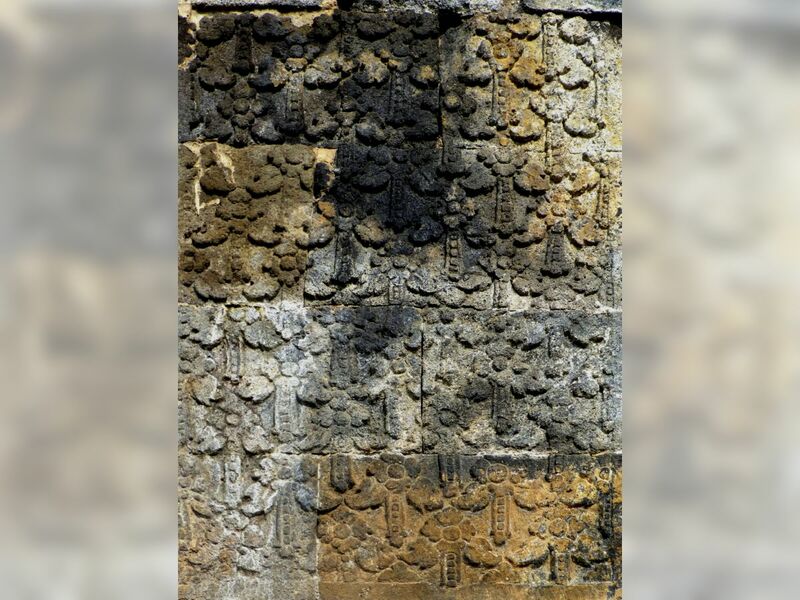 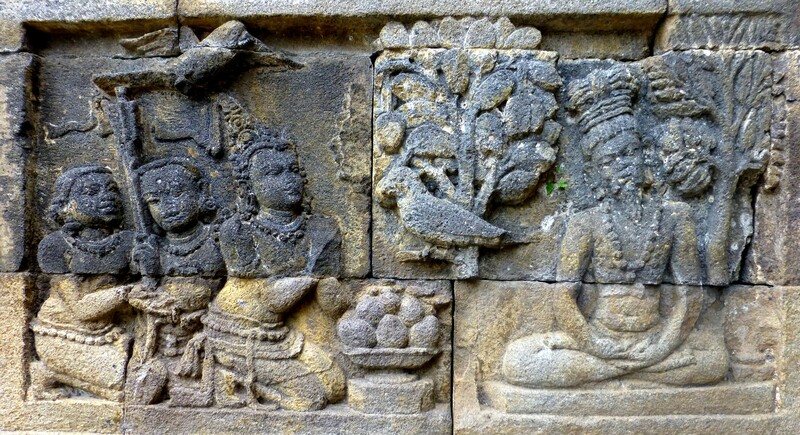 Whereas at Borobudur, and even on the walls of the Candi Mendut, the nimbuses of the divine personages retain, as in Southern India, the simply oval form, those of the three figures rise to a point, like the leaf of the Bodhi-tree, in the Sino-Japanese fashion. 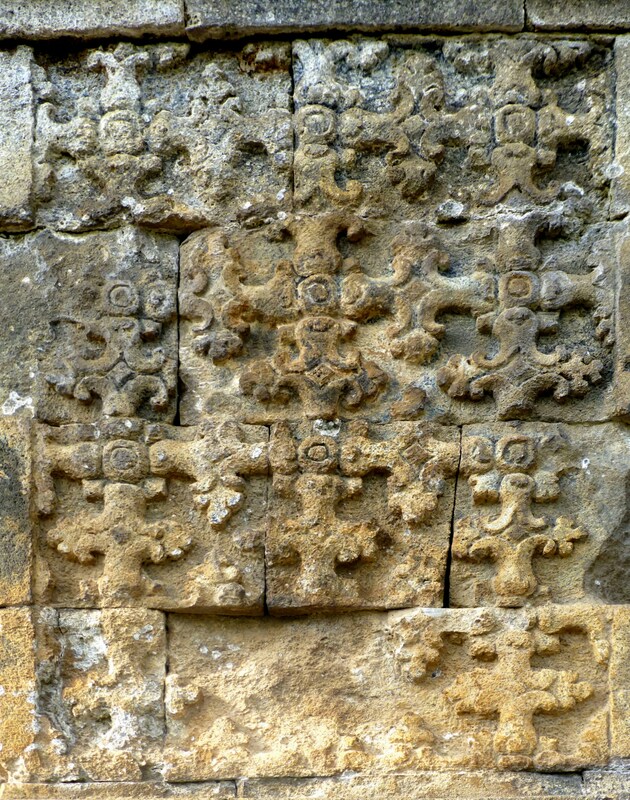 It would be interesting to date as exactly as possible the appearance of this form in Java. It would, in fact, mark with sufficient certainty the moment when the two great currents of artistic influence, which, diverging from their common Indian source, had followed respectively the land routes through Central Asia and the sea route south-eastwards, met again in the island and there, so to speak, closed their circuit. 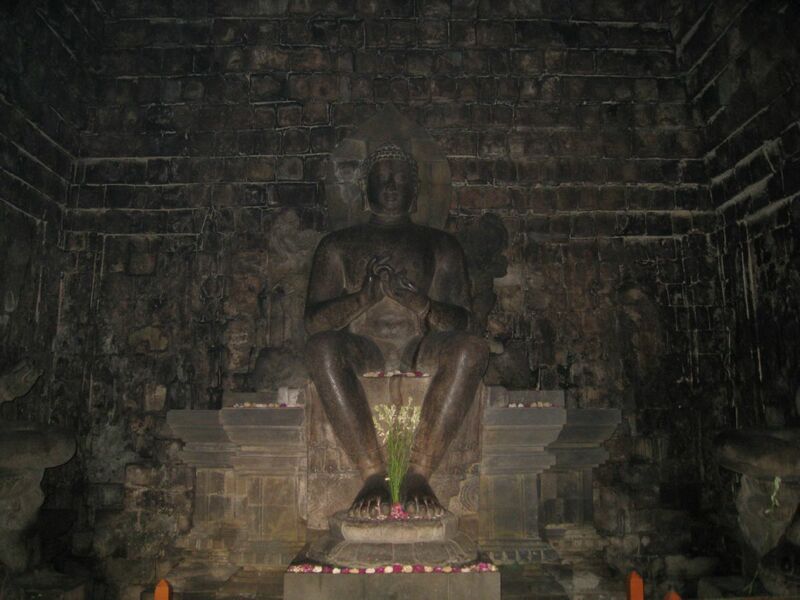 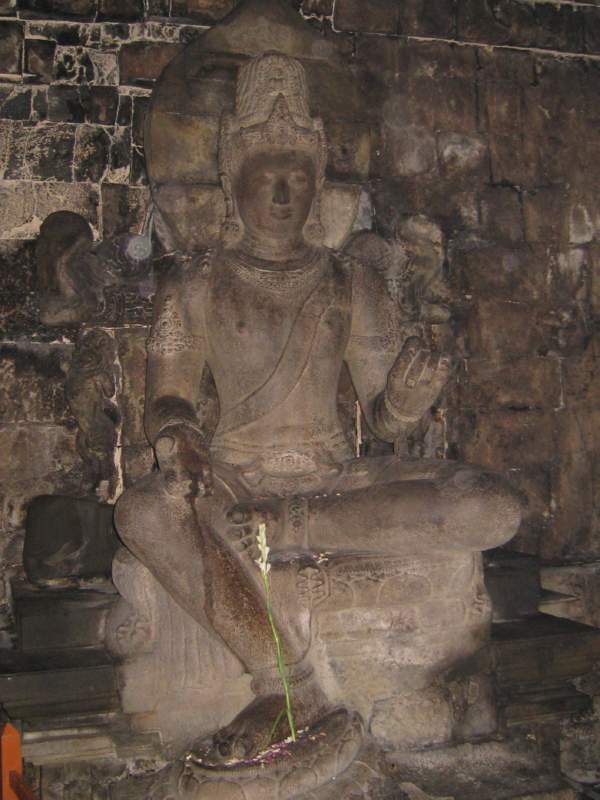 The central statue, about m. 2,50 high, cut out of an enormous block of andesite, represents a Buddha seated in the European manner, the hands joined in the gesture of teaching. 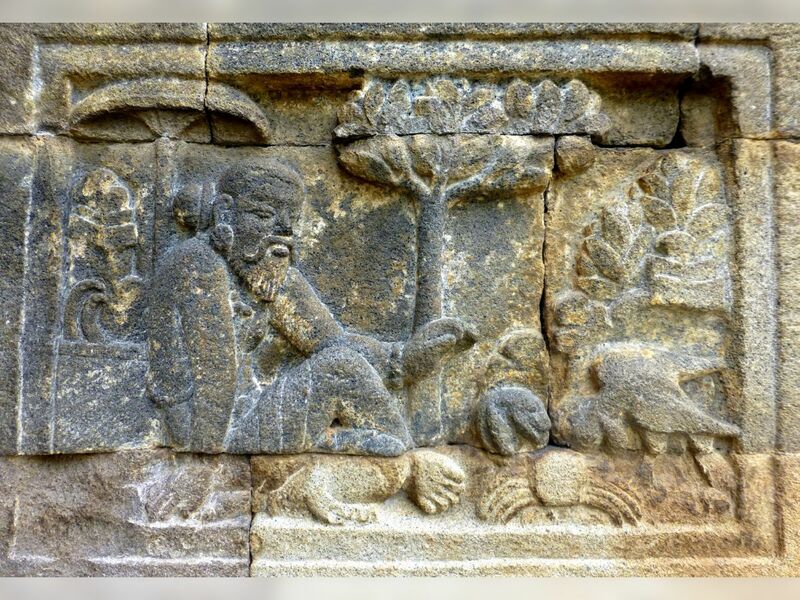 Not only the asana and the mudra, but even the details of the hair, the lotus-stool, the throne with a back, etc., recall in a striking manner the images found at Sarnath, in the northern suburb of Benares, on the traditional site of the master's first preaching. 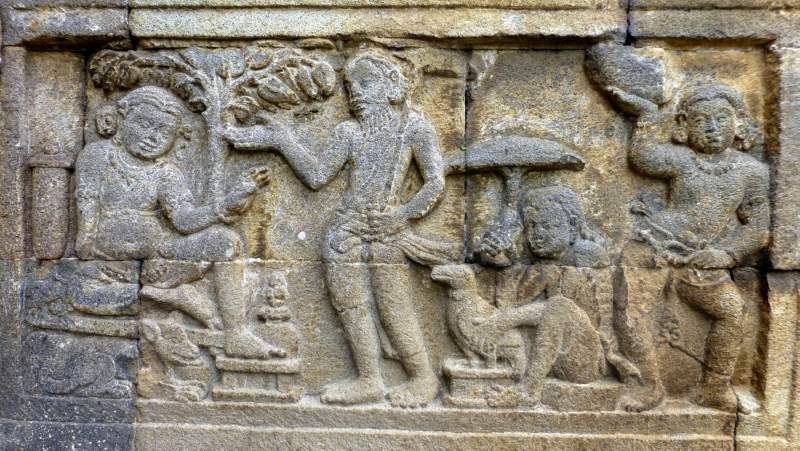 Besides, to cut short all discussion, the lower band of the pedestal is still stamped with a wheel of the law, accompanied by the two characteristic antelopes of the Mrgadava. 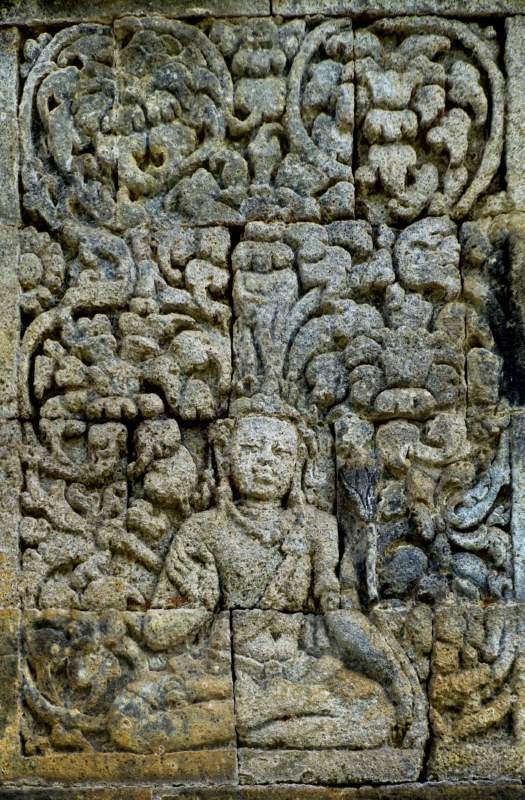 On each side of the teaching Sakyamuni, on a throne having a back likewise adorned with superposed animals, a Bodhisattva is seated in lalitaksepa, the left leg bent back, the right foot hanging down and resting on a lotus. 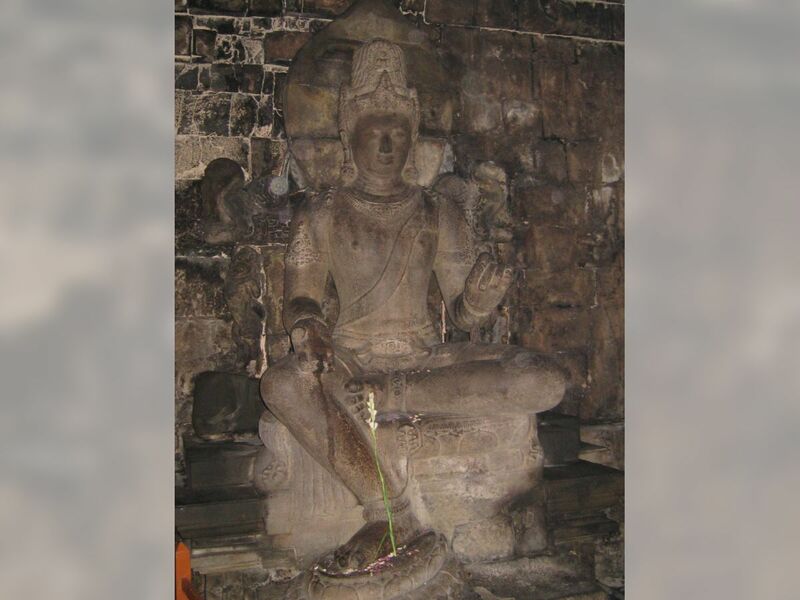 At the  right of Buddha Avalokitesvara may at once be recognized, thanks to the effigy of Amitabha which he bears in his headdress. 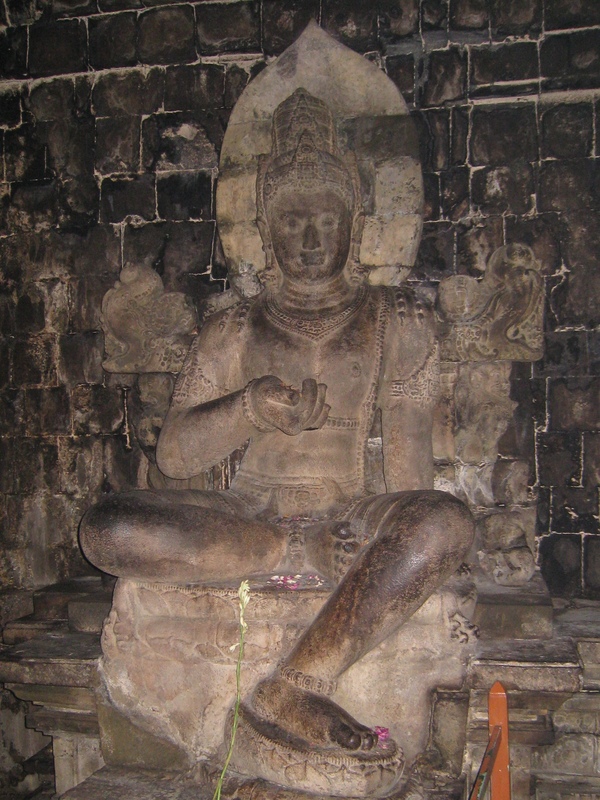 As usual, his right hand makes the gesture of charity; his left is folded back in the position of discussion, but without at the same time holding a lotus. 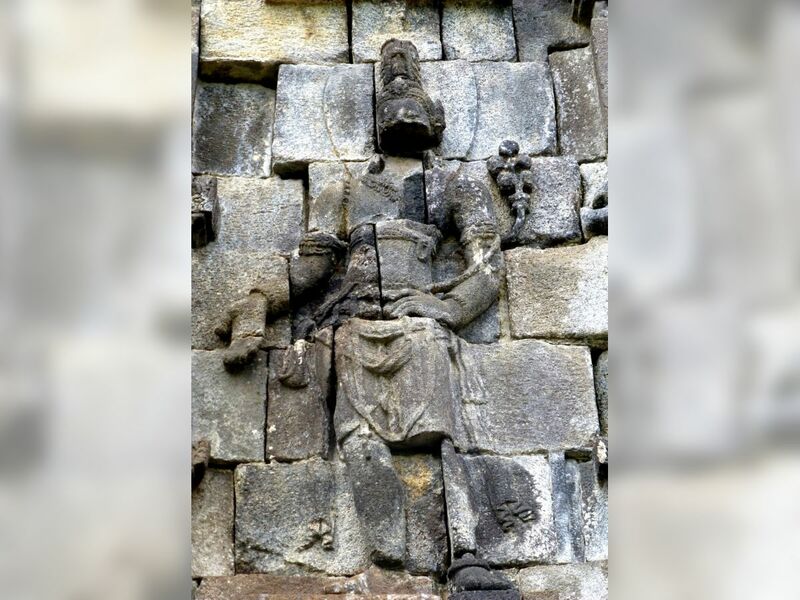 His counterpart, with the palm of his left hand leaning on the ground and the right hand turned back in front of his chest, does not present any particular mark allowing us to determine his identity. It is solely the traditional force of custom which compels us to attribute to him the name of Manjusri : the more so as, after having despoiled these two acolytes of every characteristic attribute, the sculptor must for a means of recognition have relied upon their simple presence by the side of Buddha [this statue has later been identified as the Bodhisattva Vajrapani]. 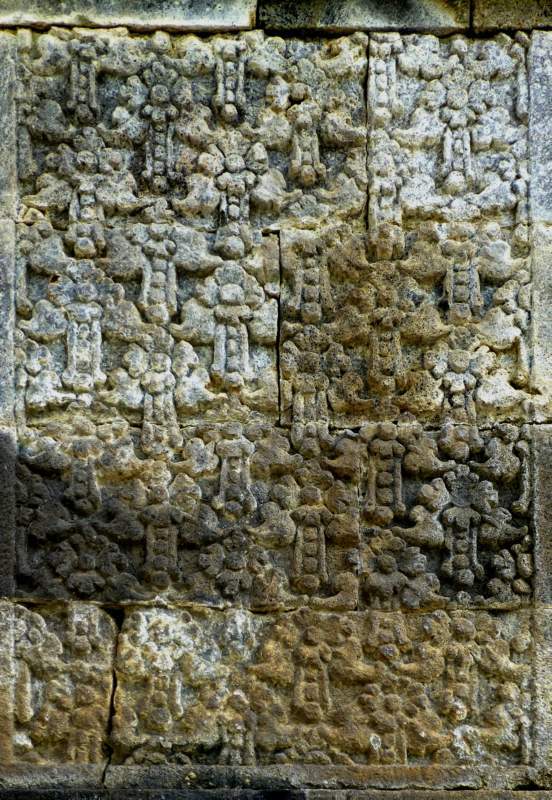 The walls of the vestibule bear on the right and left, in panels of about m. 1,90 x m. 1, figures of the genius of wealth and his wife Hariti. 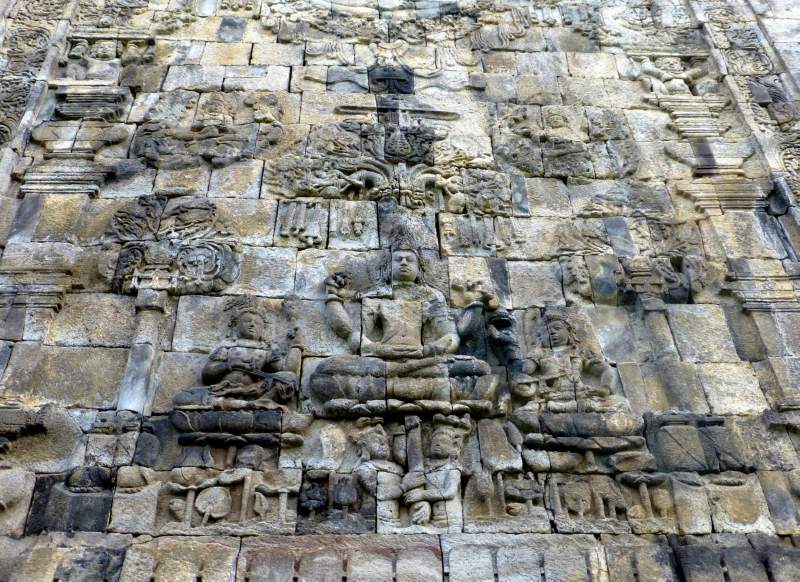 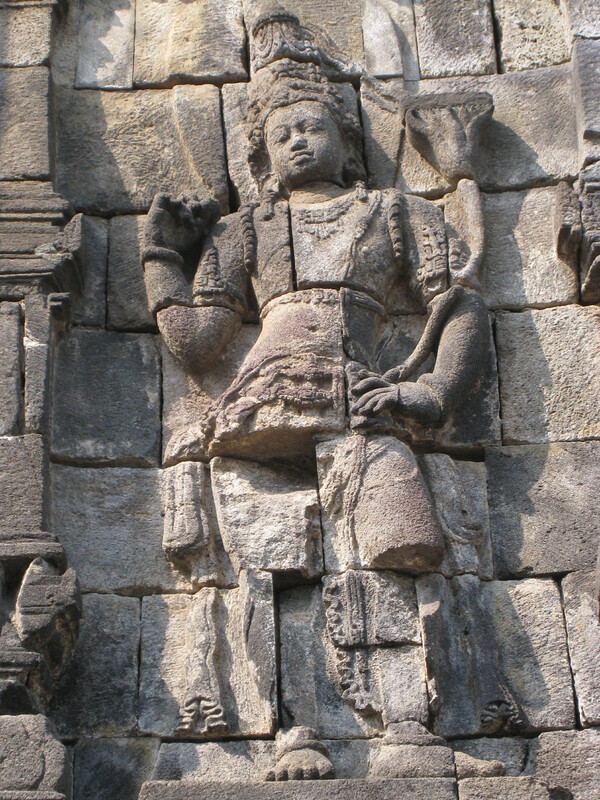 Of the principal facade of the temple - exceptionally oriented towards the north-west instead of to the east - only the wall to the left of the entrance is preserved; it bears a standing Bodhisattva, holding a lotus surmounted by a stupa : it seems that we must by this sign recognize Maitreya. If we now commence on the terrace the pradaksina of the monument, we come first to the north-eastern facade. 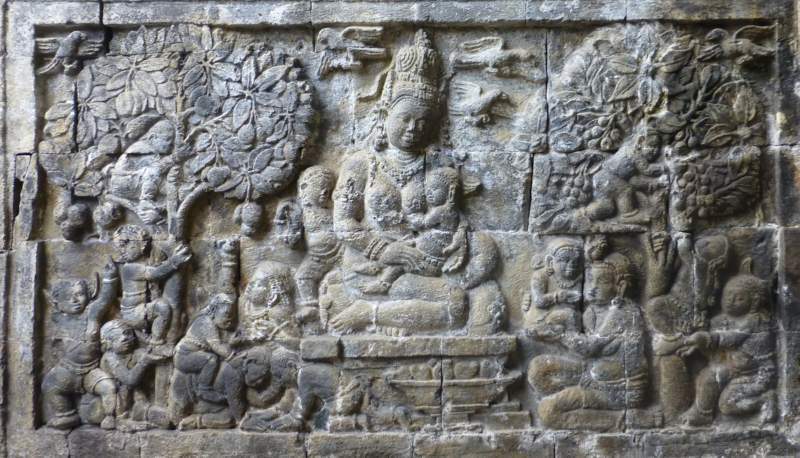 In the middle of the central panel, framed by pilasters bearing atlantes in their capitals, we see, seated on a throne covered with a lotus and under a stereotyped tree, a feminine divinity with eight arms. 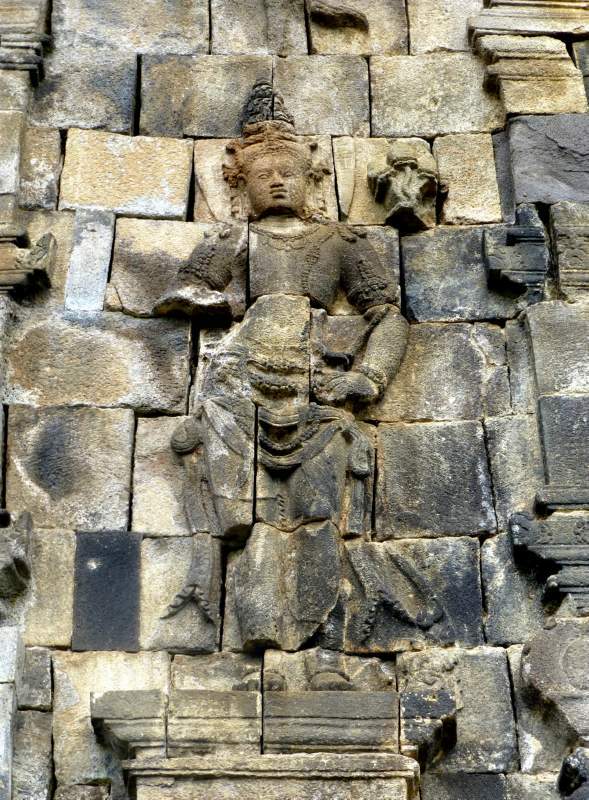 Unfortunately the head is broken; but it seems, in fact, that it had only one face; and this  suffices to put aside the identification with the Vajra-Tara with four faces in favour of Cunda. 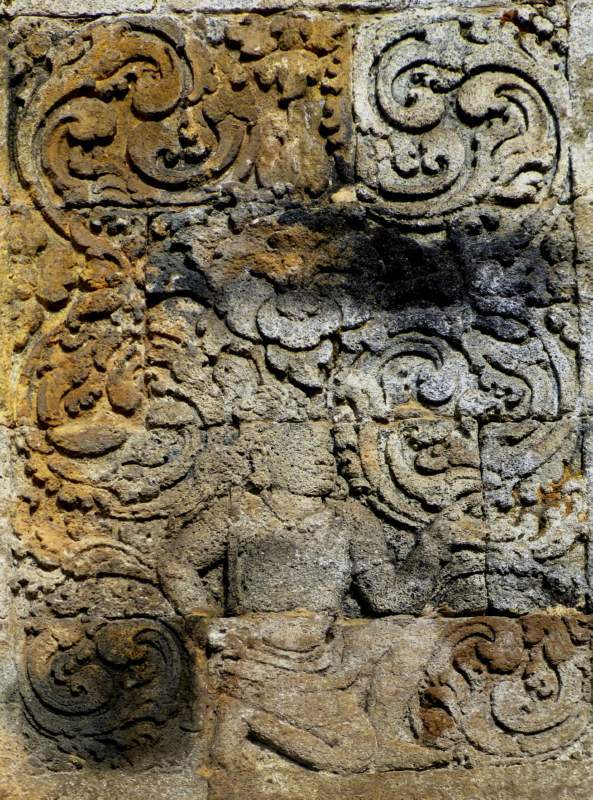 Her right arms do hold the shell, the thunderbolt, the disc, and the rosary. 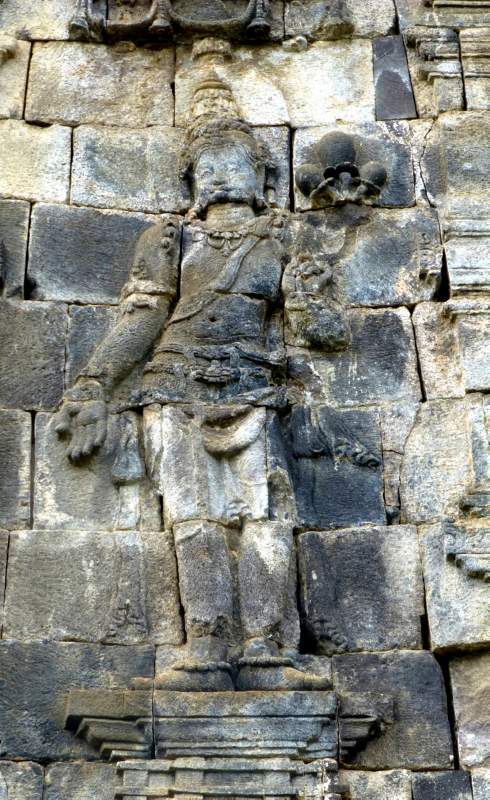 Of her left arms, the first from the top is broken; the three others carry an elephant's hook (ankusa), an arrow, and some object which we could not distinguish. 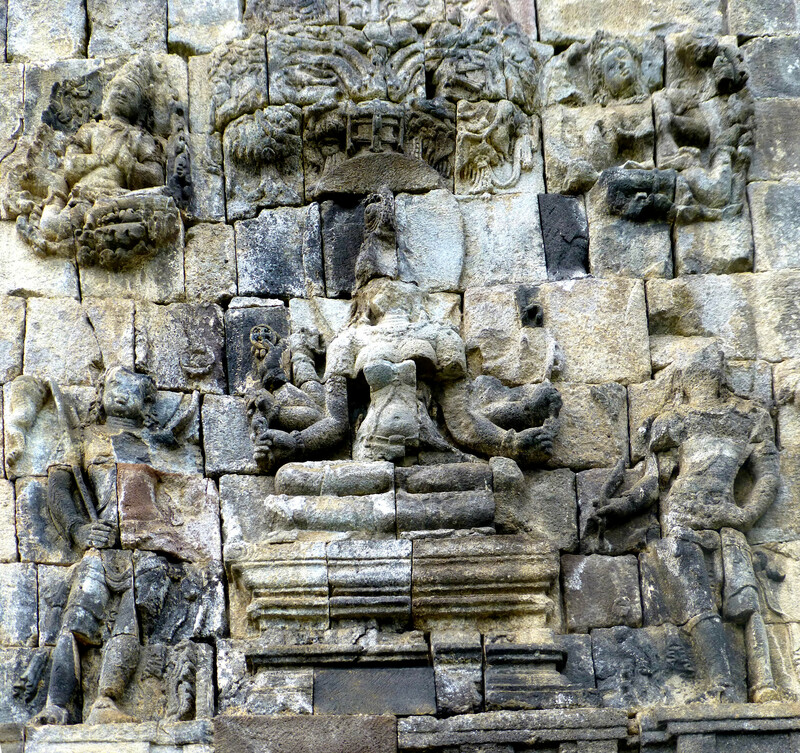 On either side stands a Bodhisattva holding a flyflap : the one on the right has further the pink lotus of Avalokitesvara, the one on the left the blue lotus of Manjusri. Finally, on the two lateral panels, the same standing Bodhisattva, his right hand in the varamudra, bears a flower quite analogous to the nagapuspa of Maitreya. 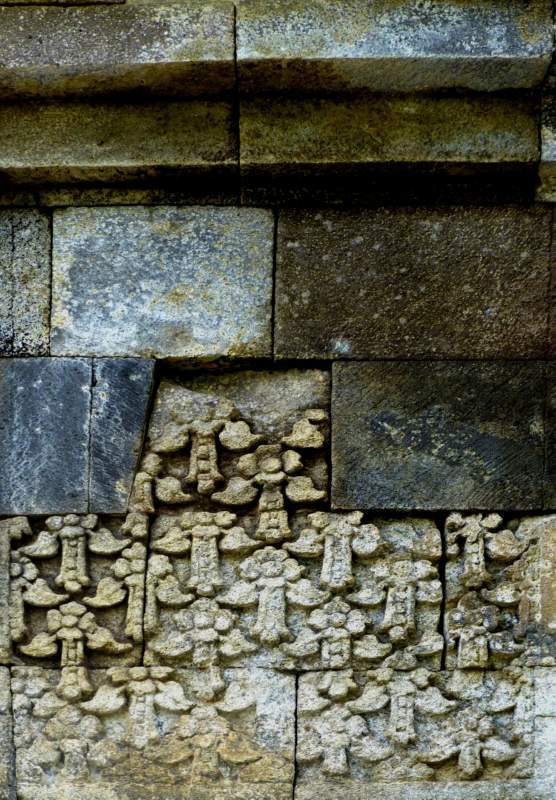 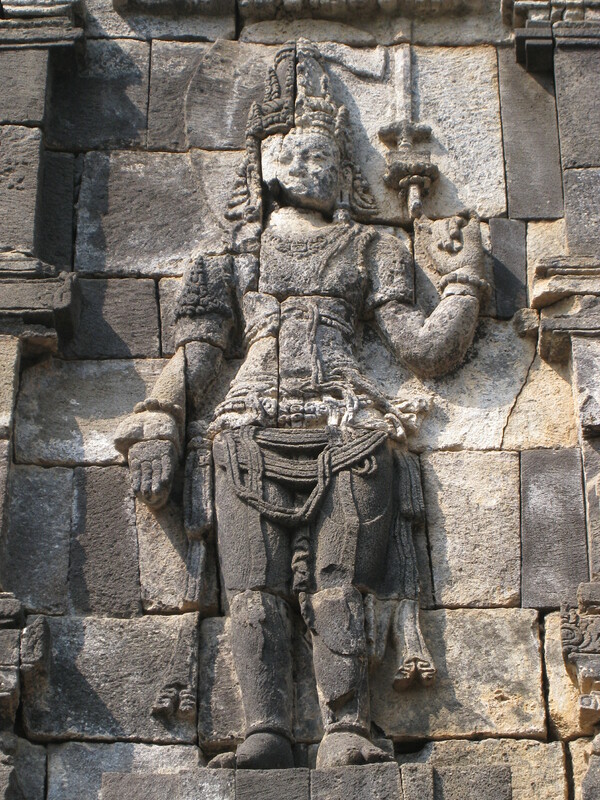 On the next facade the central figure is an Avalokitesvara with four arms. One of its right arms, which is broken, must have been lowered in the gesture of giving, whilst the other holds up a rosary. 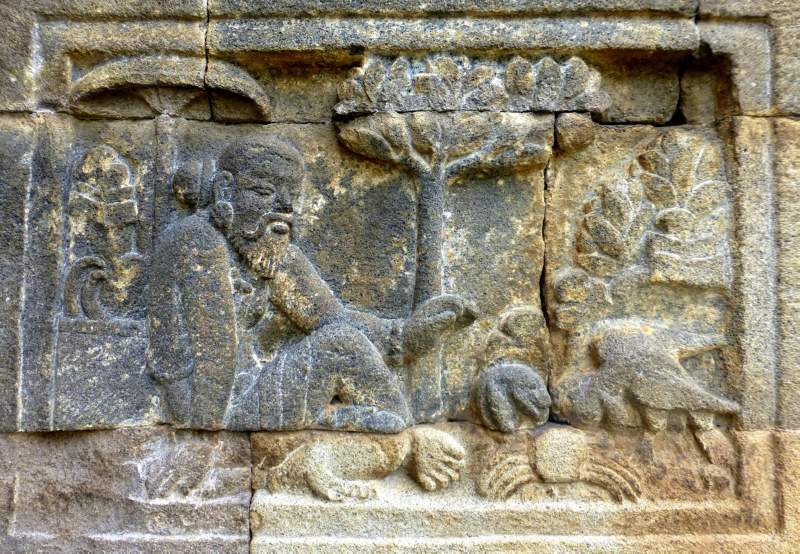 A pink lotus and a book adorn the left hands; the flagon of ambrosia rests upon another lotus on the same side. 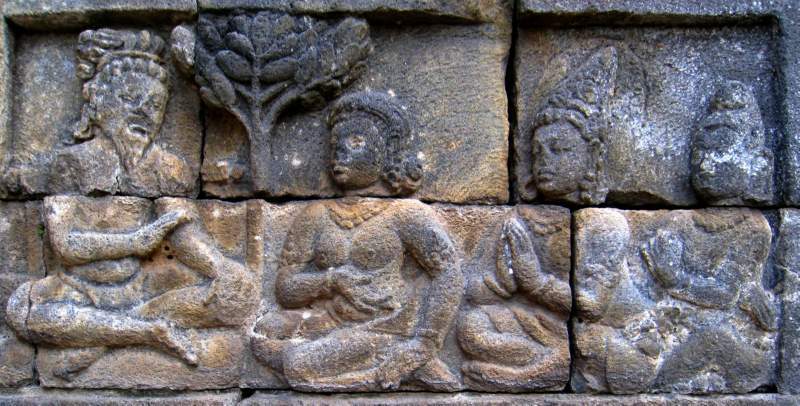 Two feminine attendants, doubtless forms of Tara, worship him. 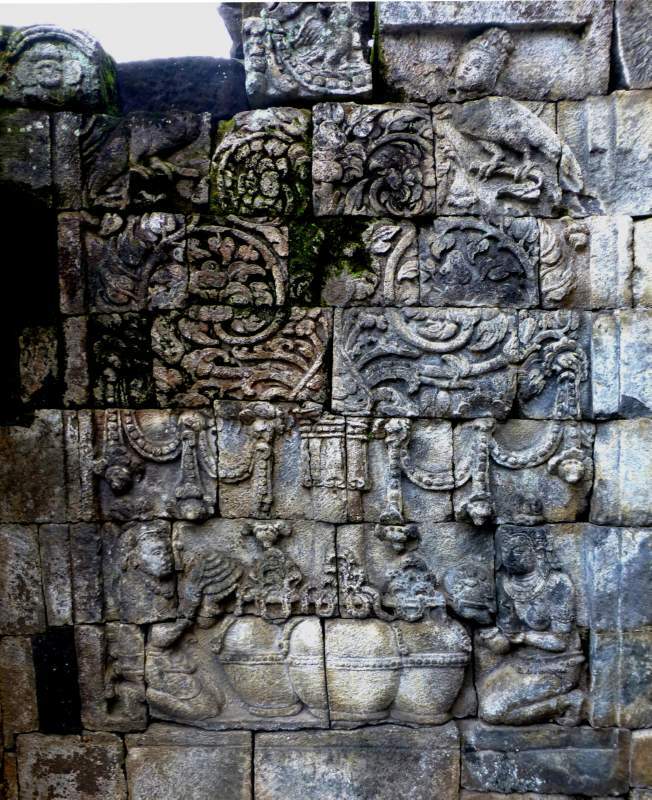 In the Bodhisattvas figured on the two lateral panels the thunderbolt with which both are armed proclaims Vajrapani. The principal figure of the south-western, and last facade is again feminine. 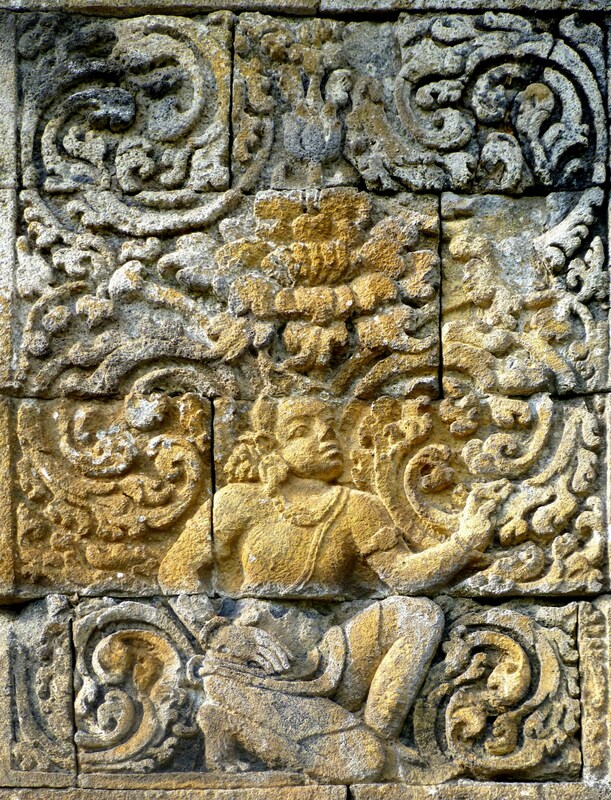 She is seated in the Indian manner upon a lotus supported by two nagas. 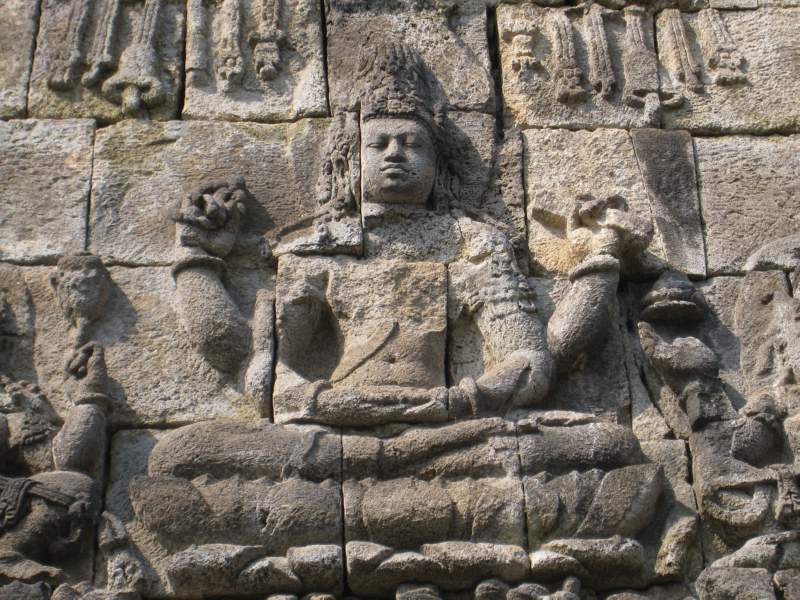 The two attributes of the upper pair of hands, on the right the rosary and on the left the book, should indicate the Prajnaparamita with four arms. But in that case the normal hands should make the gesture of teaching, instead of that of meditation. 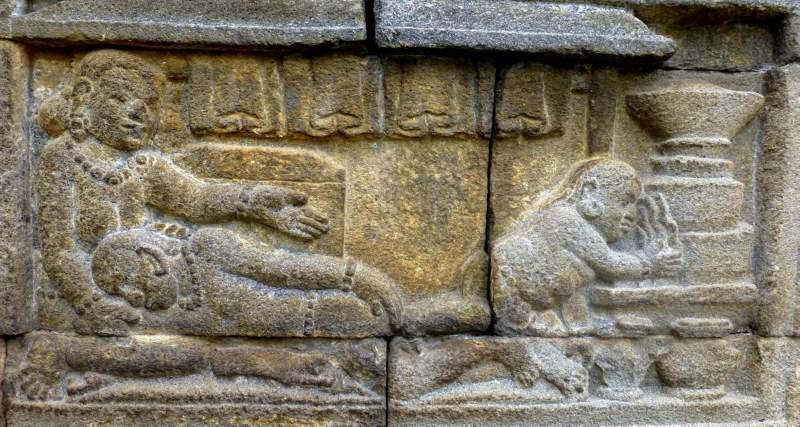 Similarly, if she were a four-armed Tara, the first right hand should make the gesture of charity. 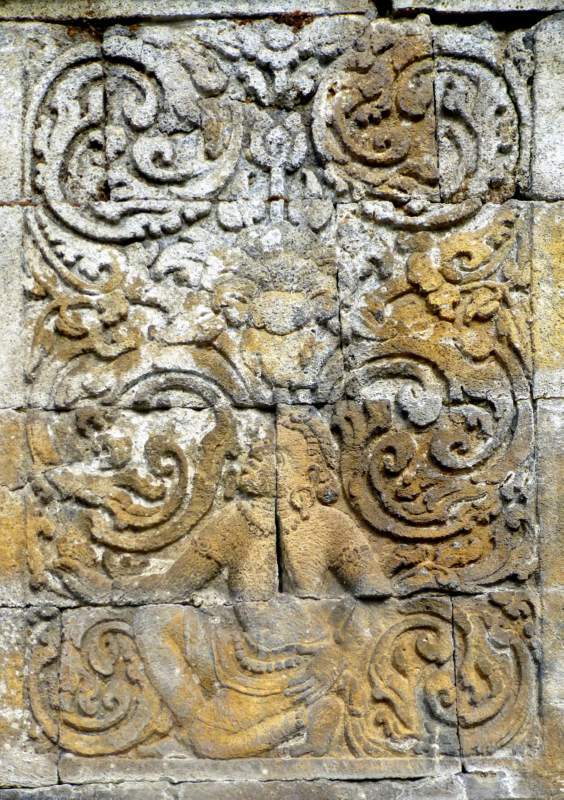 The symbols and the attitudes  combine, therefore, to indicate a second representation of the goddess Cunda, the form with four arms. 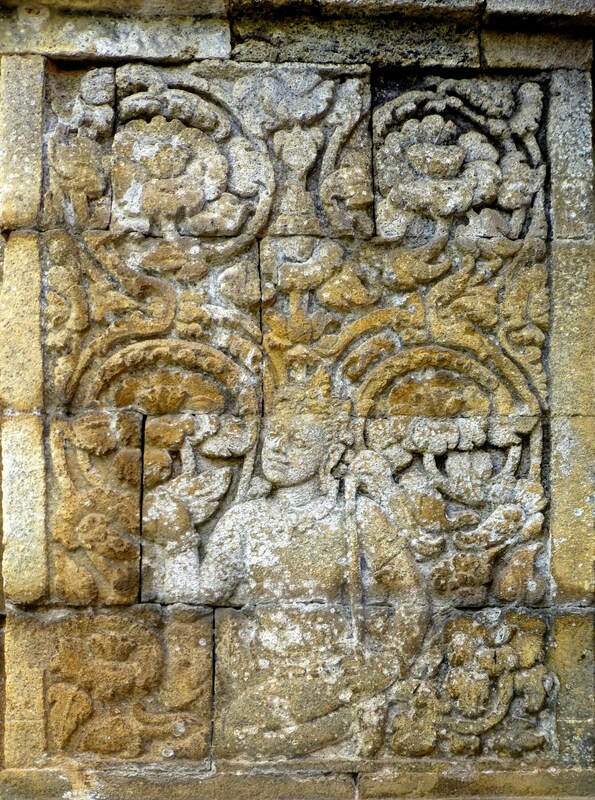 The two Bodhisattvas, her attendants, reproduce exactly those of her counterpart on the opposite facade. 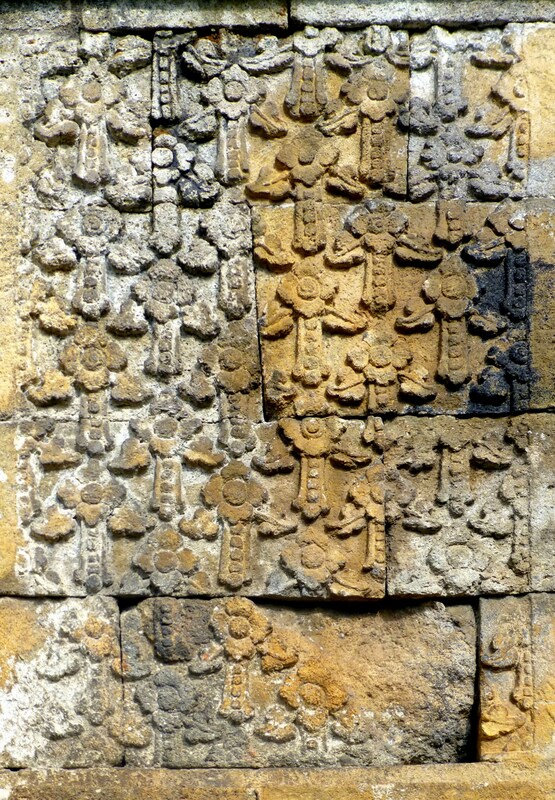 As regards those of the lateral panels, they carry on blue lotuses a sword and a book respectively : we must, therefore, see in them two replicas of the same Manjusri, of whom these are the two traditional emblems. 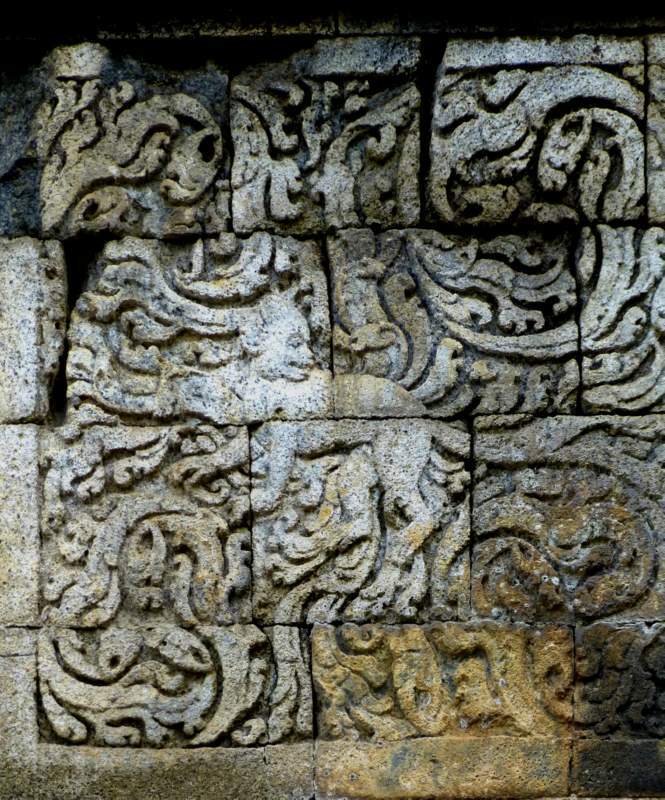 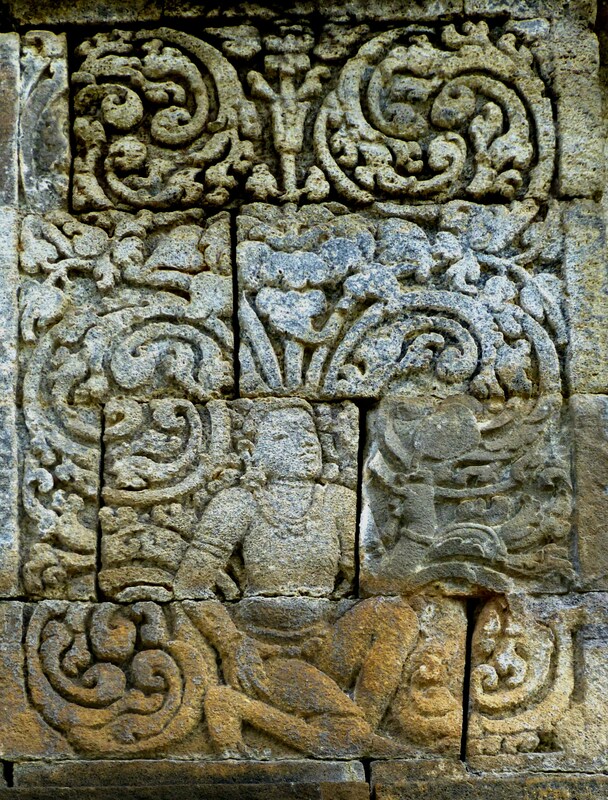 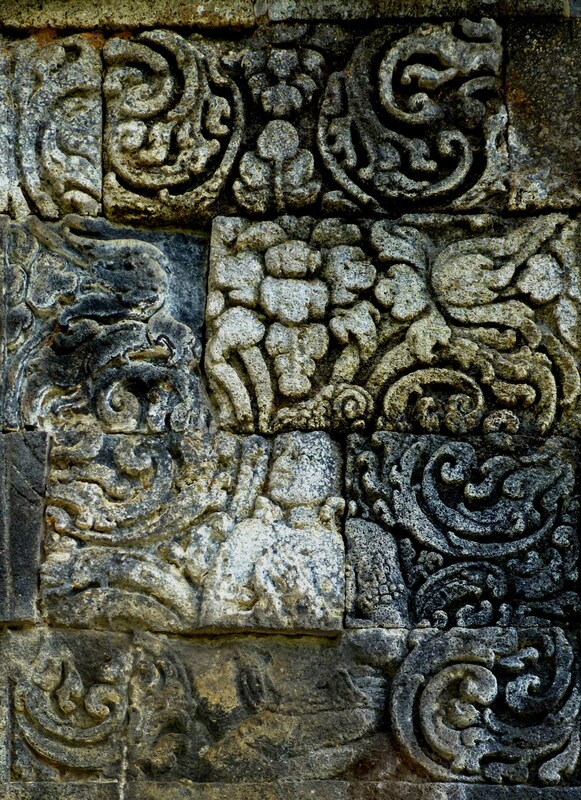 To sum up: in the personages who decorate the exterior of the three unpierced faces of the temple of Mendut we propose at first sight to recognize, in the middle, two images of Cunda with four and eight arms, and one of Avalokitesvara with four arms; on the sides, two replicas each of Maitreya, Vajrapani and Manjusri : all being important figures of the Buddhist pantheon. 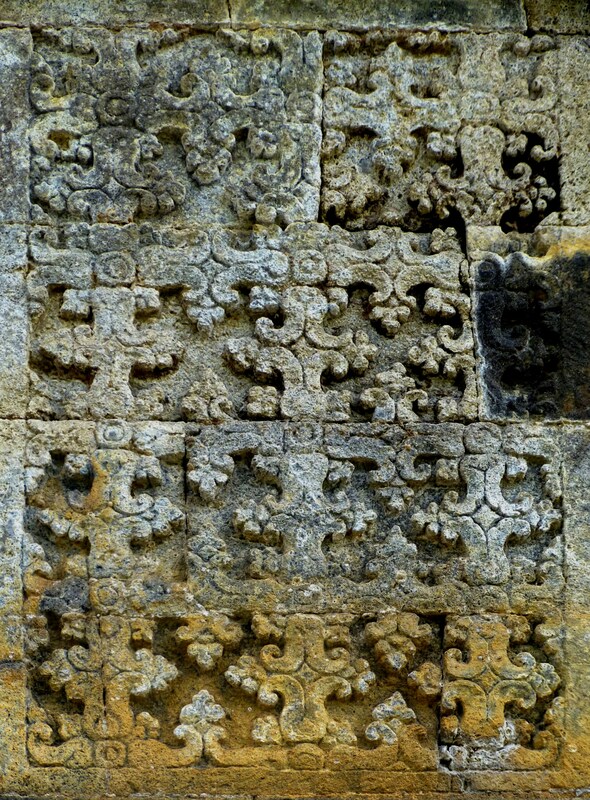 But, naturally, this preliminary review would have to be severely tested. 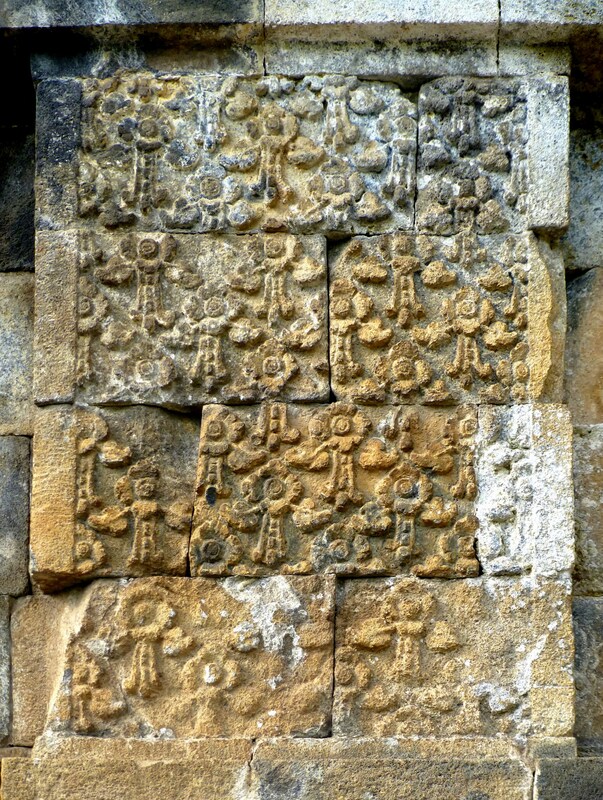 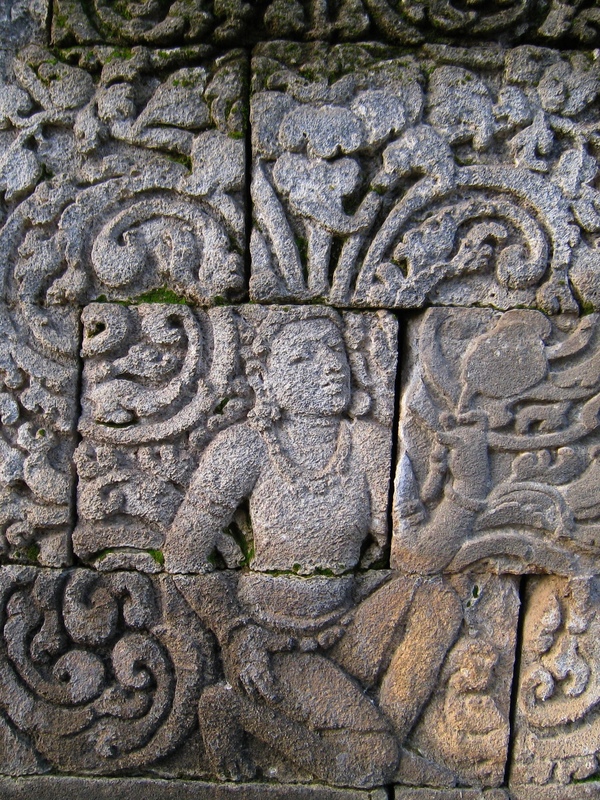 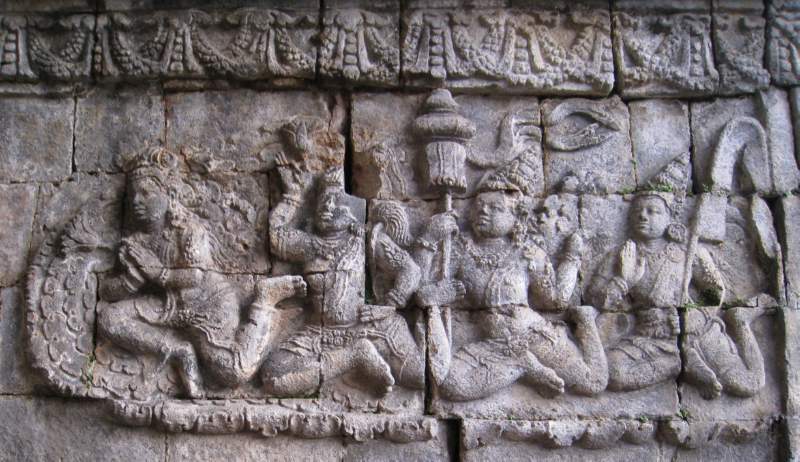 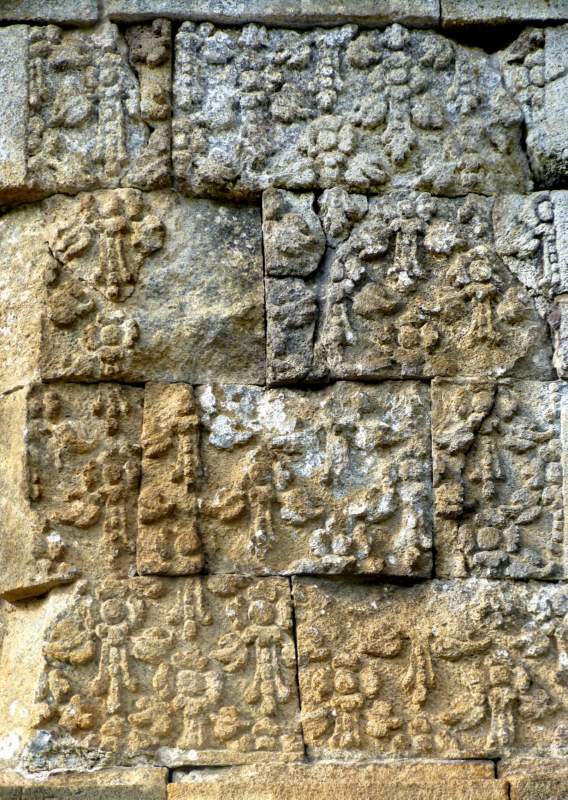 It would be necessary, in particular, to examine these bas-reliefs more closely with the help of ladders or a hanging stage, so that no detail could escape; and, this minute labour accomplished, it would still be necessary to verify by comparison with other Buddhist statues of Javanese origin whether there is not occasion to modify in some measure, for local reasons, the Indian attribution of these images. At that cost only could these too rapid identifications become reasonably certain.